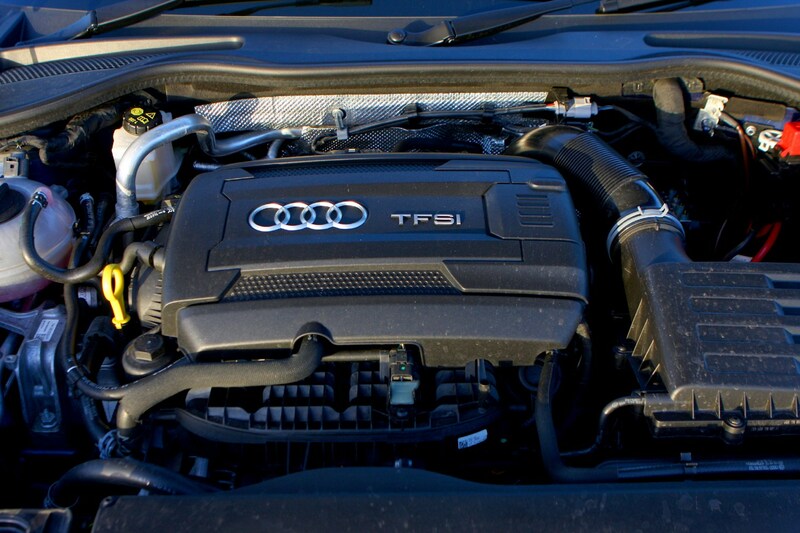 Insurance group: 32 - 43 How much is it to insure? 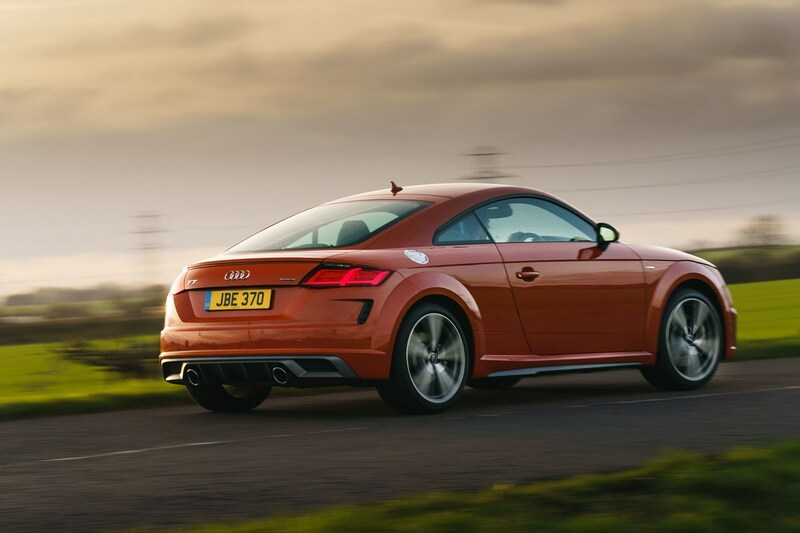 The third-generation Audi TT Coupe – launched in 2014 – had a lot to live up based on the sucess of the models that came before it. 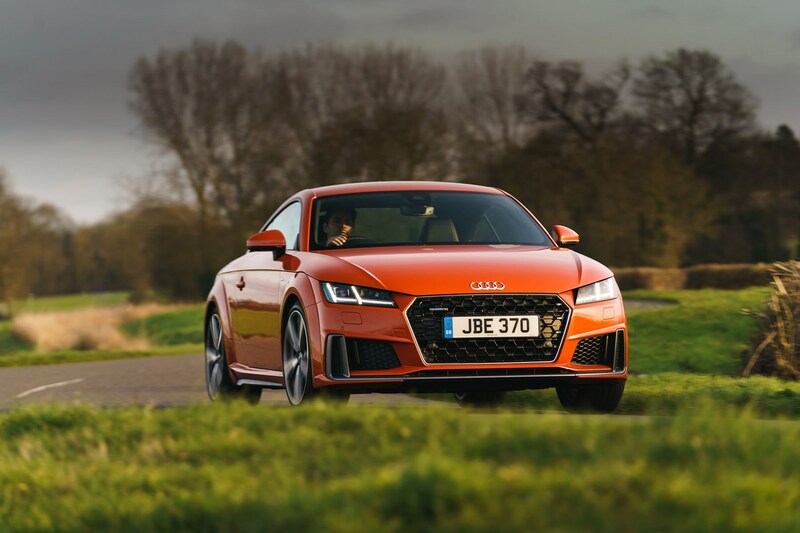 The first two models were sales smash hits, but Audi’s stuck to its winning formula, evolving the original car’s now-iconic look and blending it with its latest modern look - you'd even be hard-pushed to spot the facelifted model that was introduced in early 2019, as the tweaks made were so minimal. 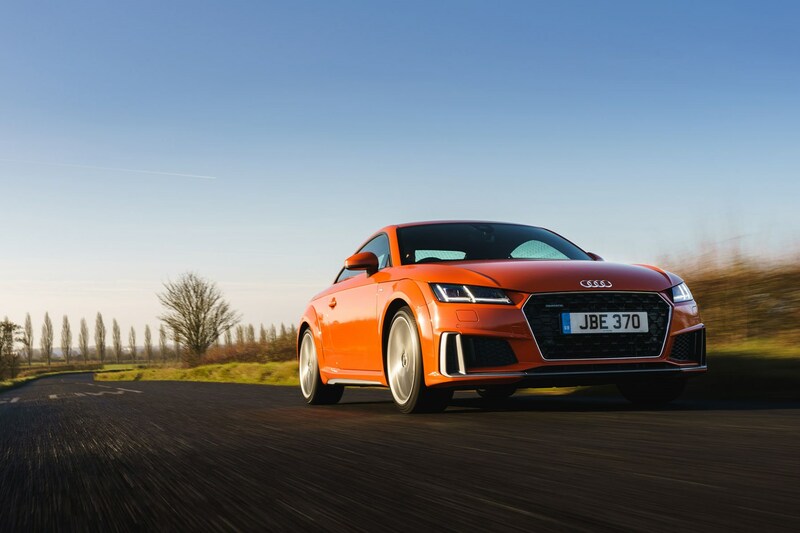 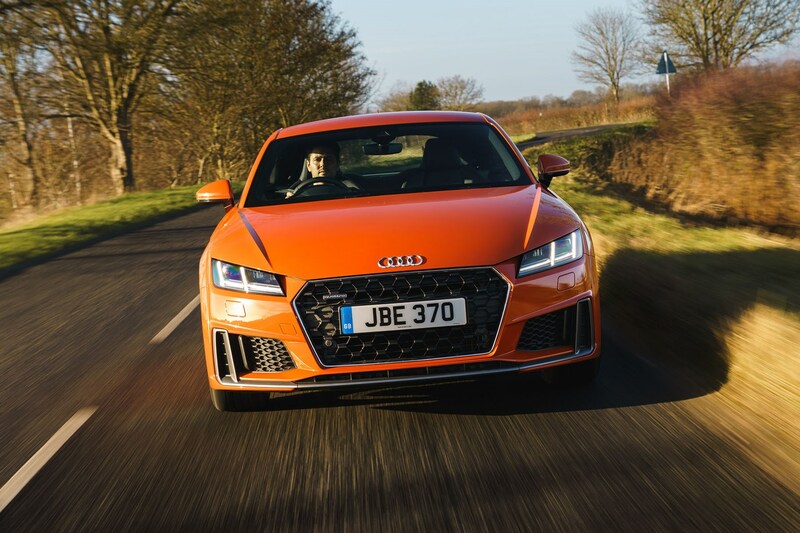 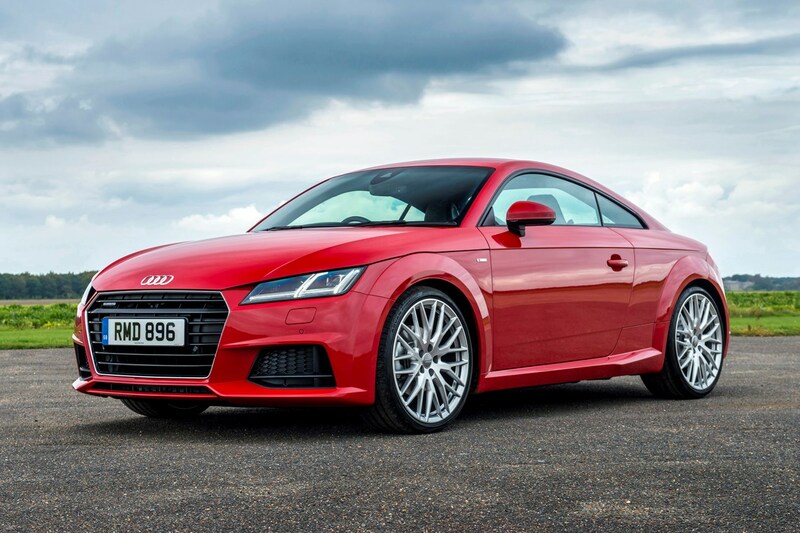 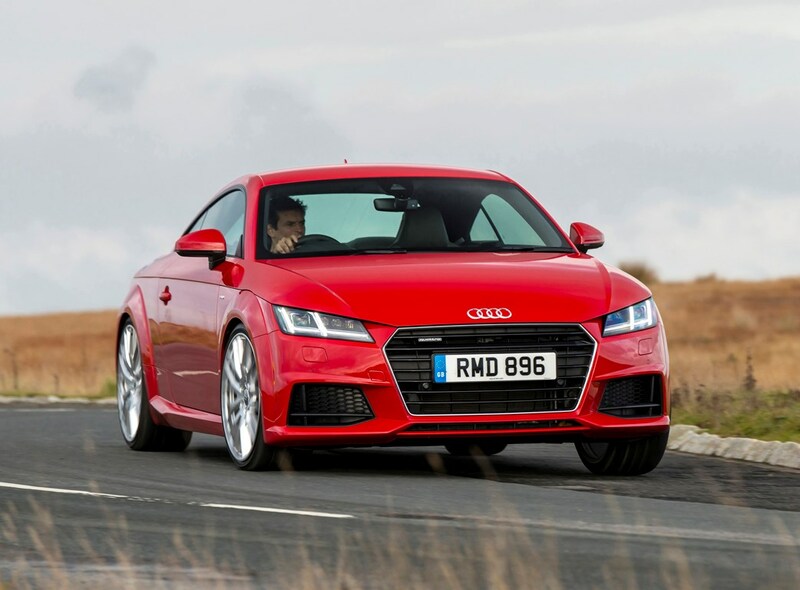 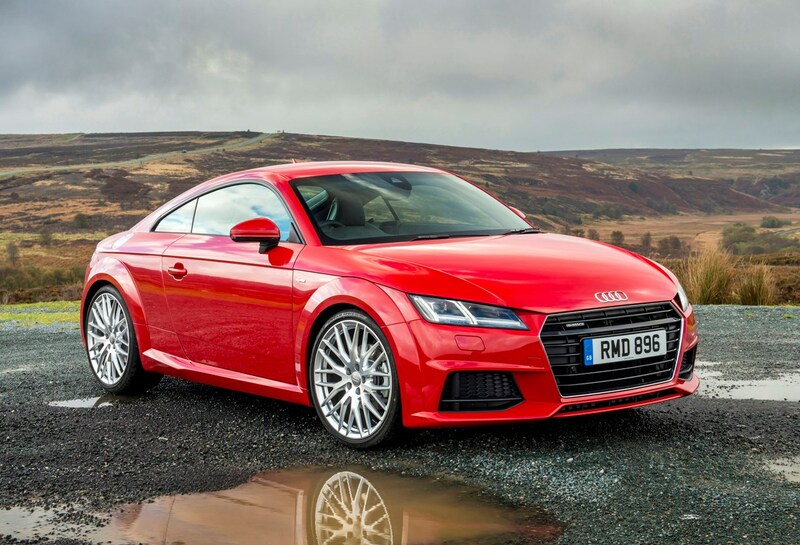 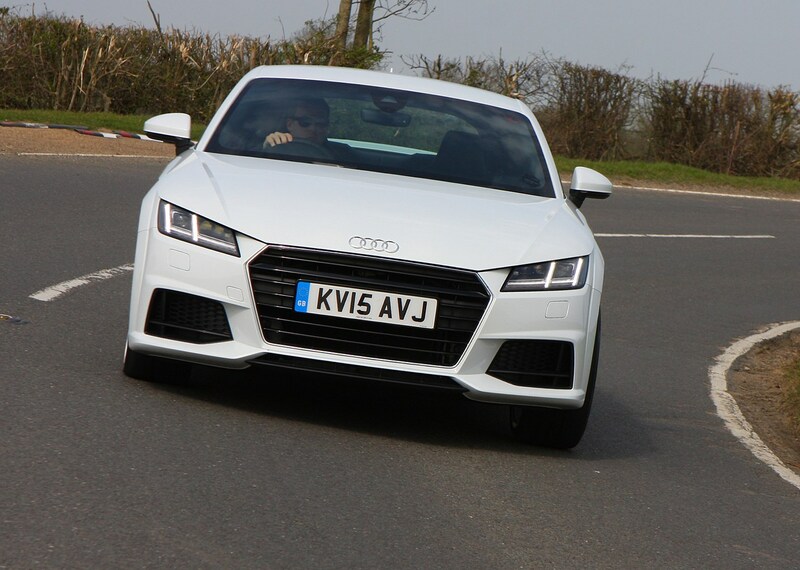 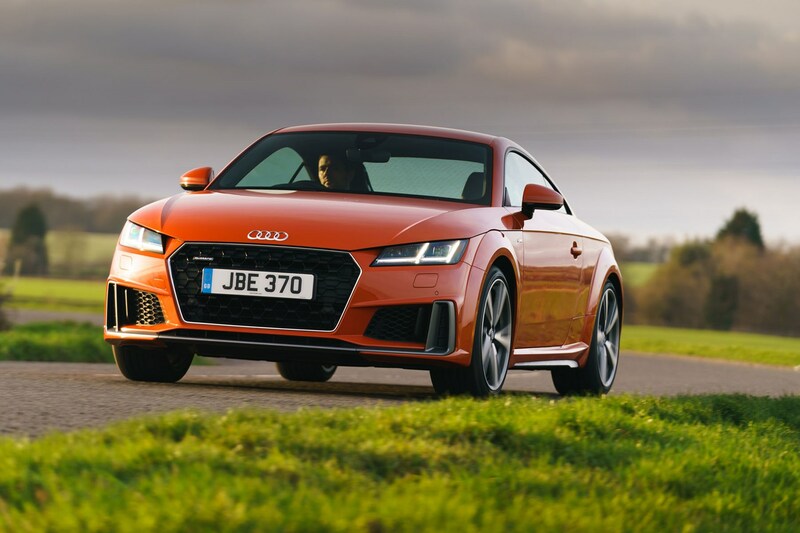 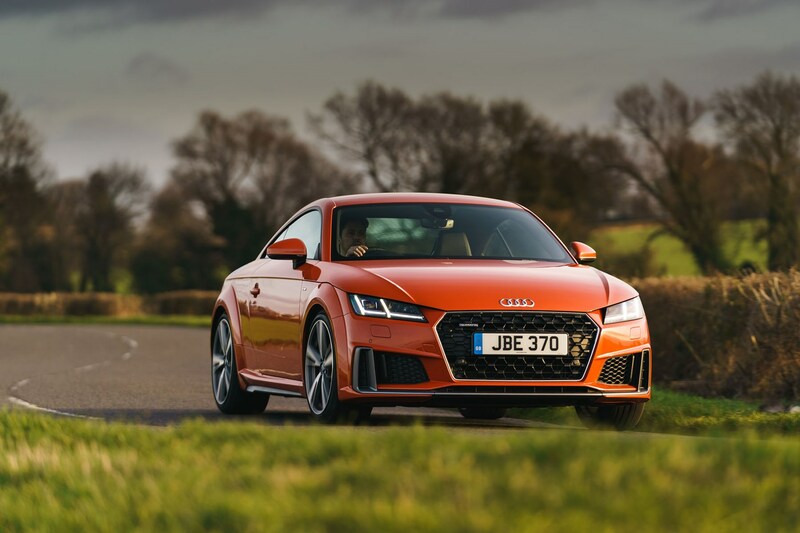 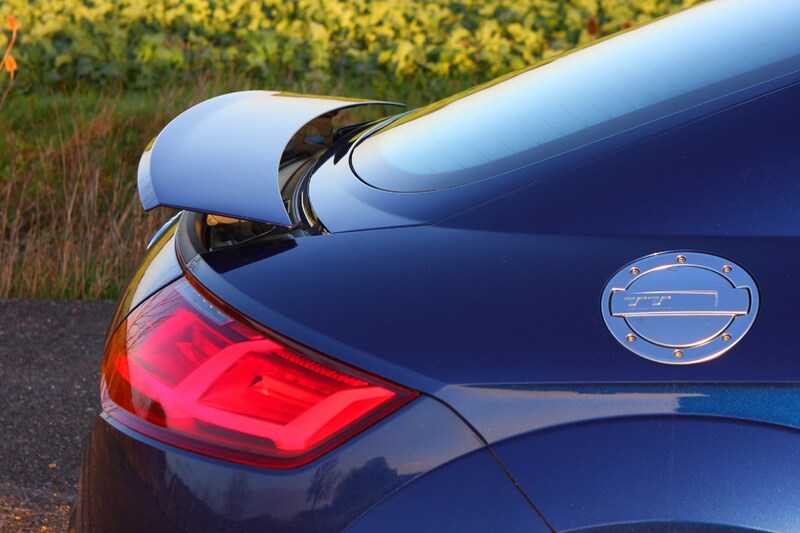 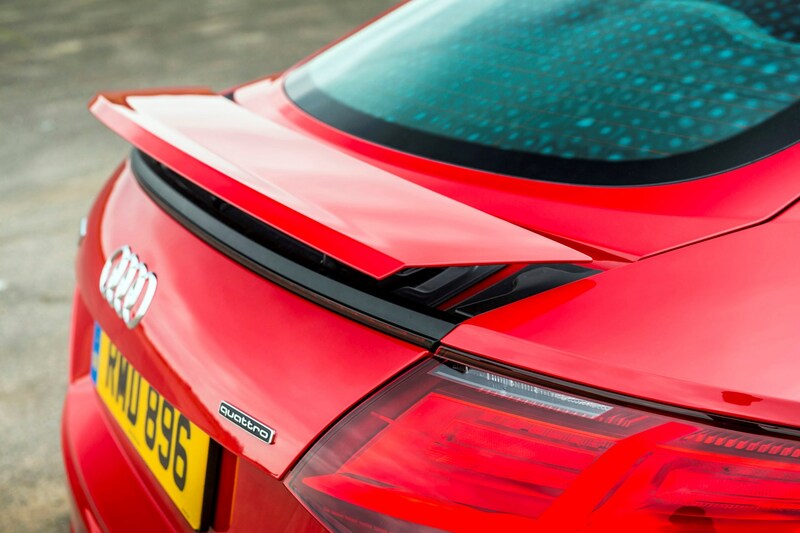 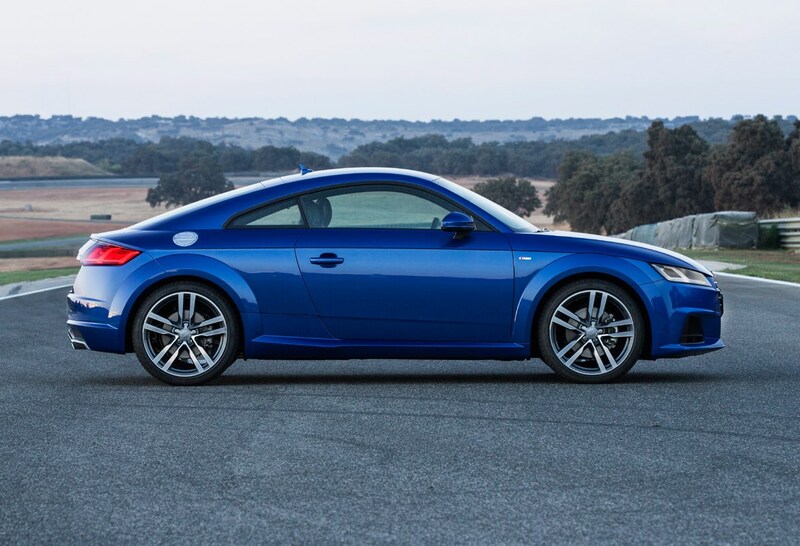 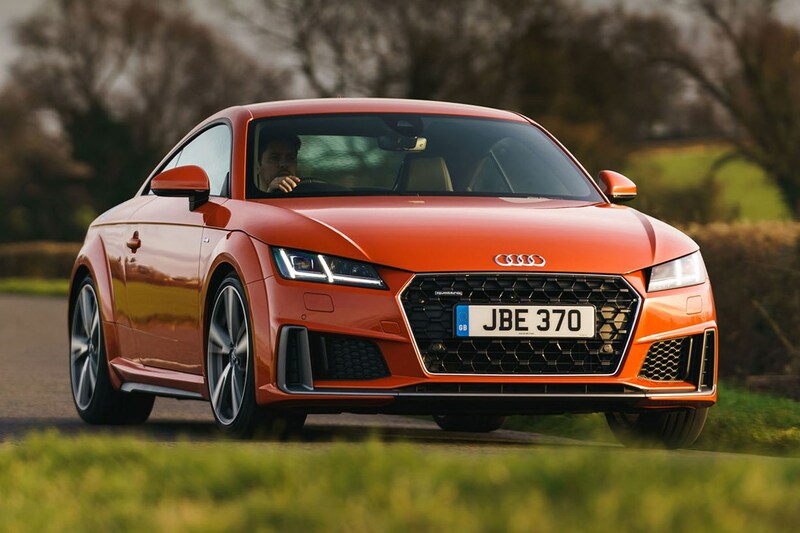 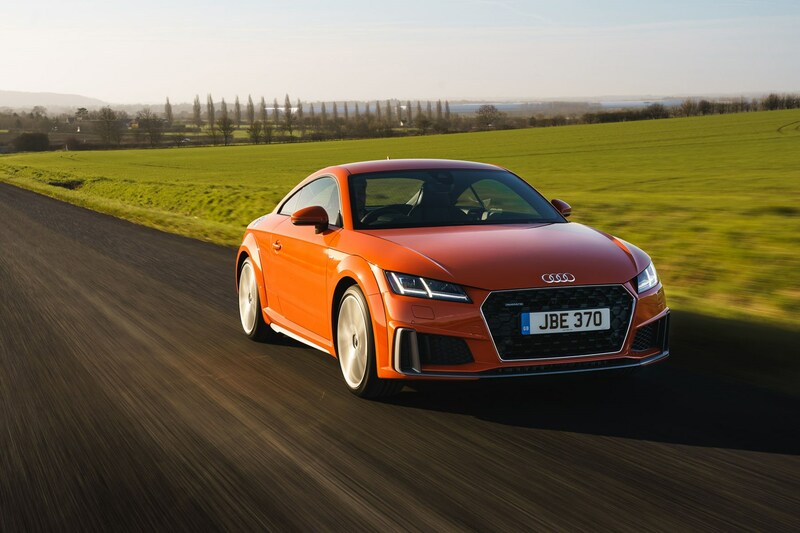 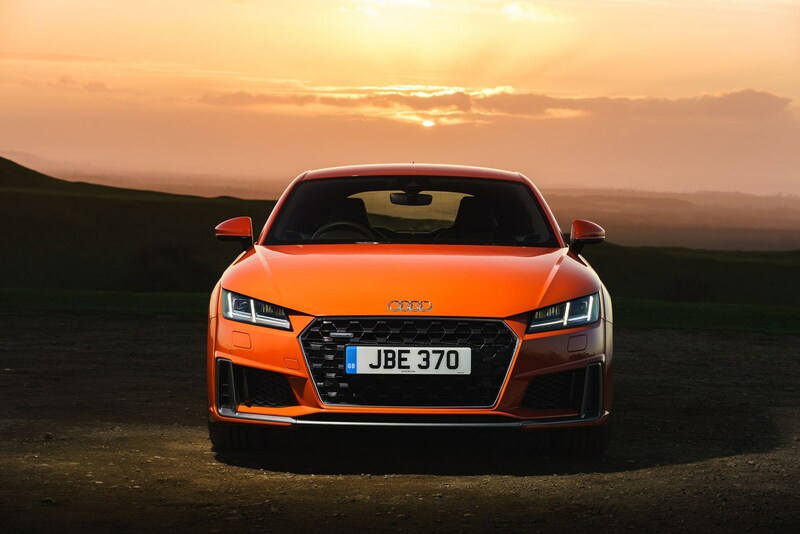 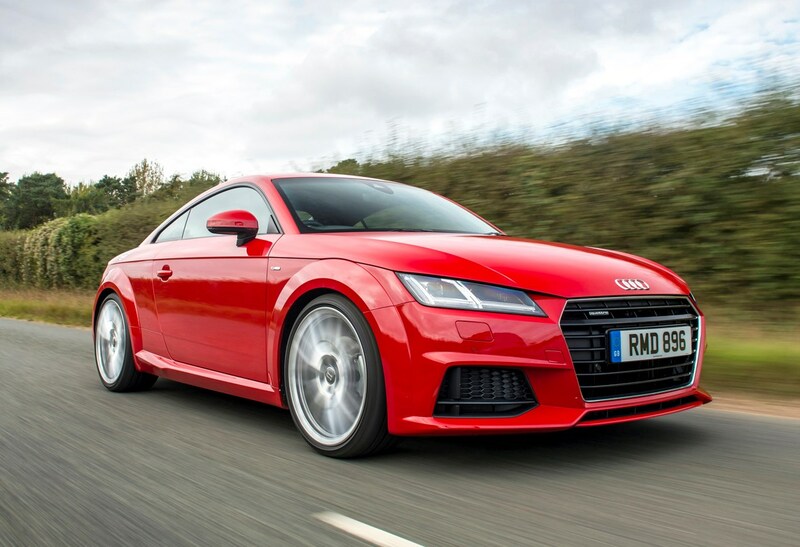 But with strong competition from the BMW 2 Series and Porsche Cayman, Nissan 370Z and Toyota GT86, the TT has a tough job on its hand, but Audi has done a brilliant job creating a desirable coupe that feels exclusive, modern, good to drive and usable every day. 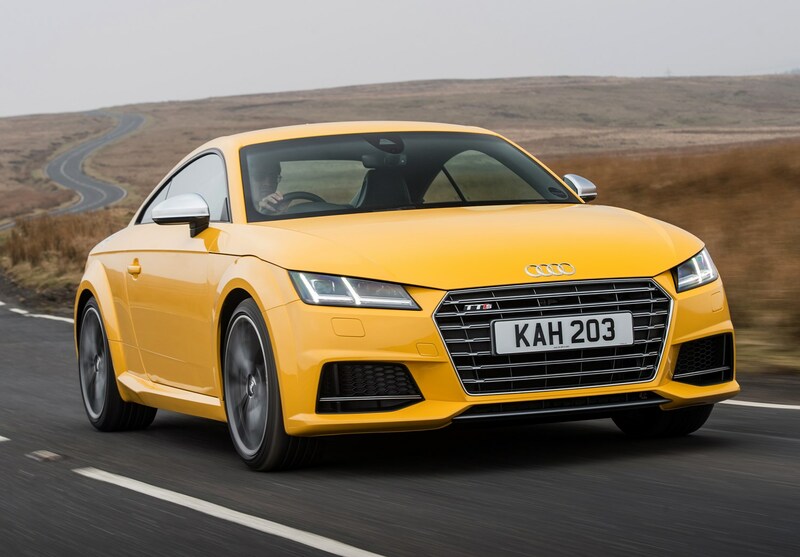 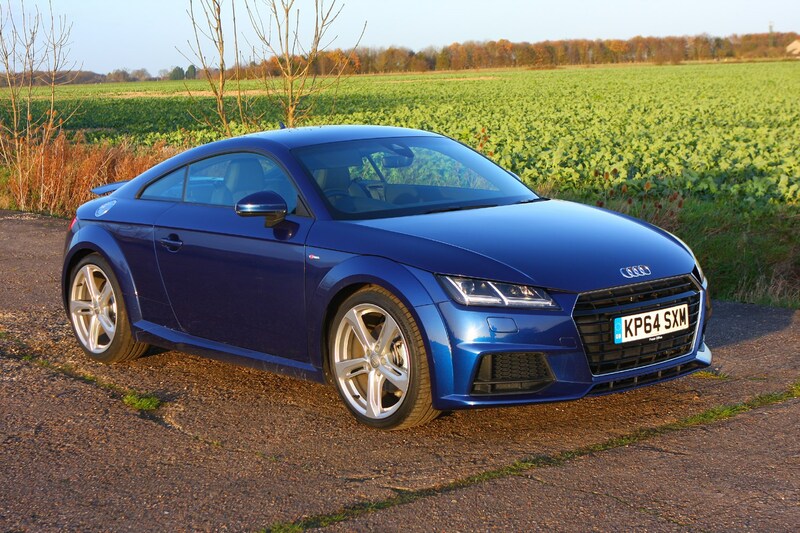 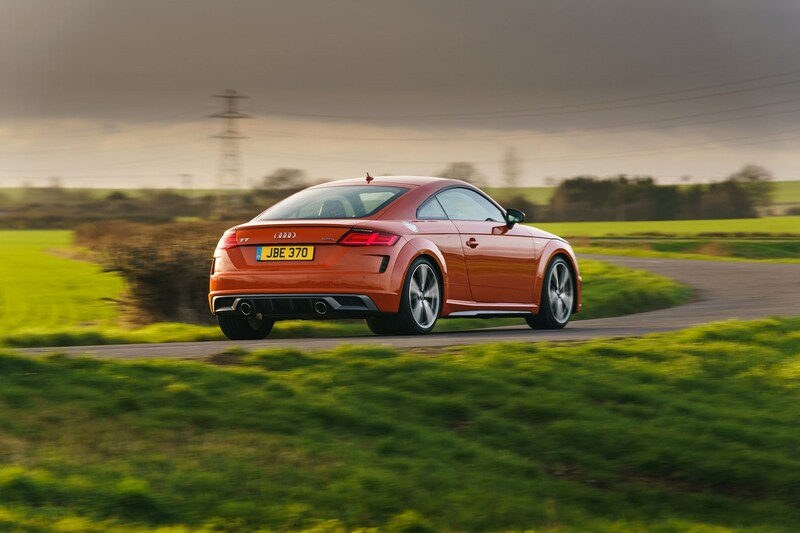 With high-performance models like the TT S and TT RS available, the performance side of the TT is covered (the TT RS is almost as fast as an R8), but you can also get a sensible 2.0 TDI diesel if you desire (but this will only be if you're buying a used Audi TT. 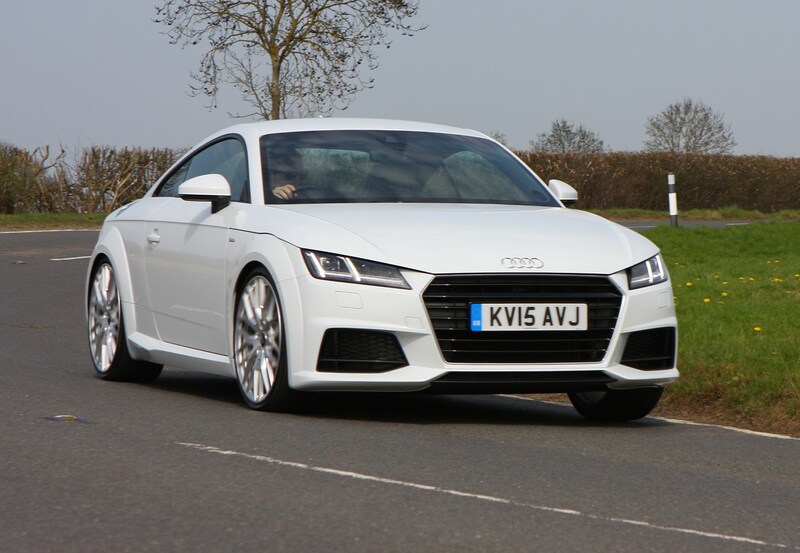 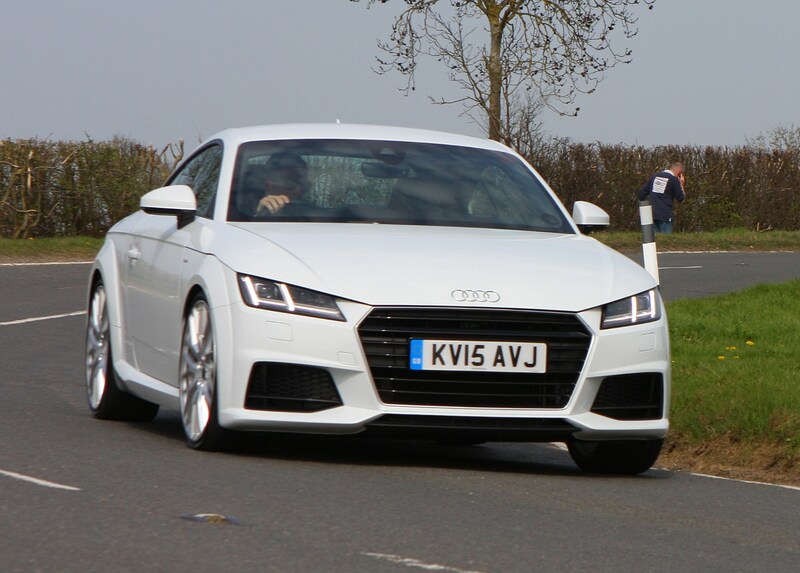 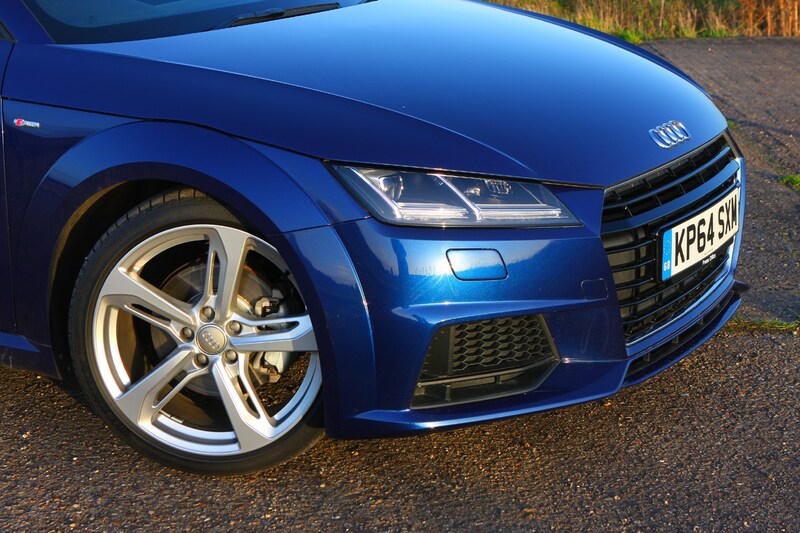 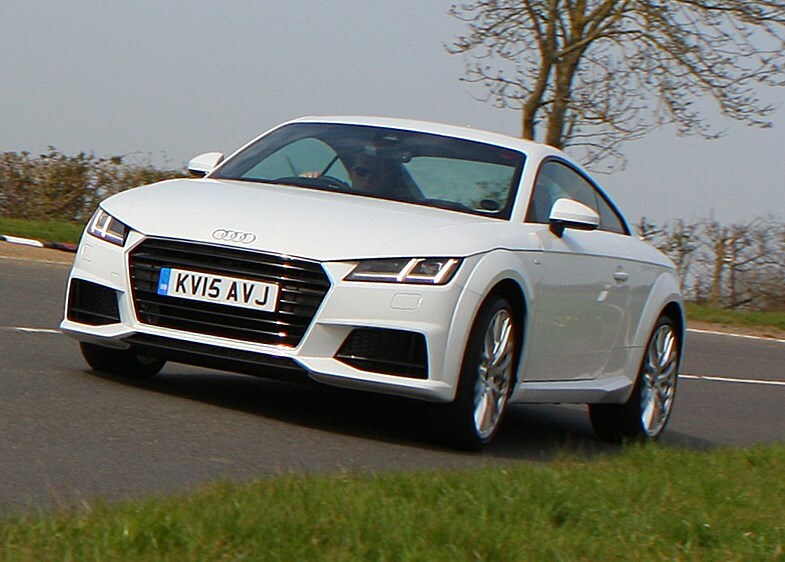 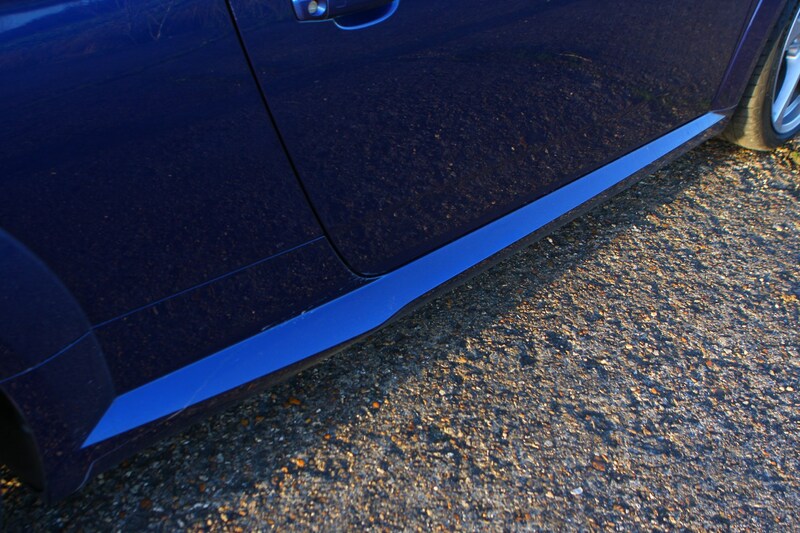 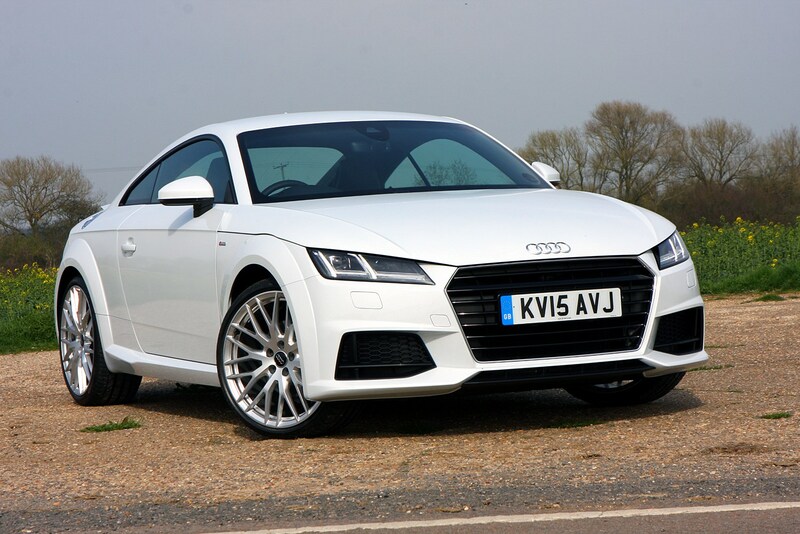 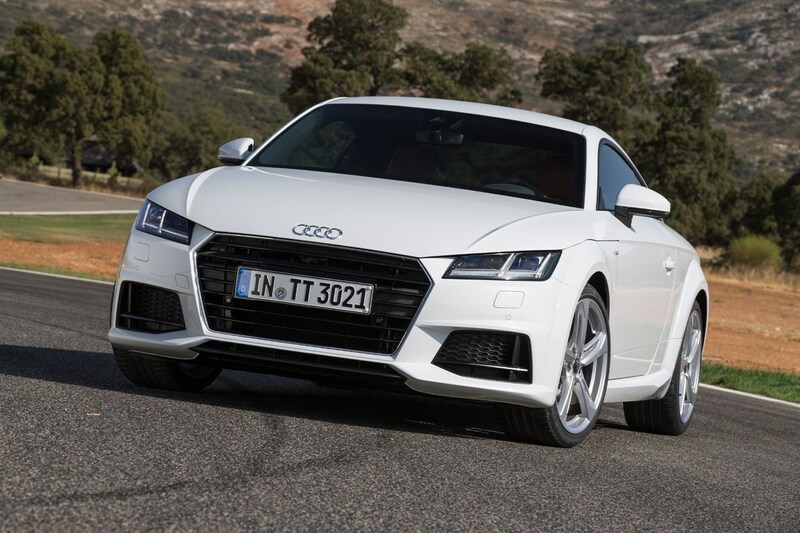 The TT’s exterior styling mixes elements of the Mk1 and Mk2 and at first glance it’s unmistakably a TT. 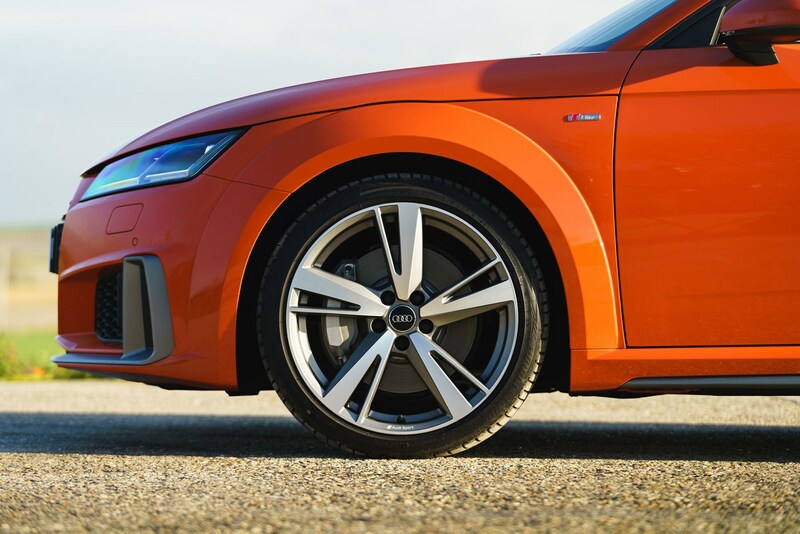 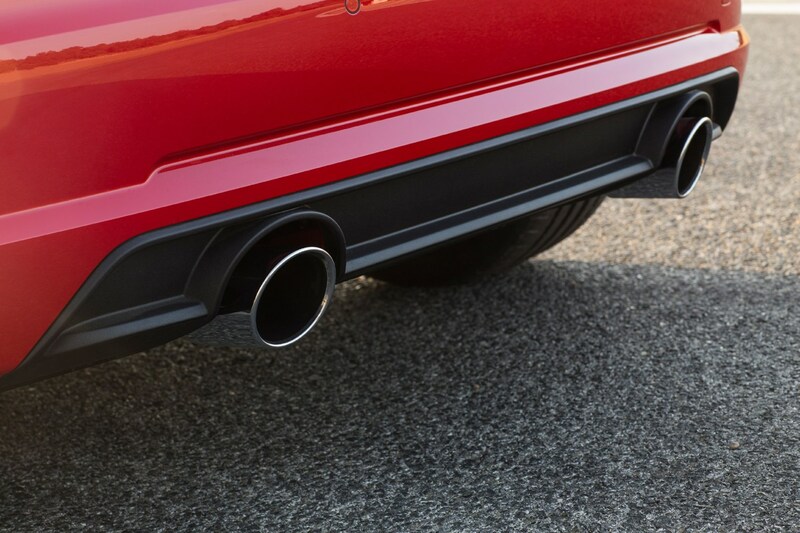 The wheelbase (the distance between the front and rear wheels) has grown slightly (it shares a platform with everything from the Volkswagen Golf to the SEAT Ateca) but the car’s overall length remains the same as the previous car, making for super-short front and rear overhangs. 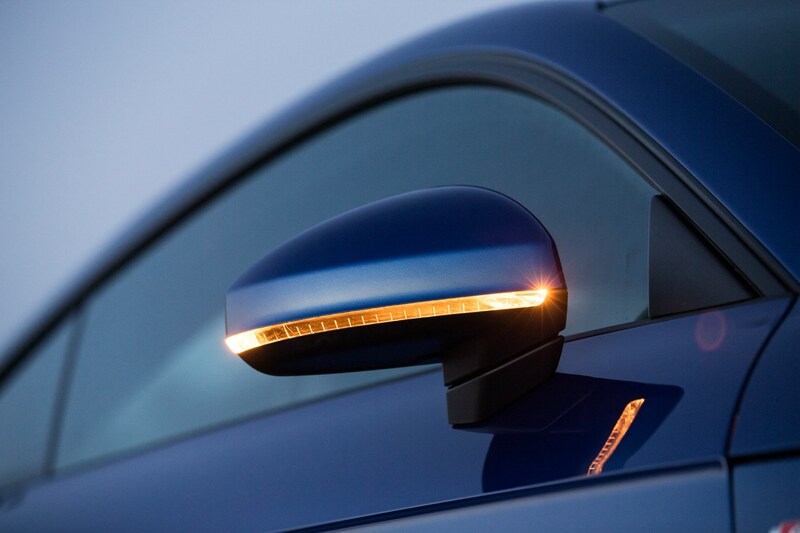 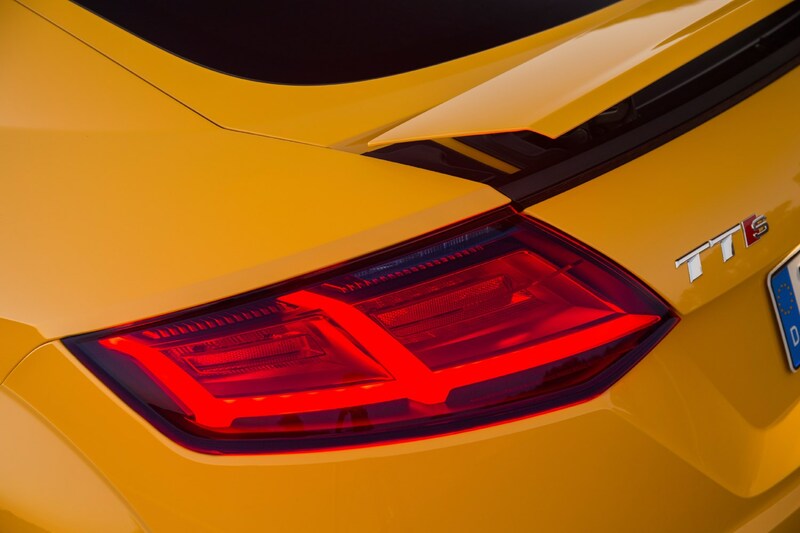 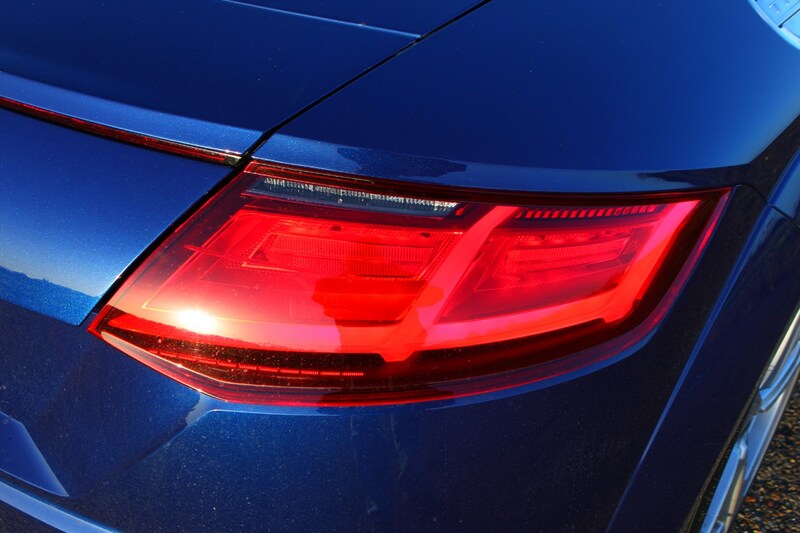 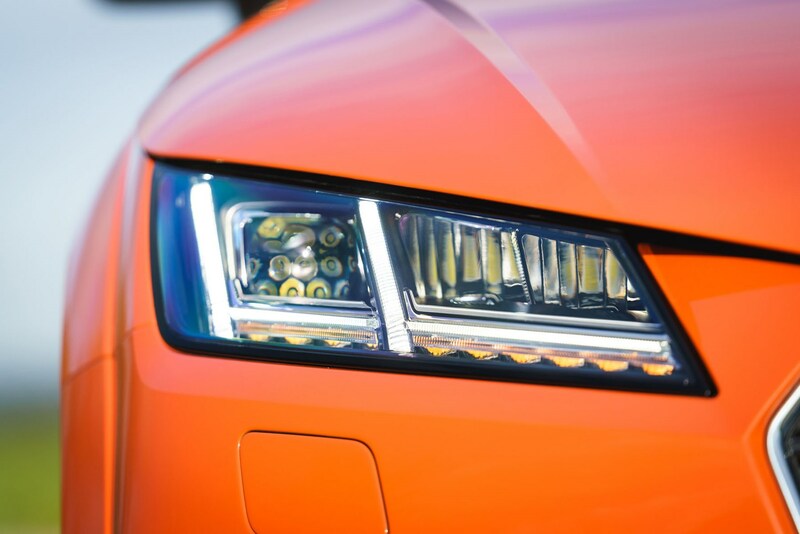 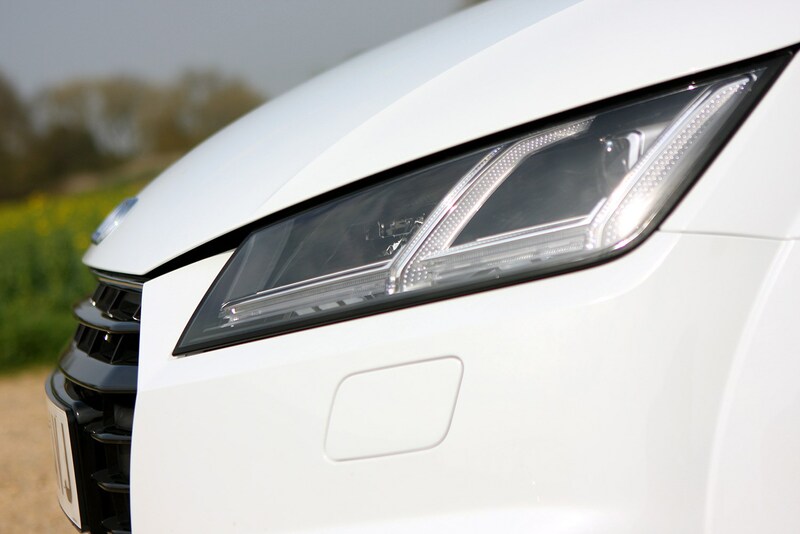 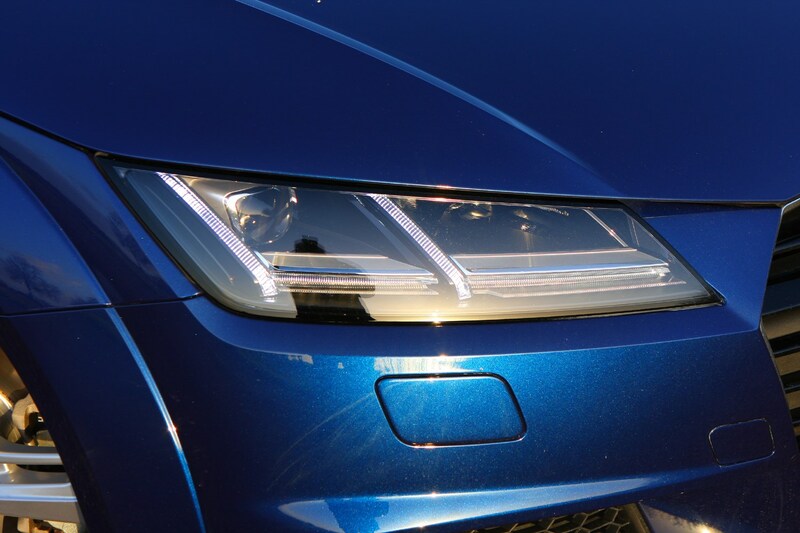 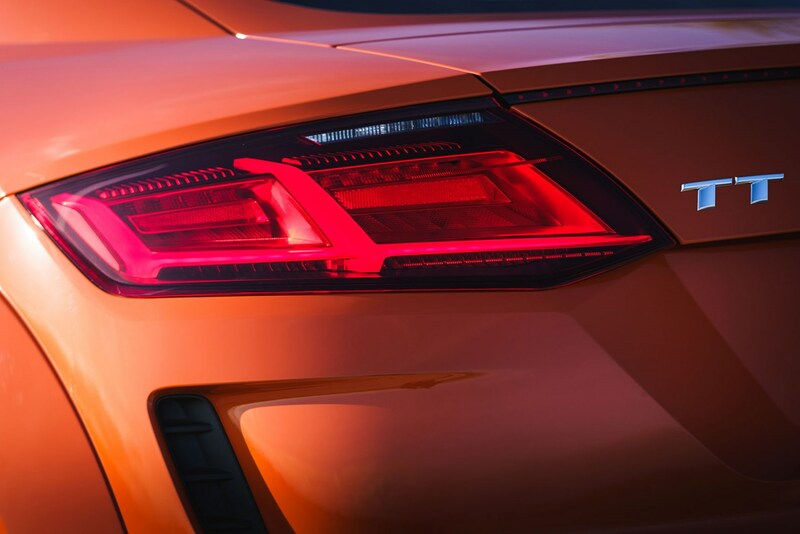 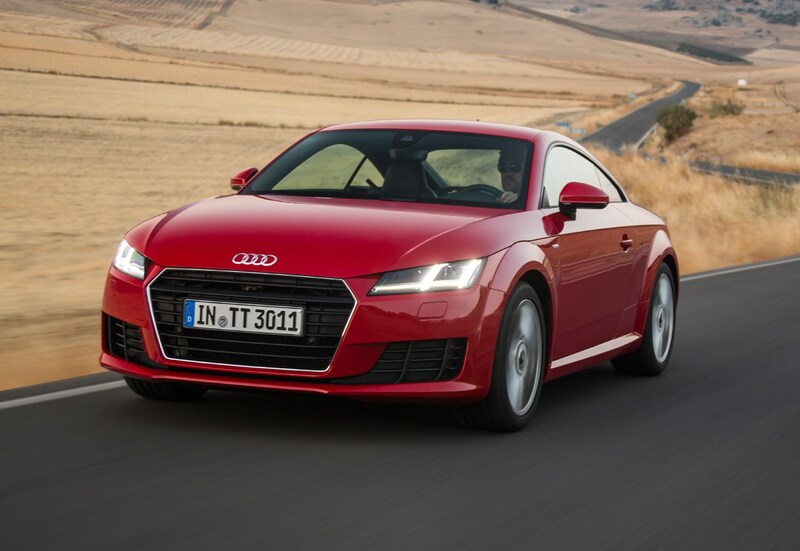 The TT wears modern-looking LED headlights and taillights with some neat touches including directional indicators that swipe across the tail-lights rather than wink on and off – a feature that has become something of an Audi hallmark. 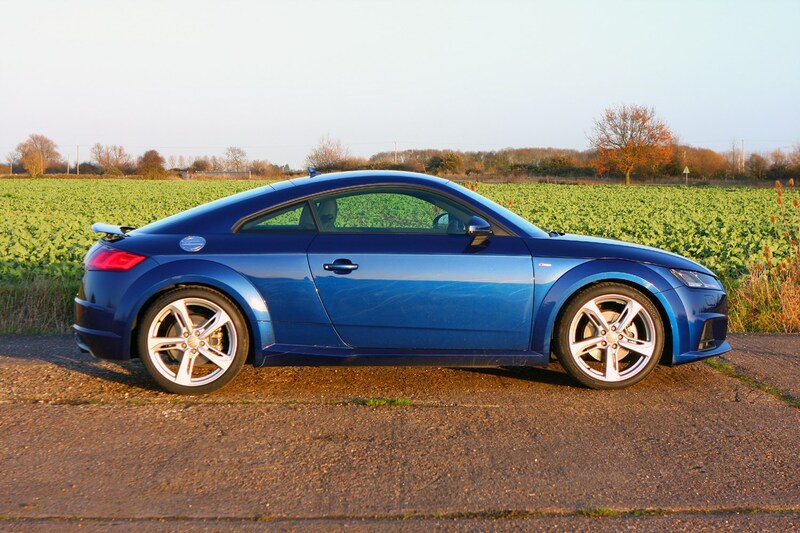 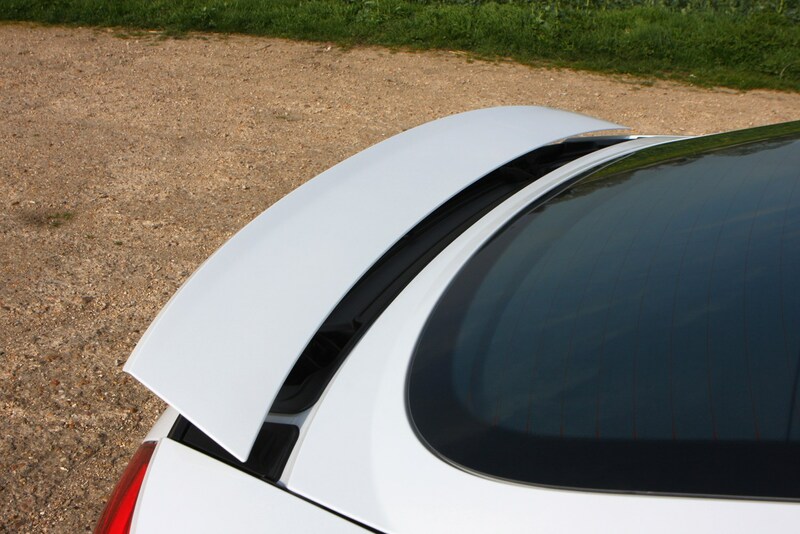 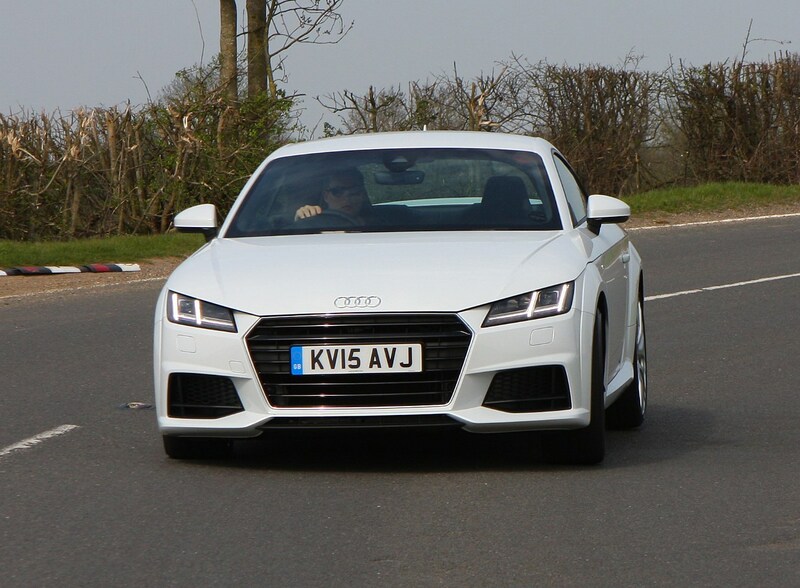 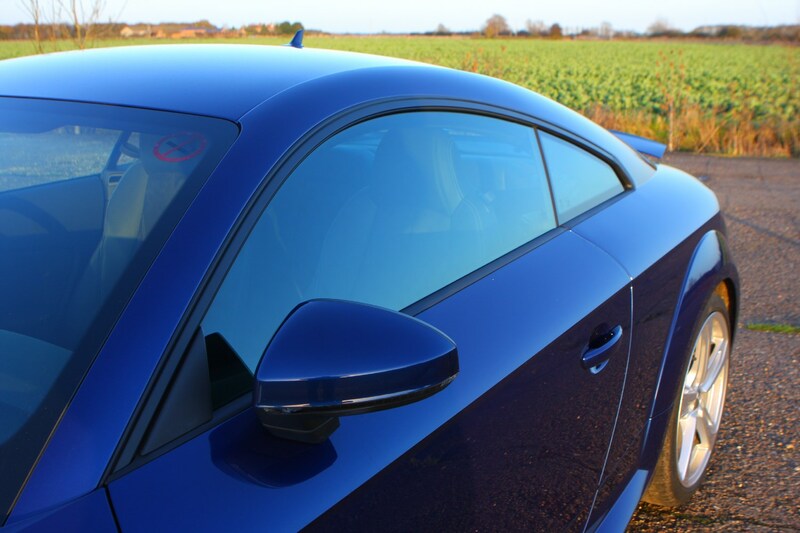 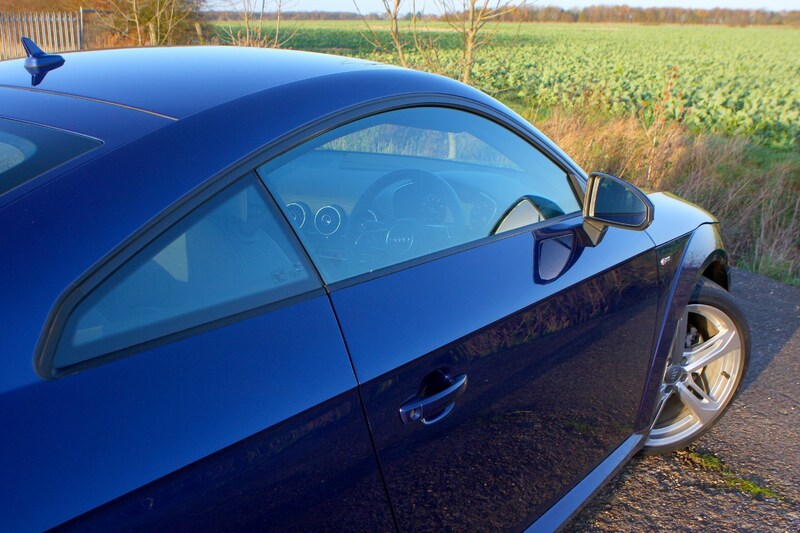 The TT Coupe is technically a four-seater (a 2+2), with a pair of tiny seats under the rear window that are best suited to kids only – adults will really struggle to even get in the seats, let alone sit comfortably in them (there's even a sticker warning not to bash passengers' heads with the bootlid). 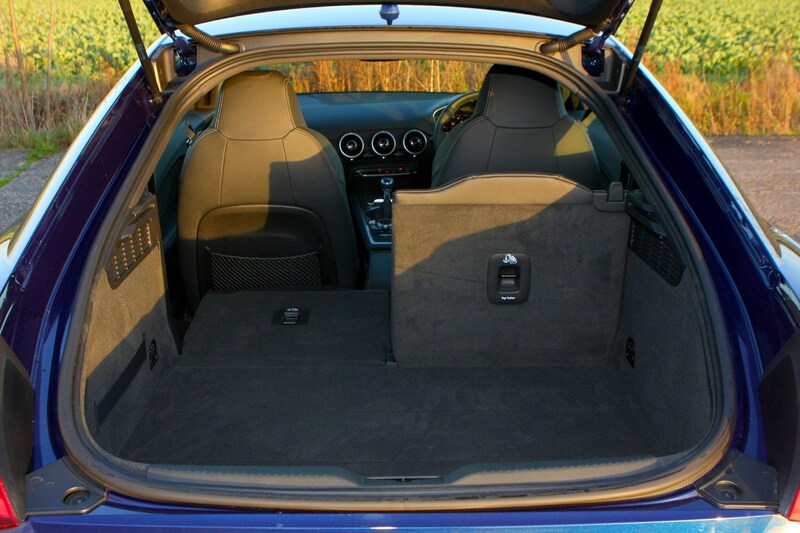 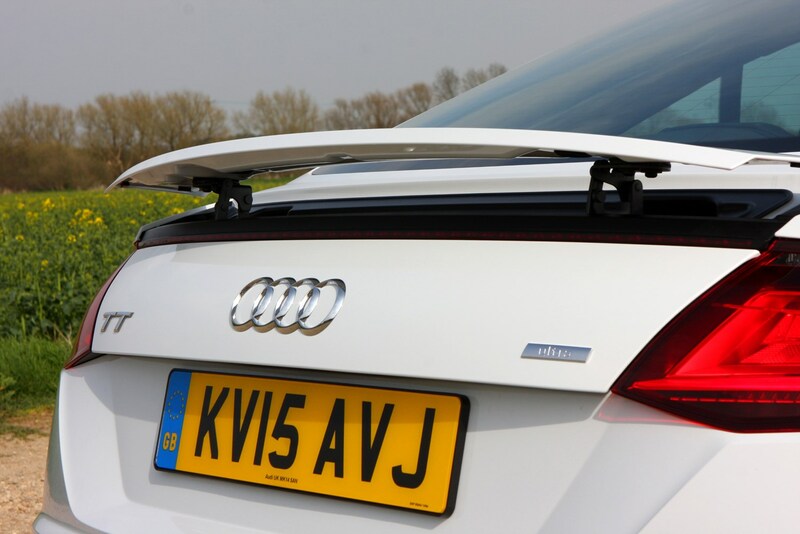 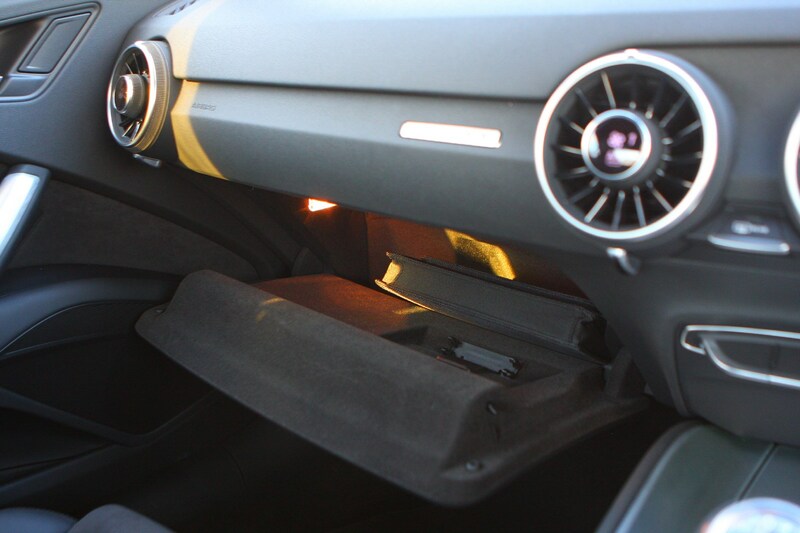 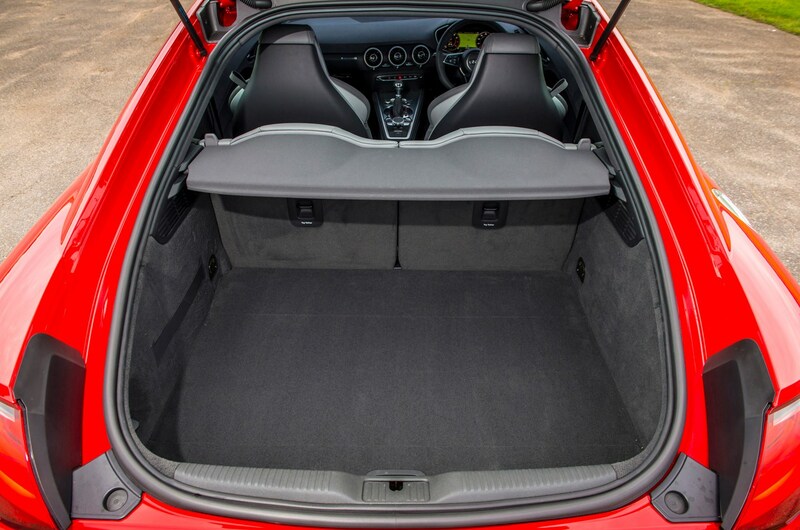 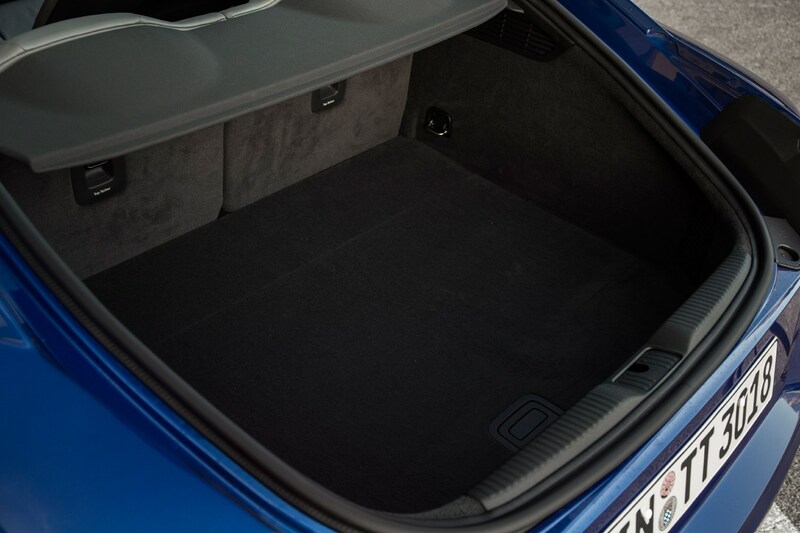 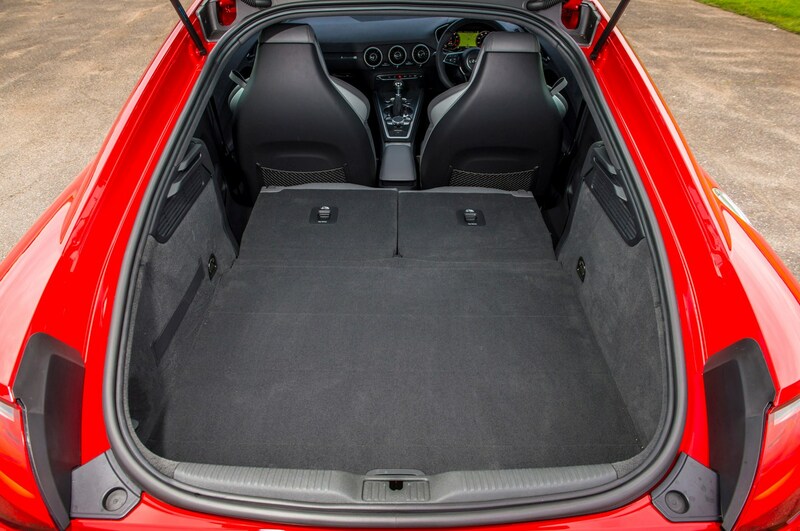 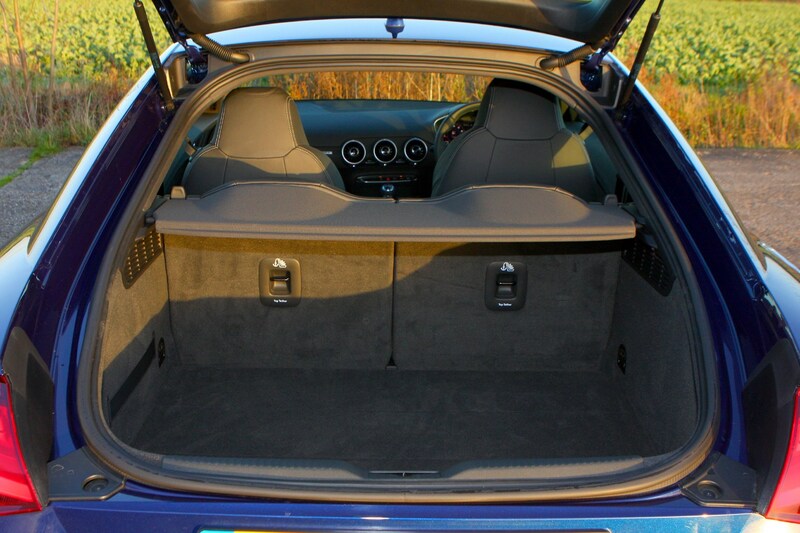 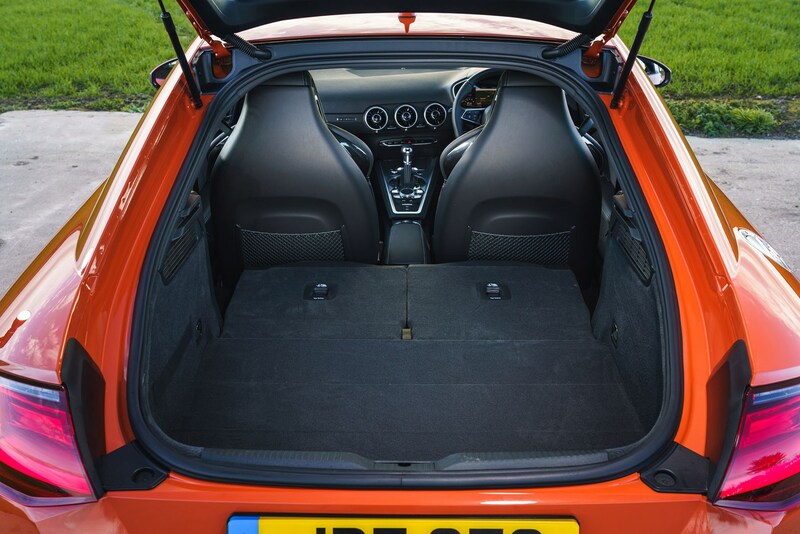 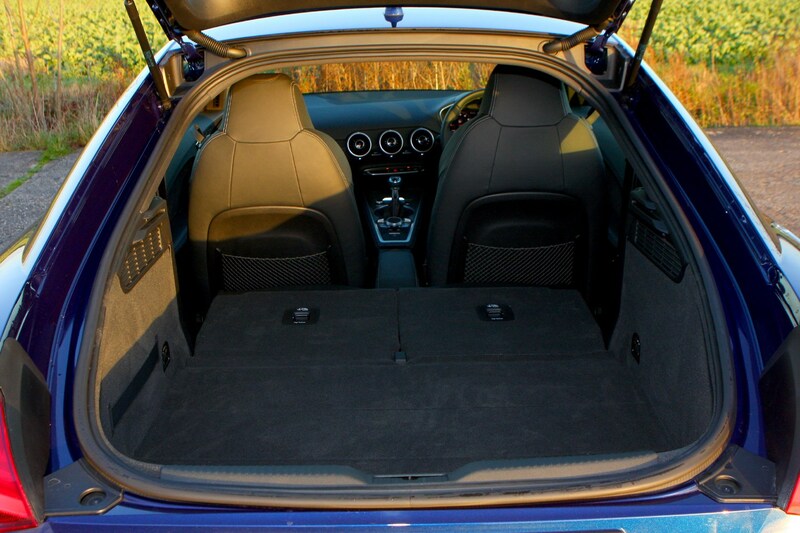 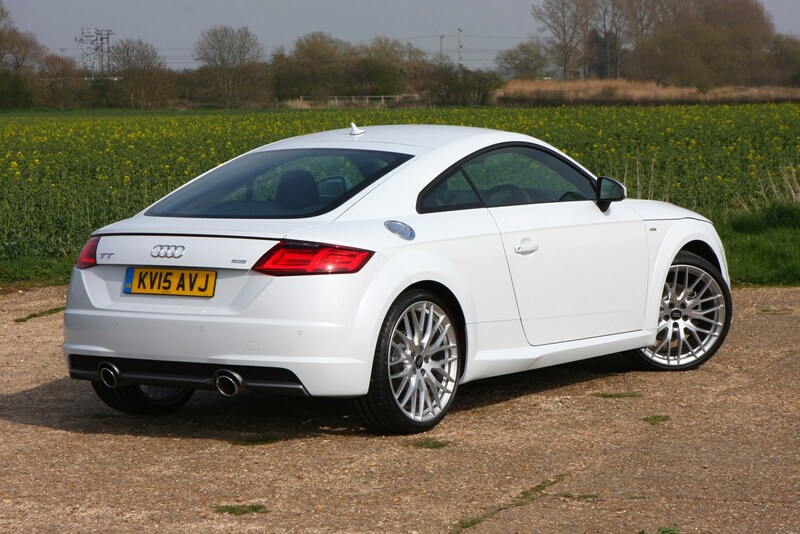 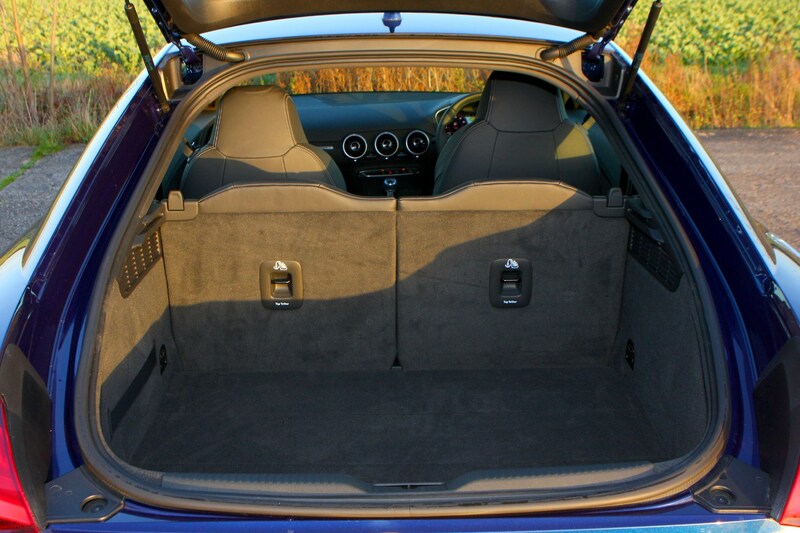 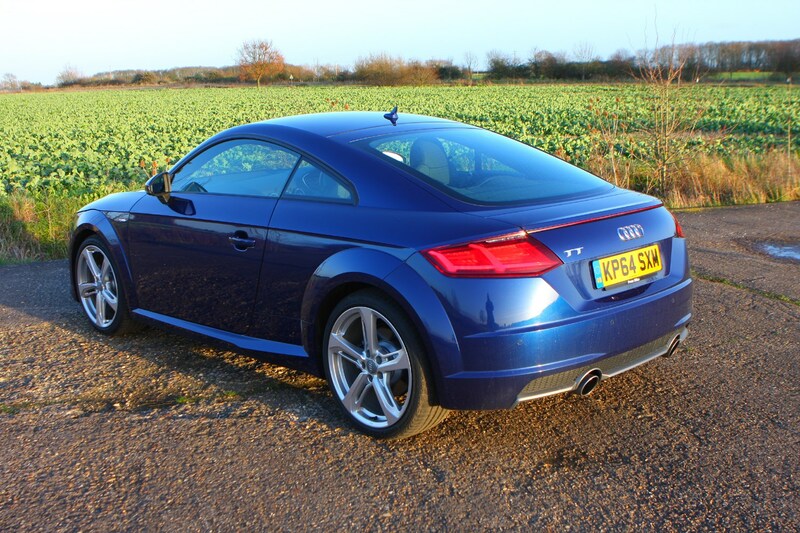 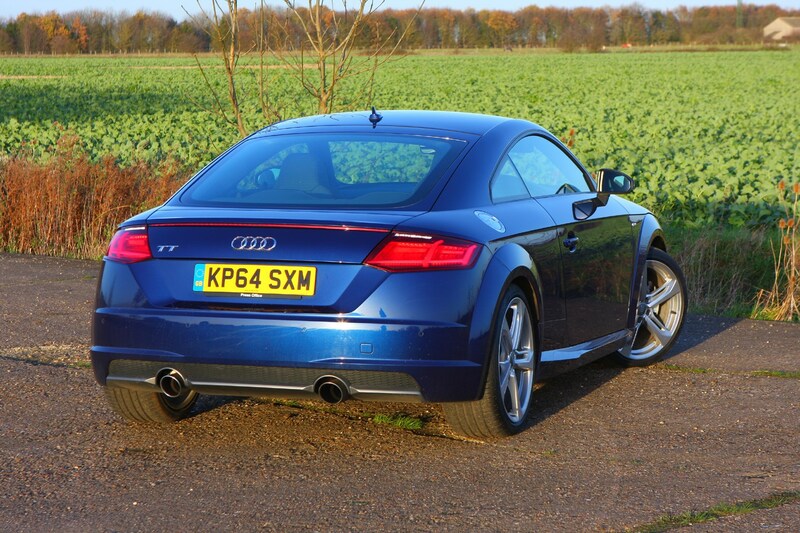 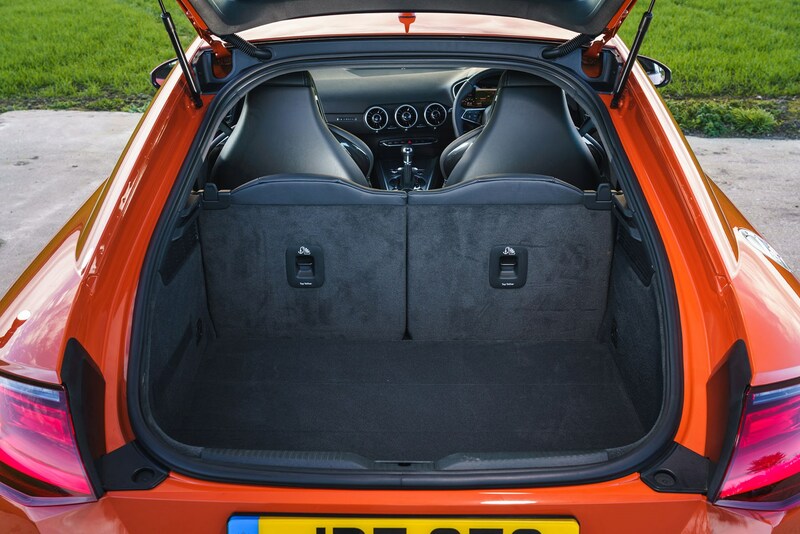 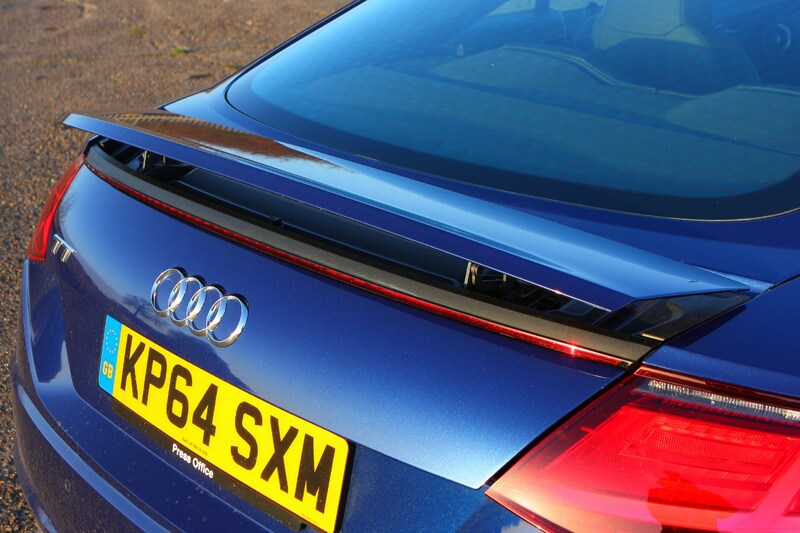 However, the boot is surprisingly big and those rear seats fold completely flat, making the TT unexpectedly practical. 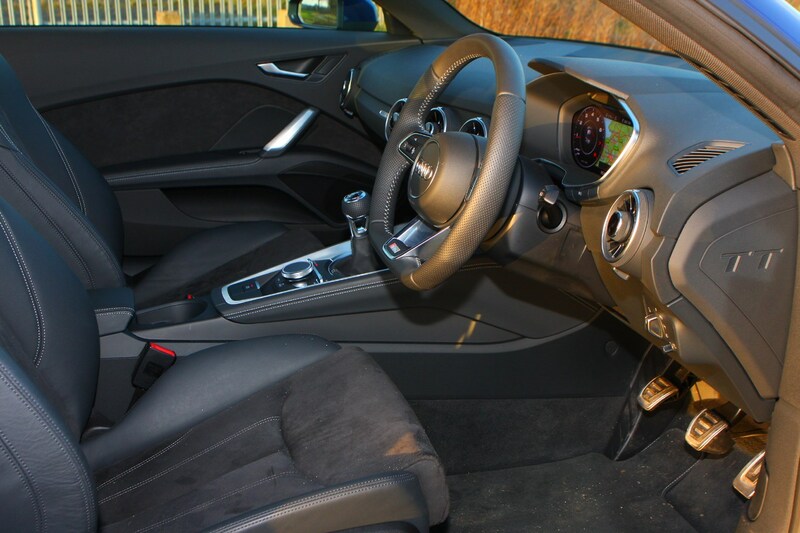 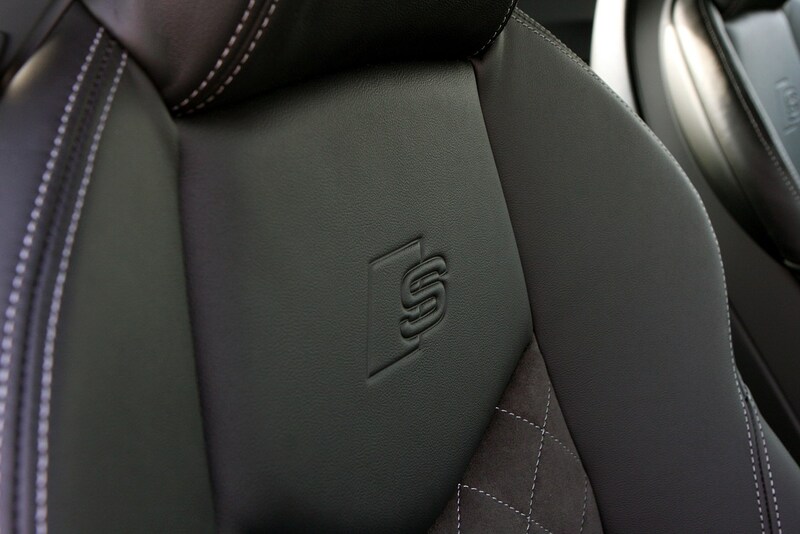 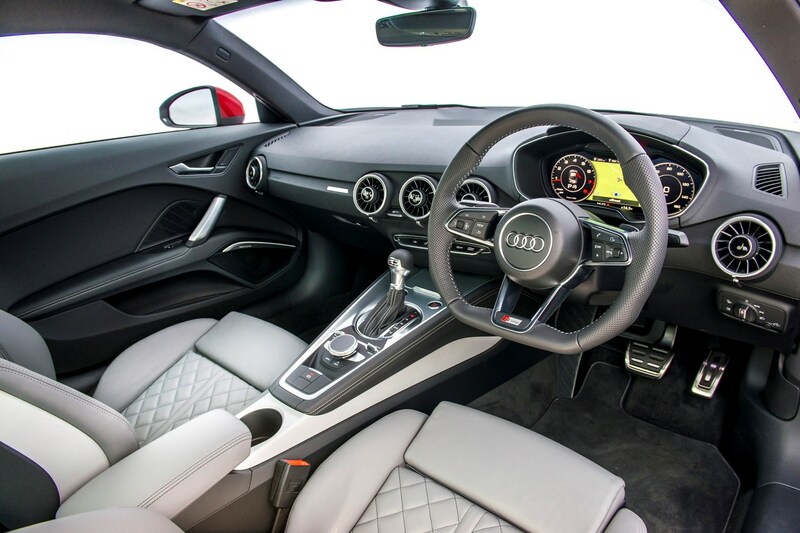 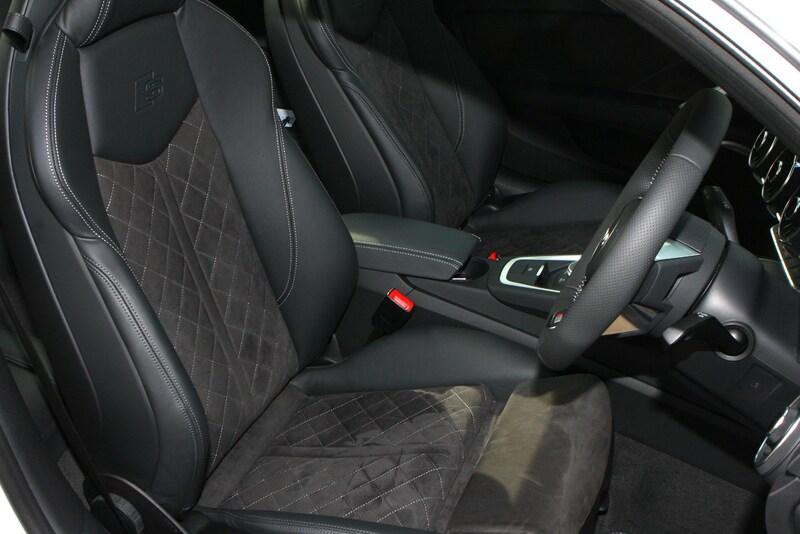 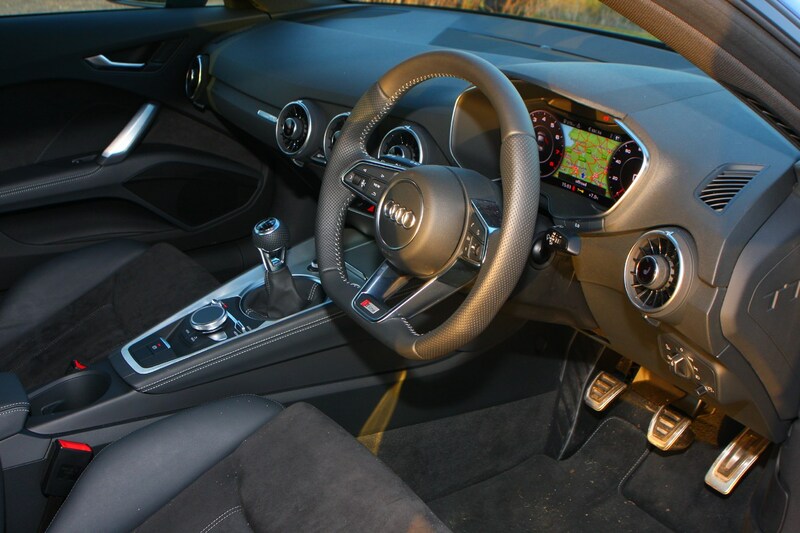 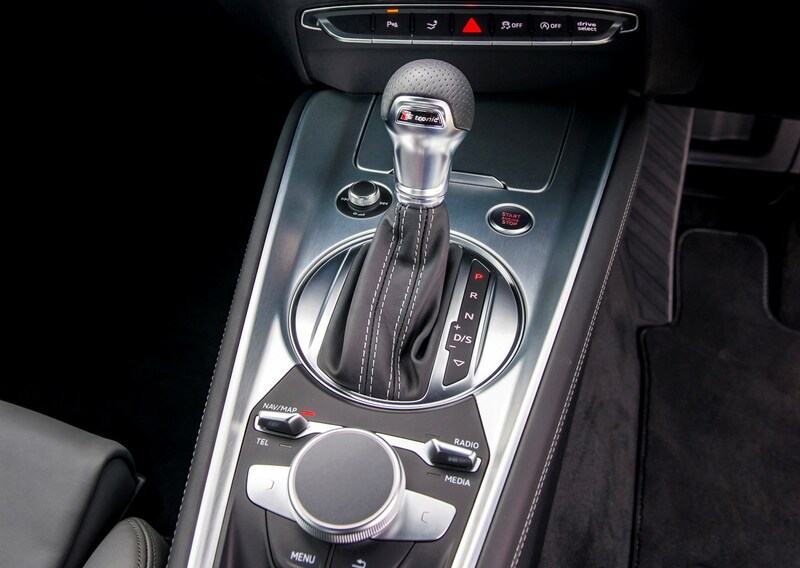 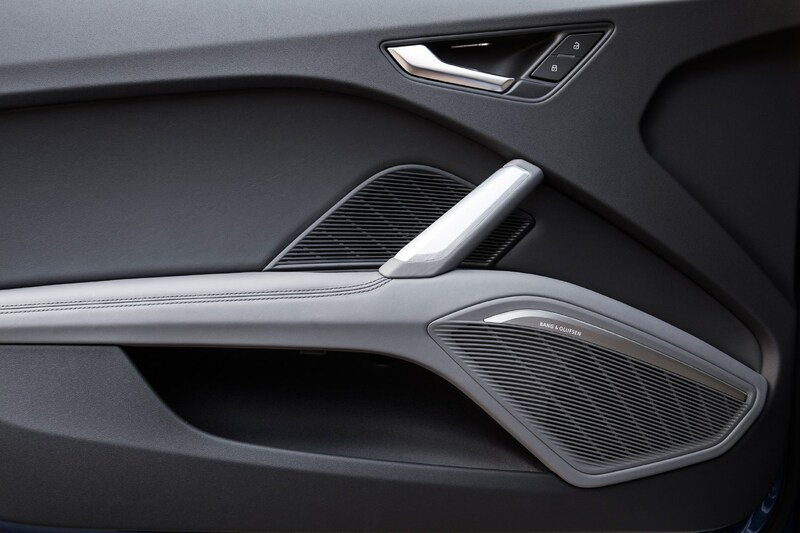 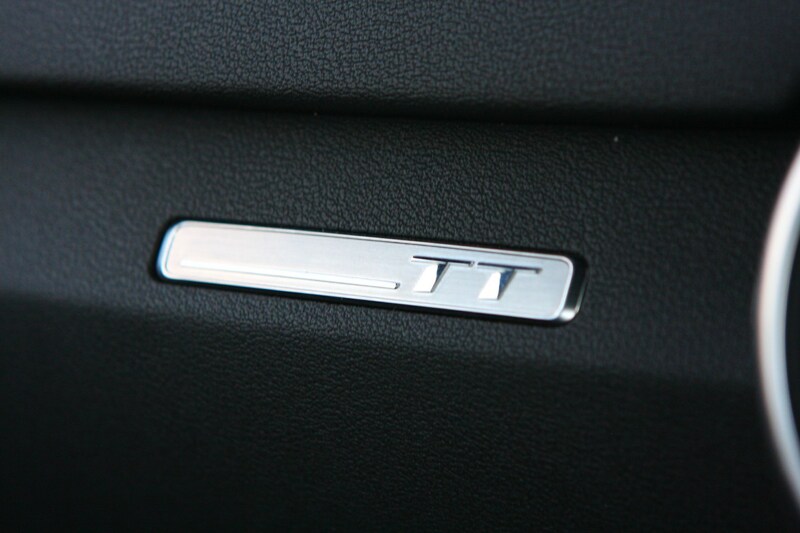 One of the TT’s most appealing features is its modern, minimalist interior that’s packed with technology. 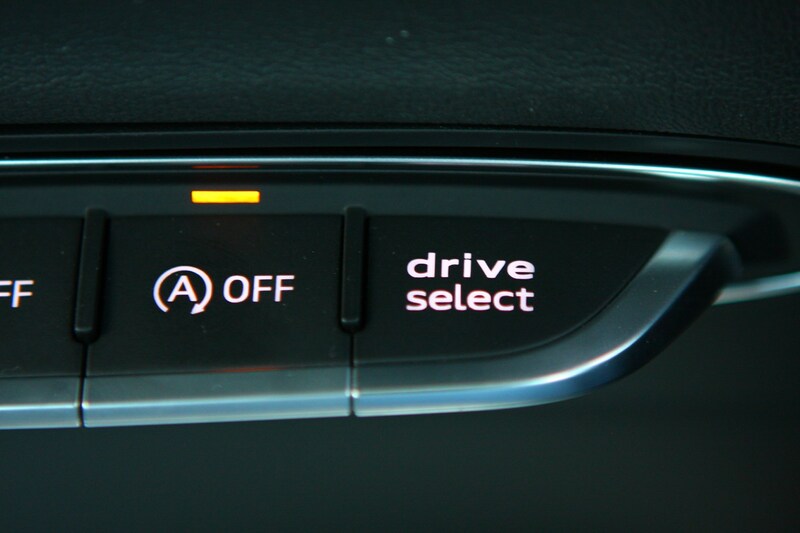 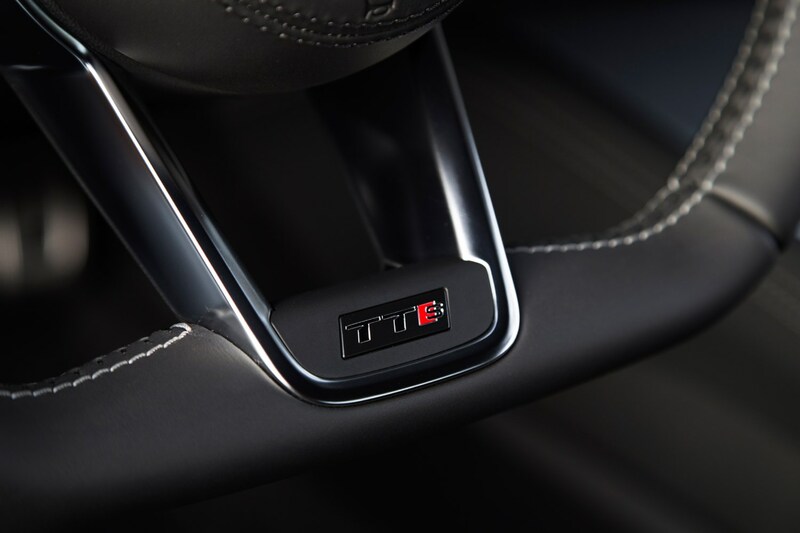 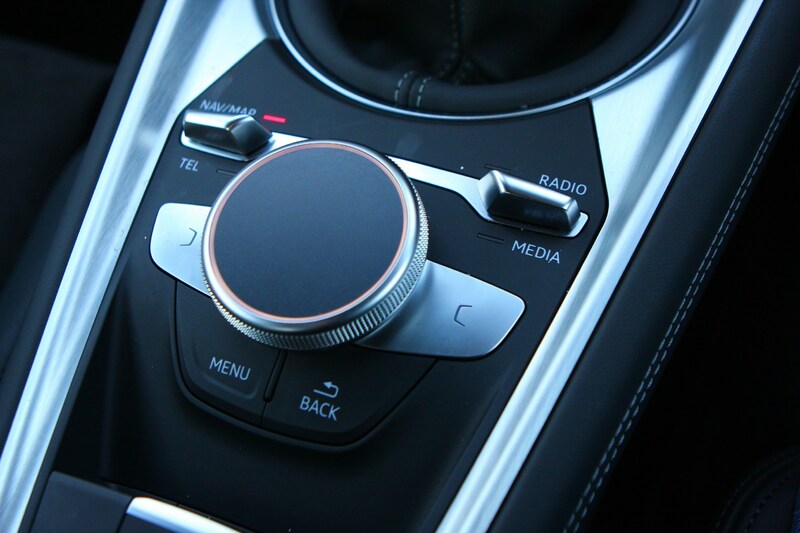 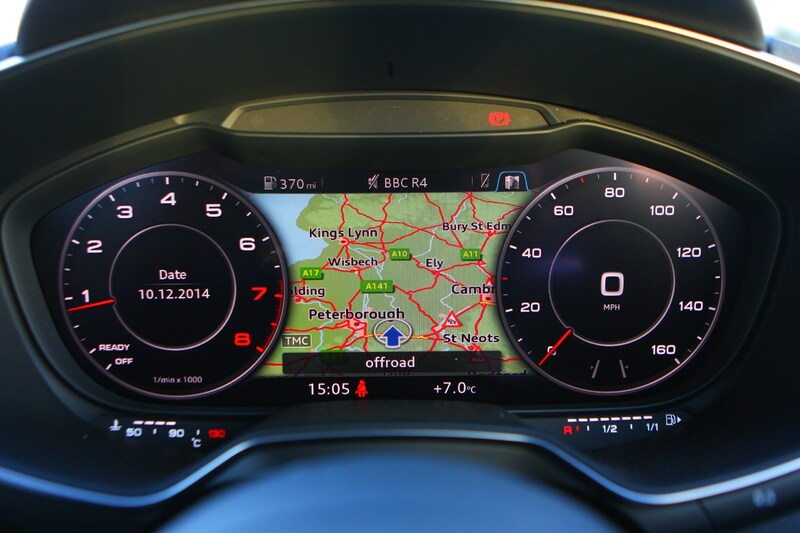 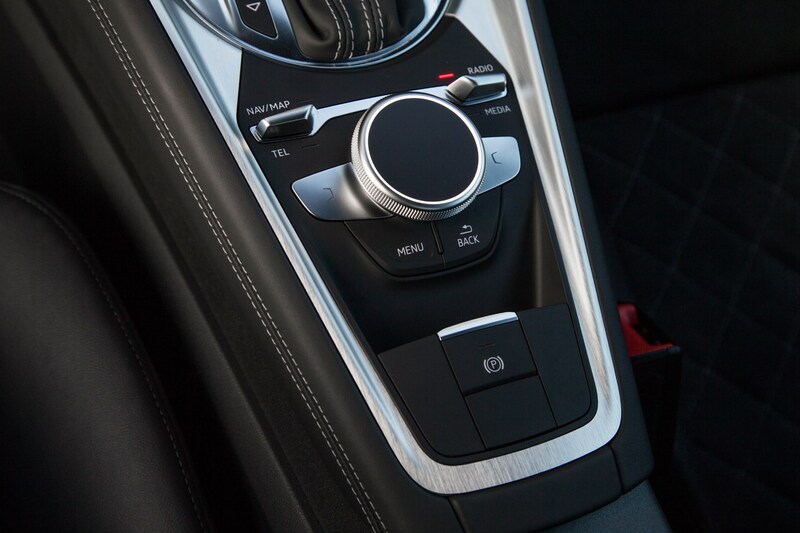 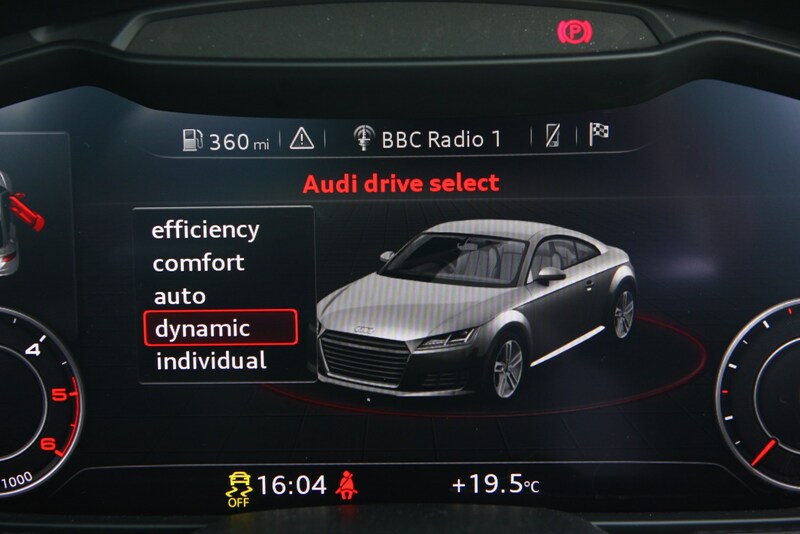 There’s no central infotainment screen to speak of like in other Audi models. 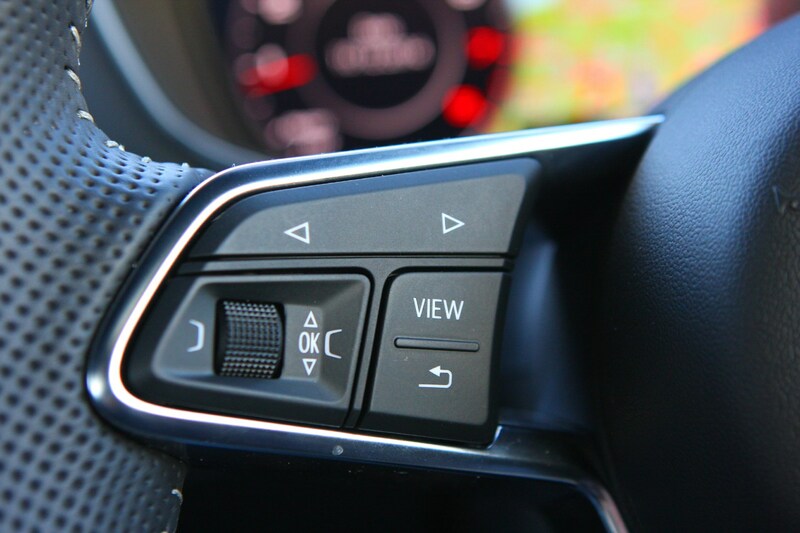 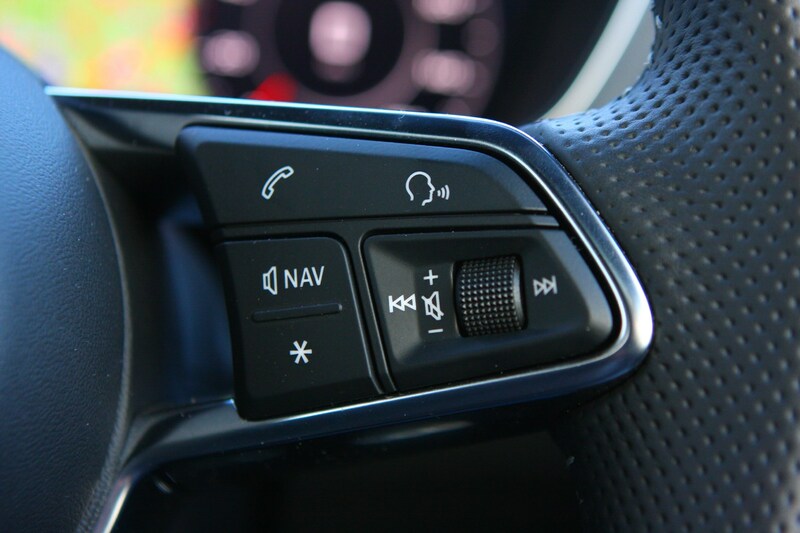 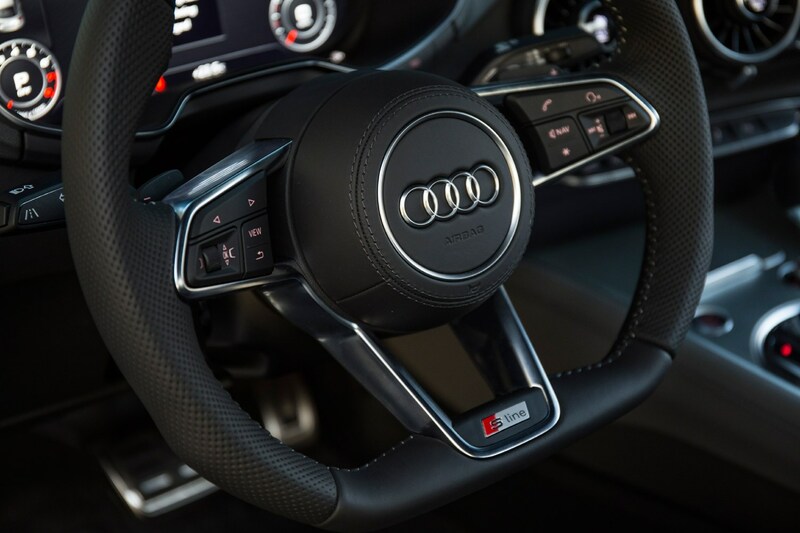 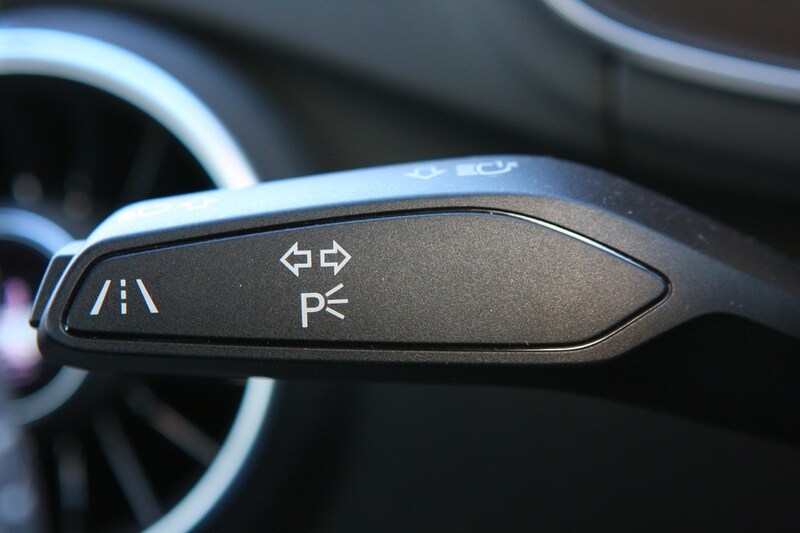 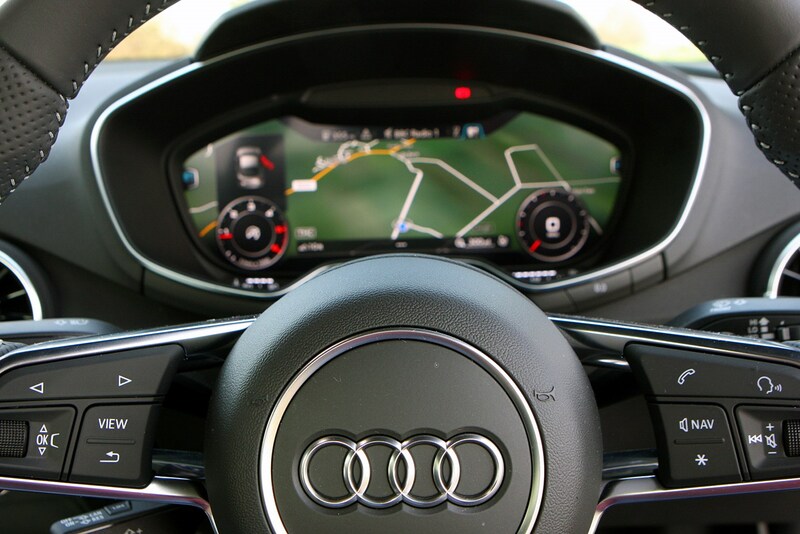 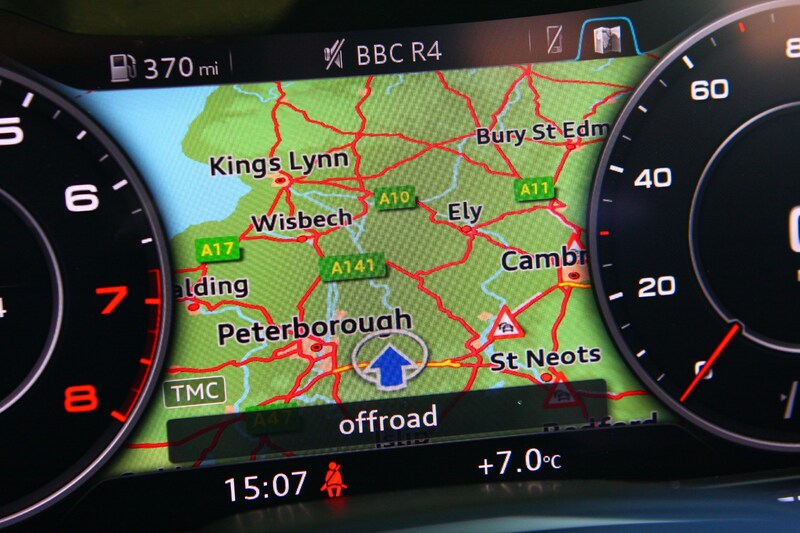 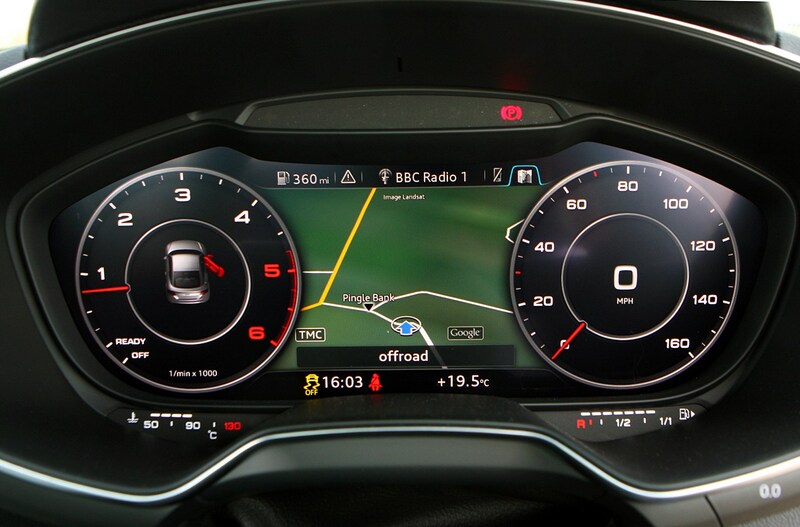 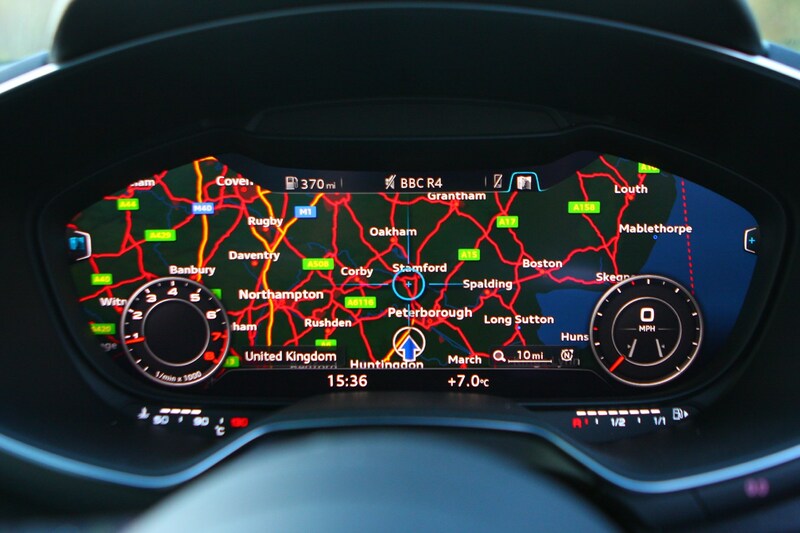 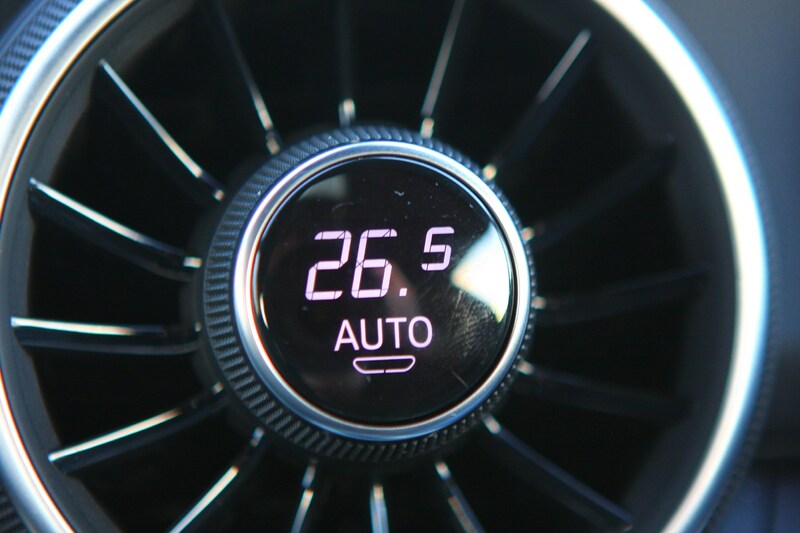 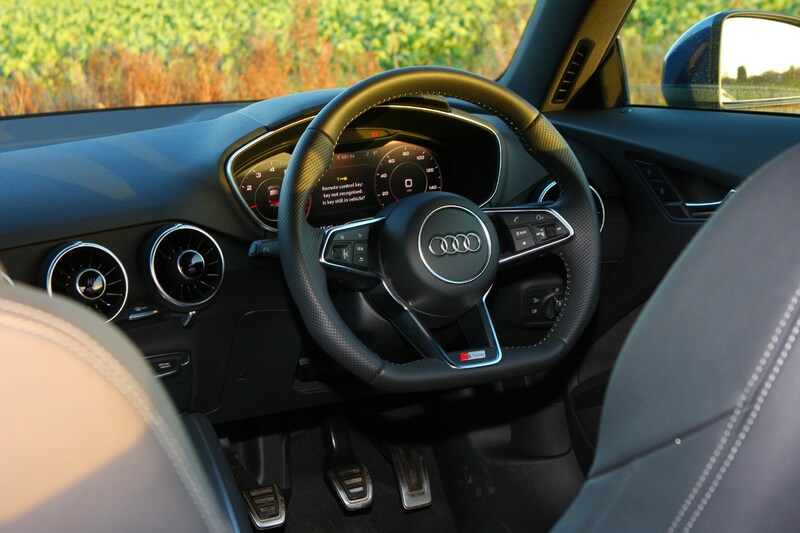 Instead, it’s all controlled via Audi’s Virtual Cockpit (available as an option on many other models) that sits in place of a traditional set of dials. 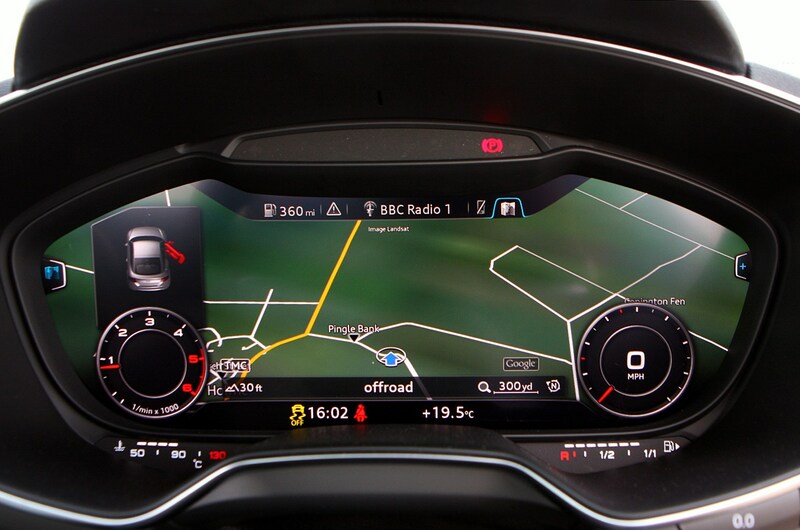 It’s a 12.3-inch screen that’s controlled via Audi’s MMI rotary controller on the centre console, or via buttons on the steering wheel. 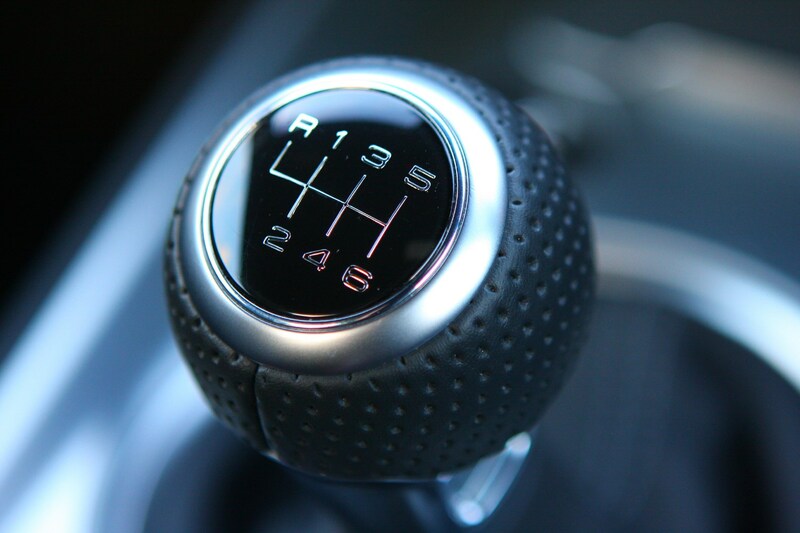 It takes a little getting used to, but once mastered it’s fairly intuitive and pleasant to use. 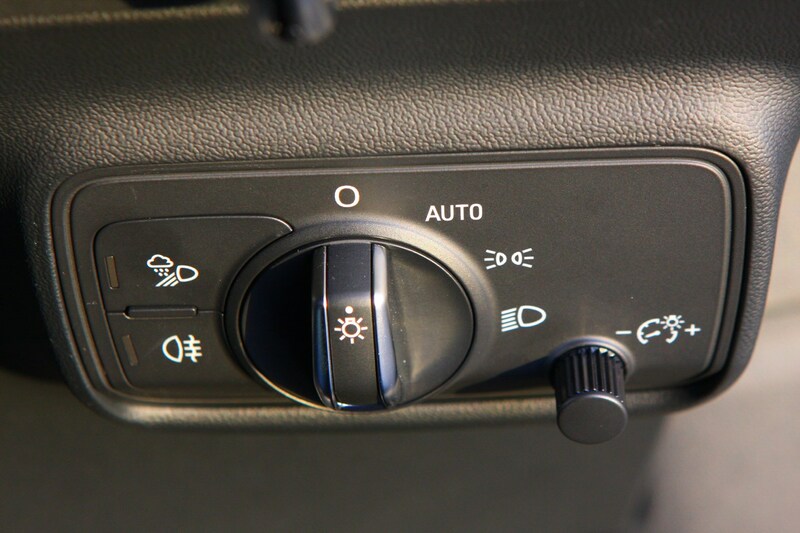 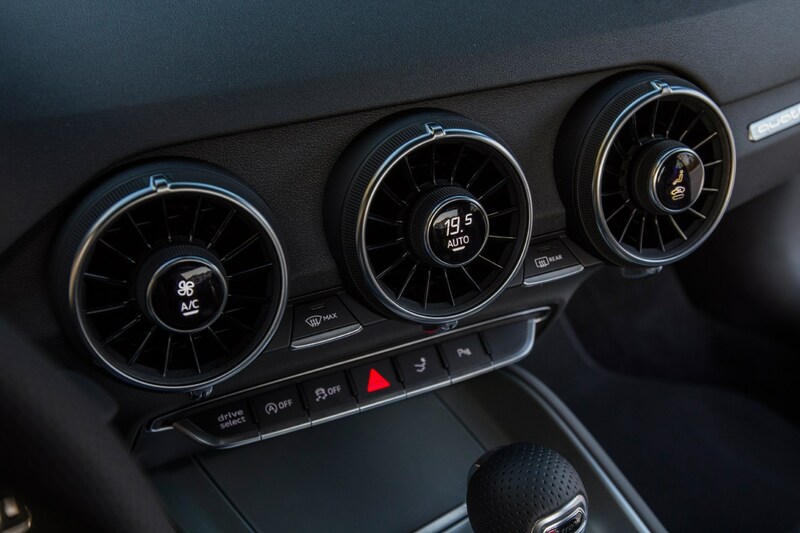 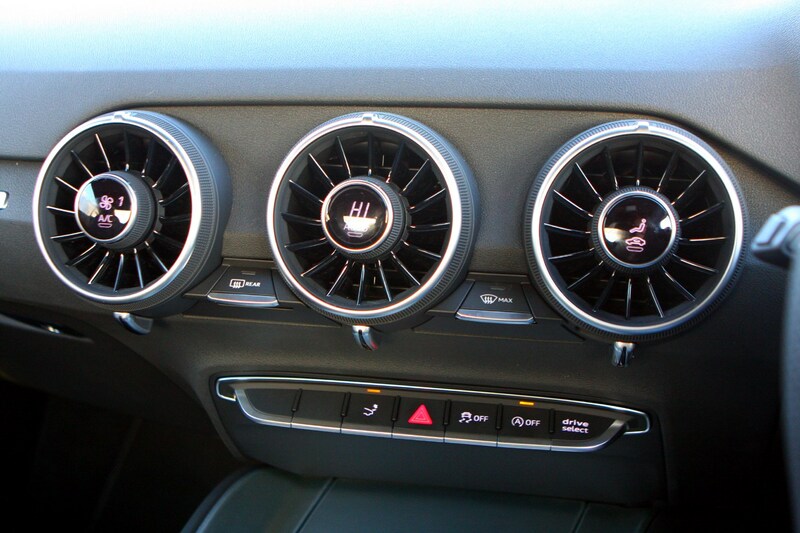 The rest of the cabin is simple to use – the heating controls are housed in the smart turbine-style air vents and quality is top-notch as you’d expect from the company. 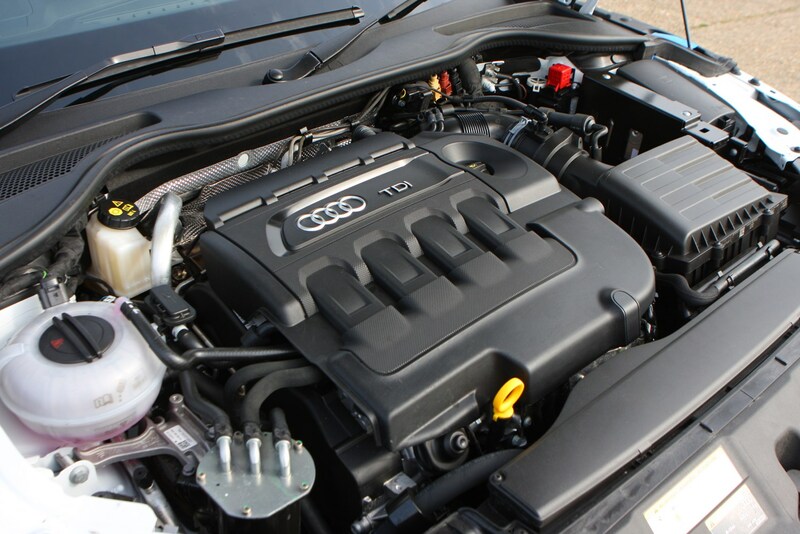 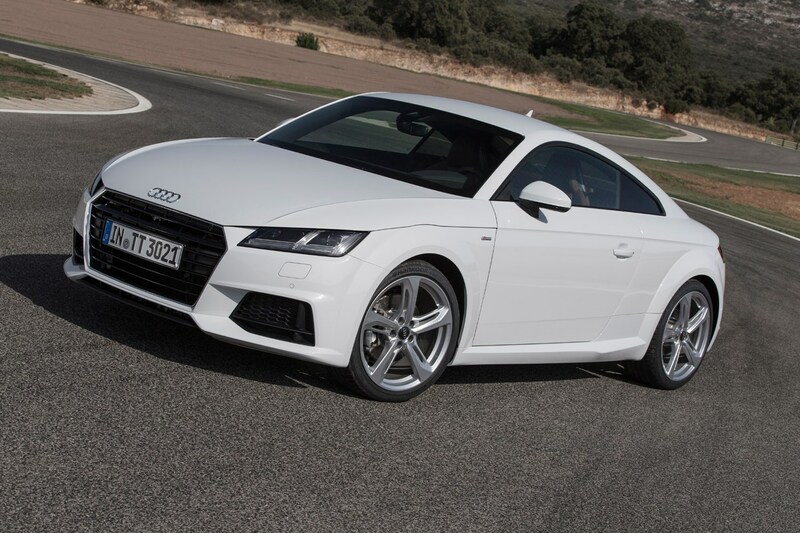 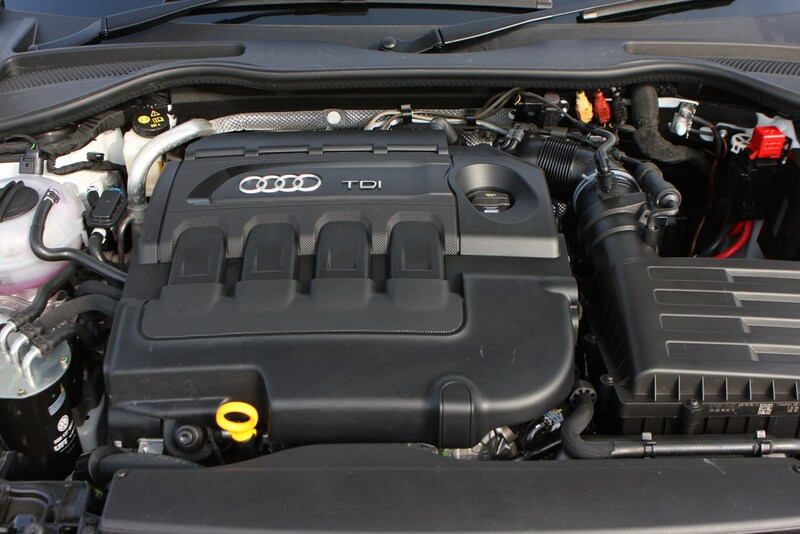 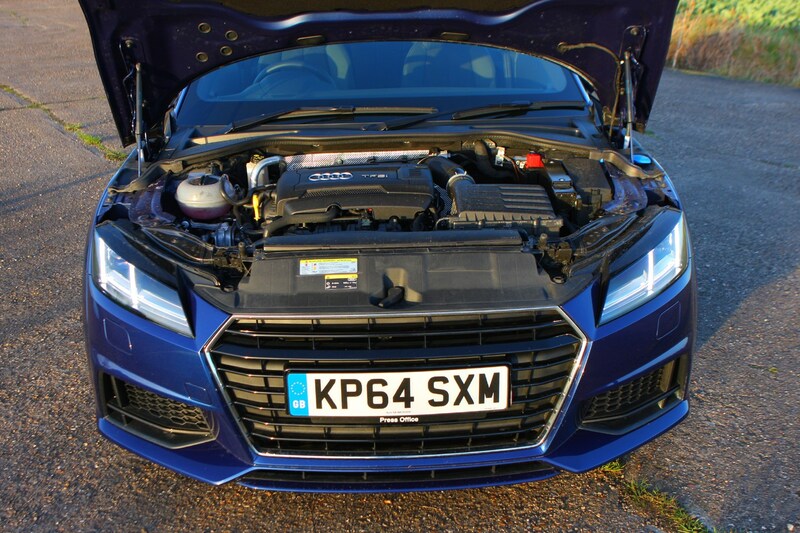 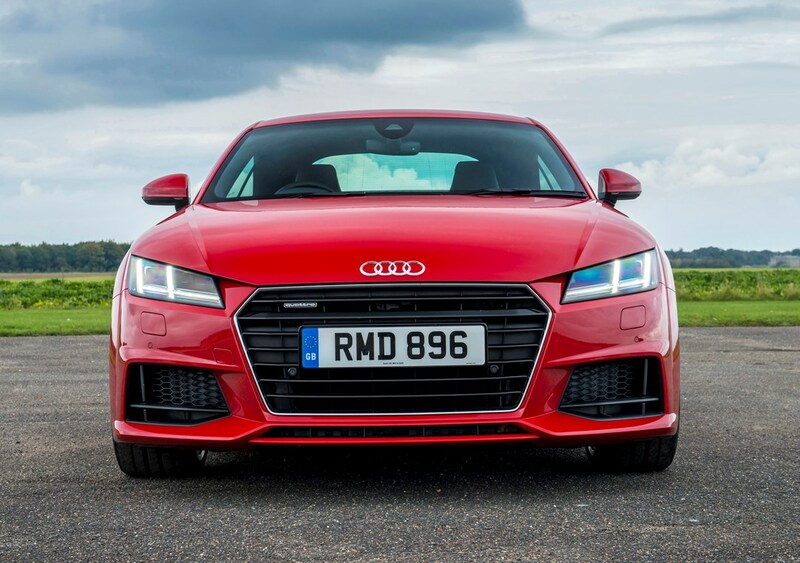 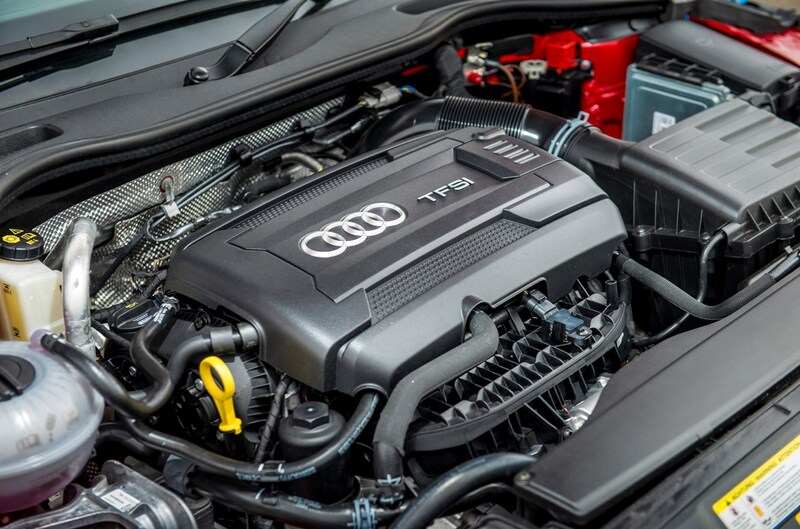 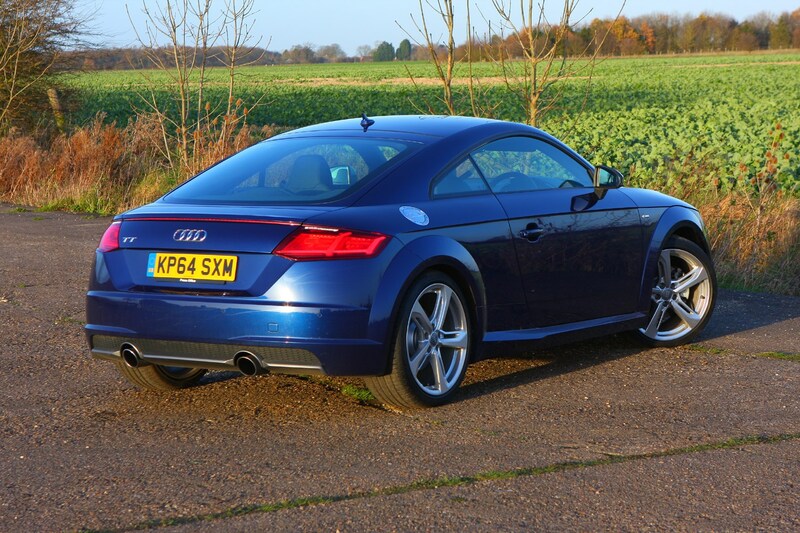 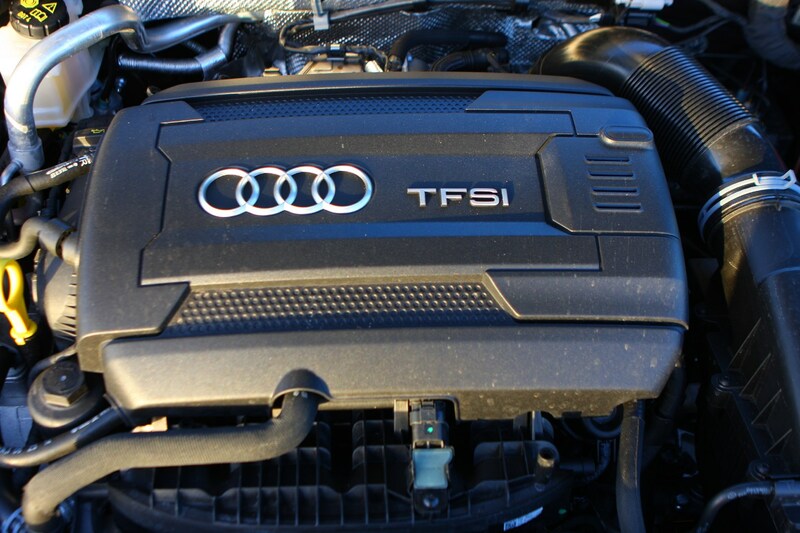 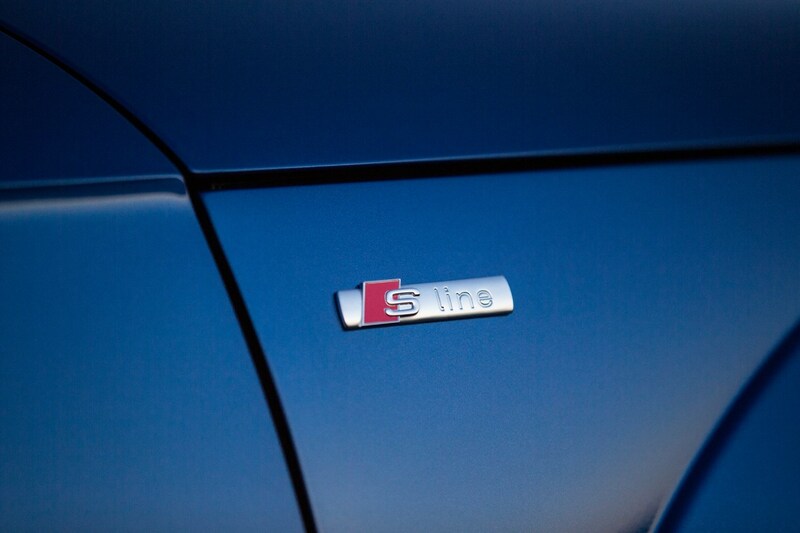 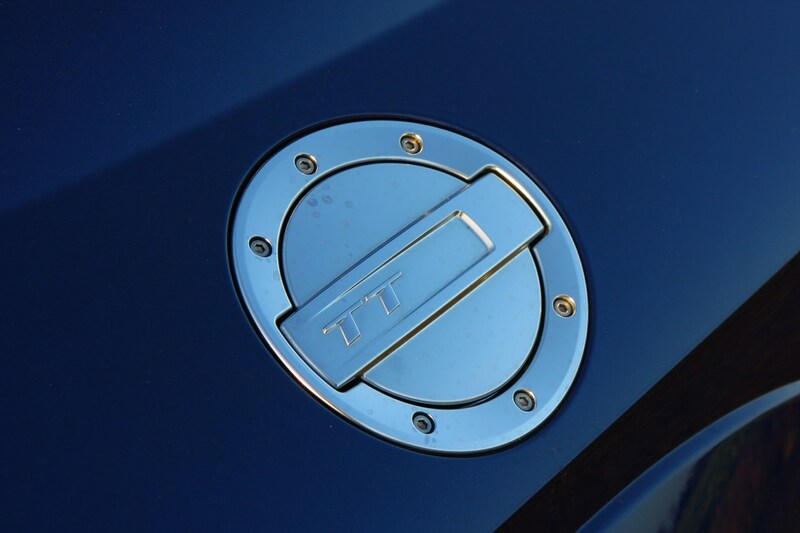 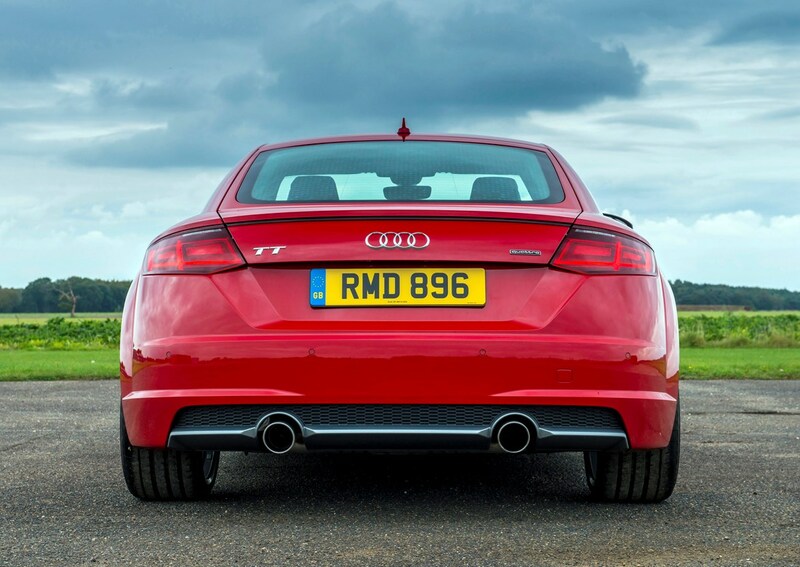 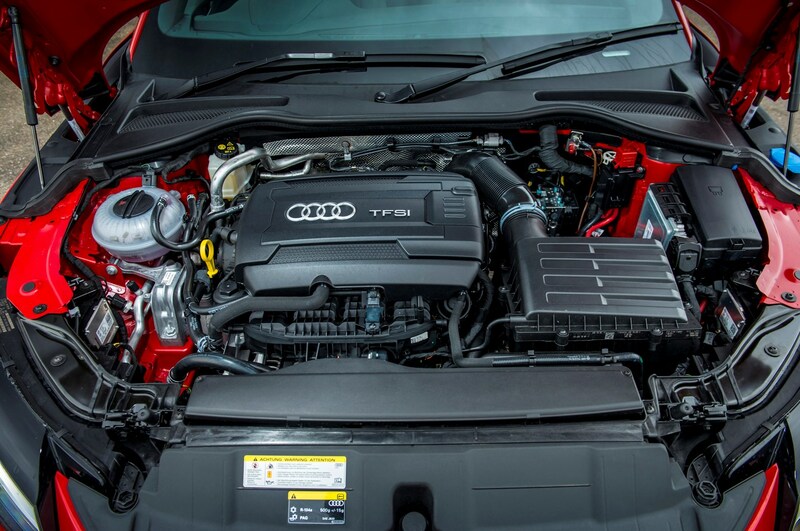 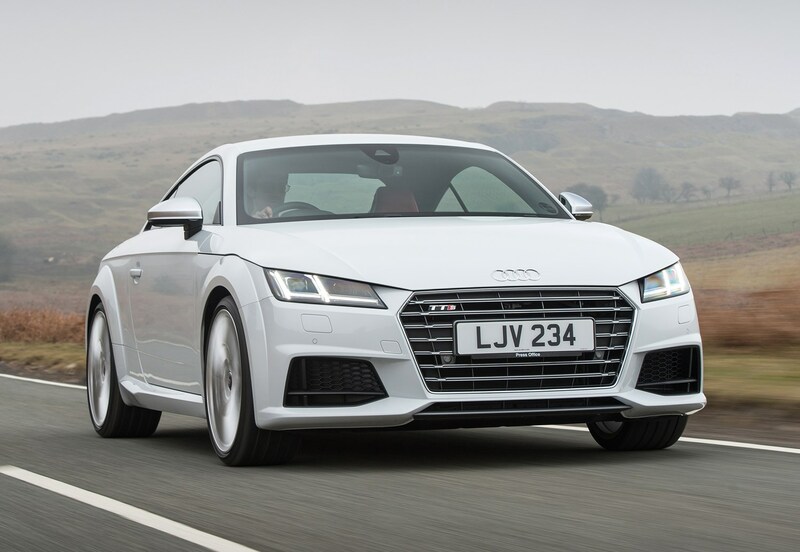 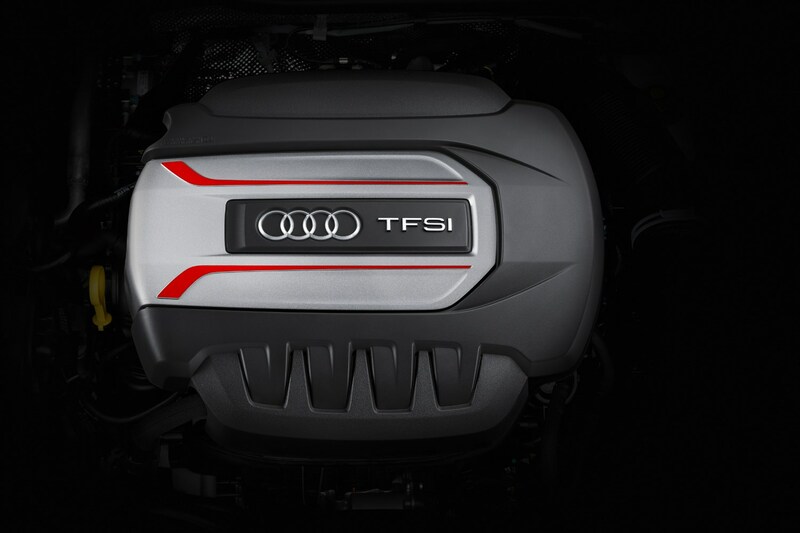 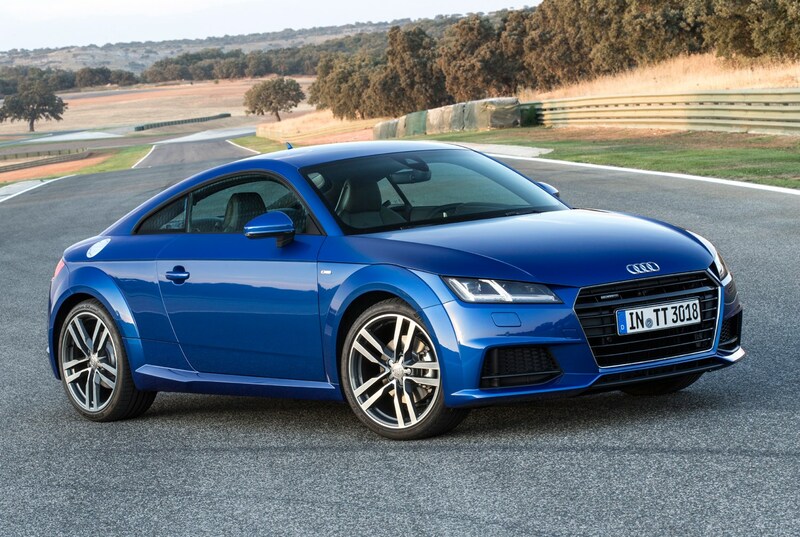 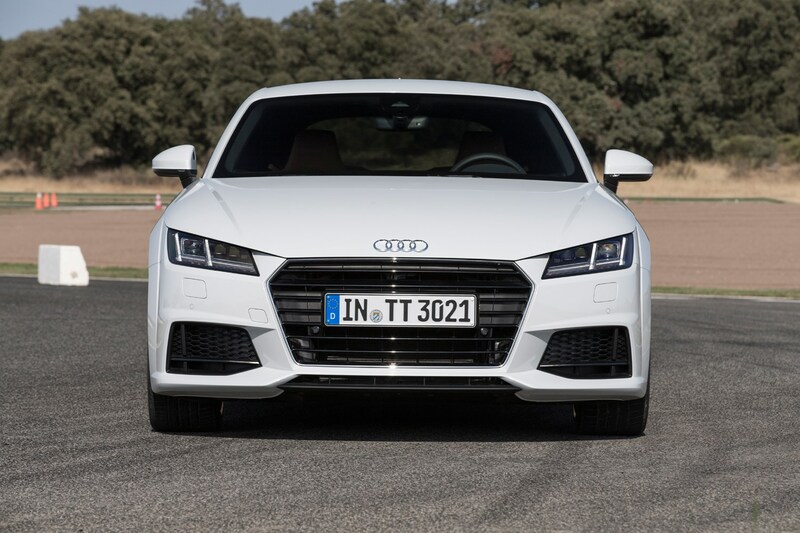 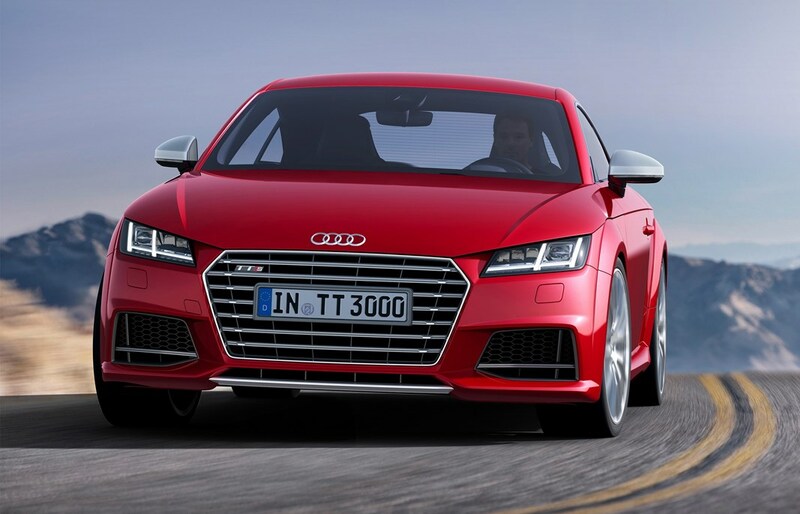 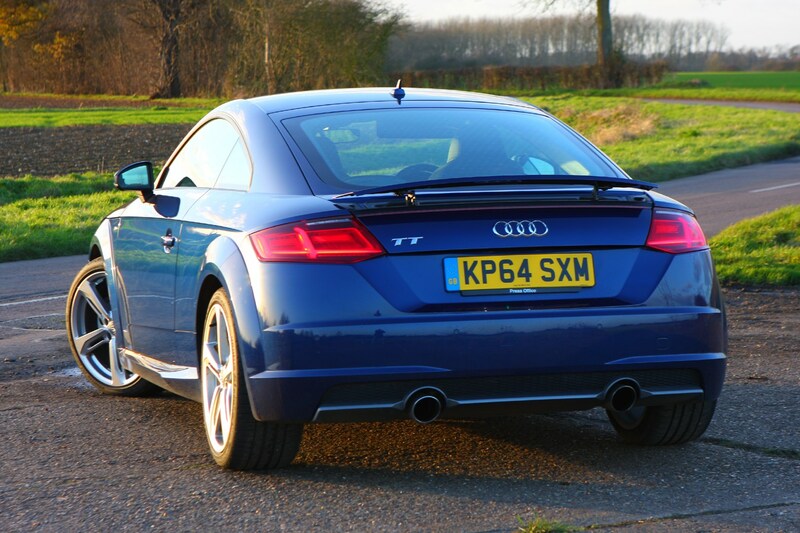 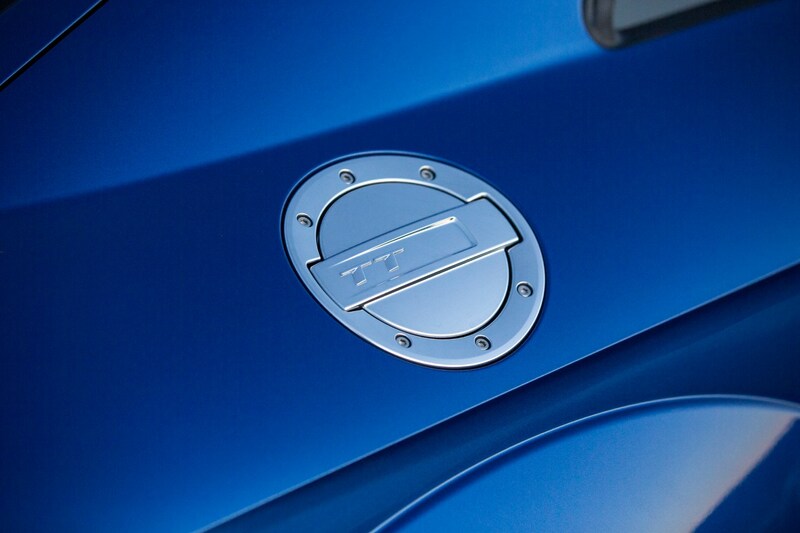 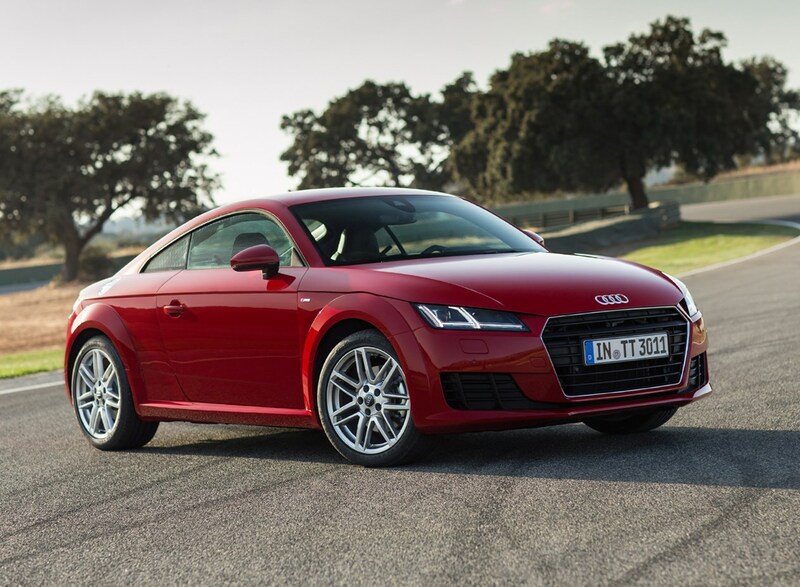 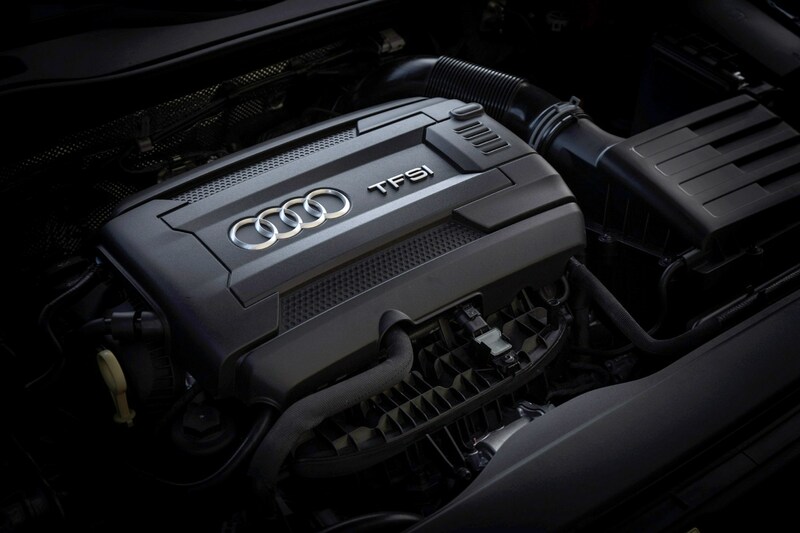 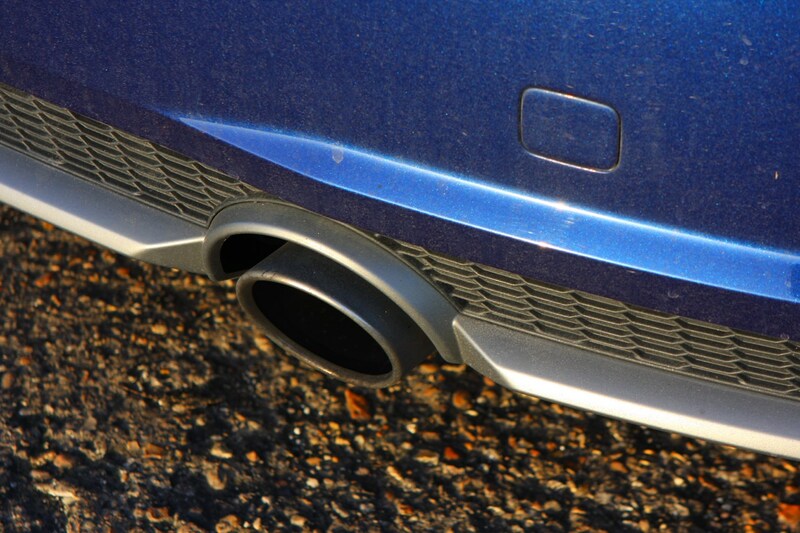 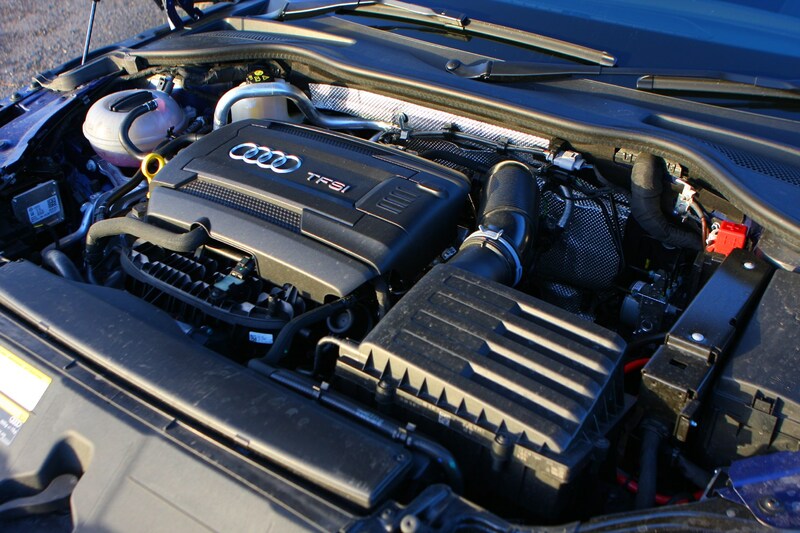 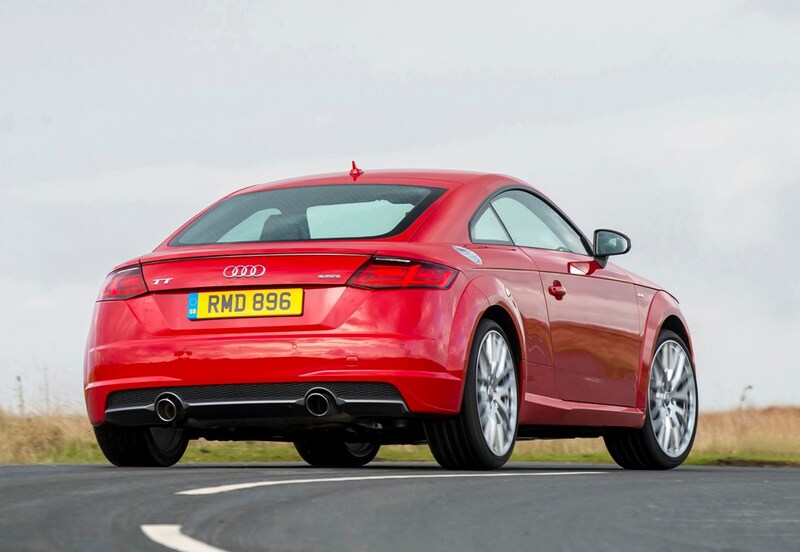 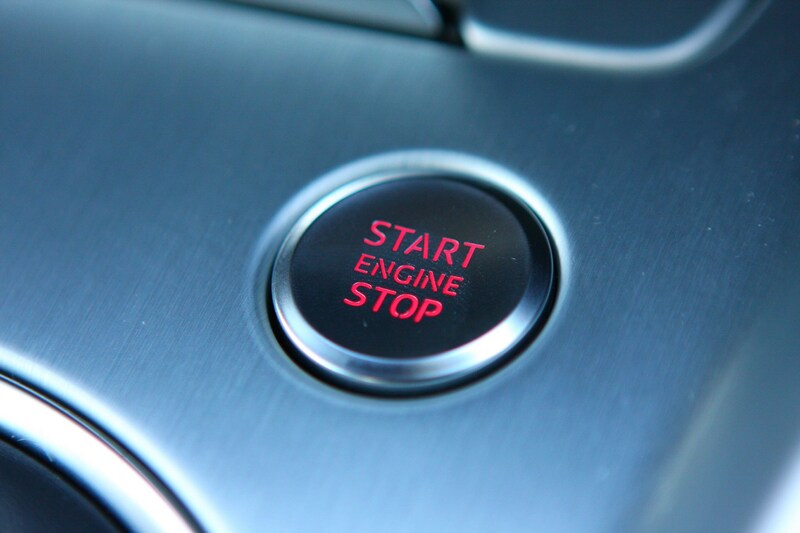 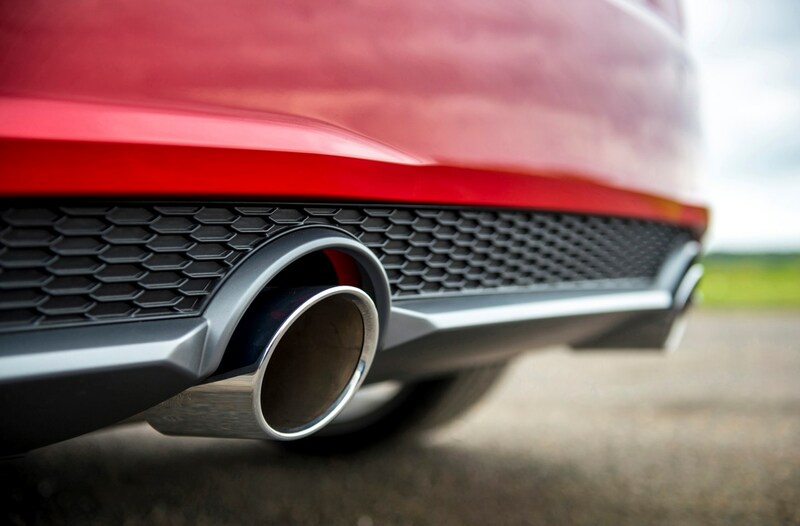 Just two engines are available in the regular TT line-up - badged 40 TFSI and 45 TFSI. 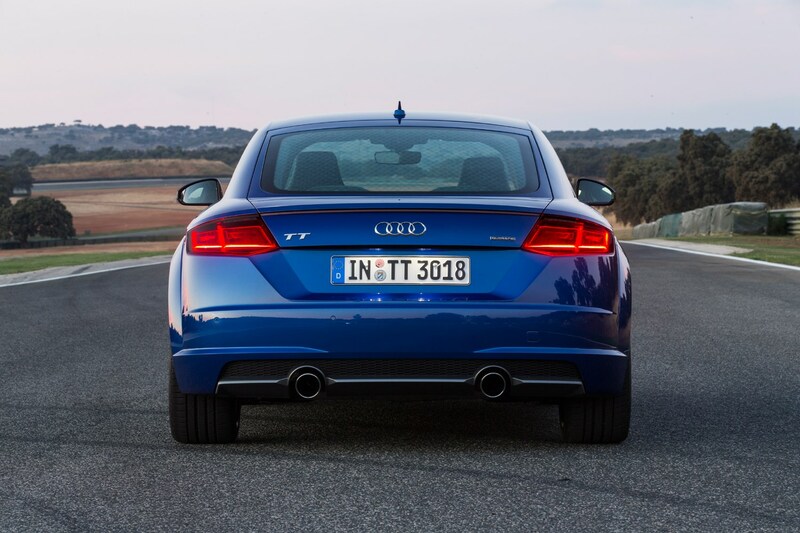 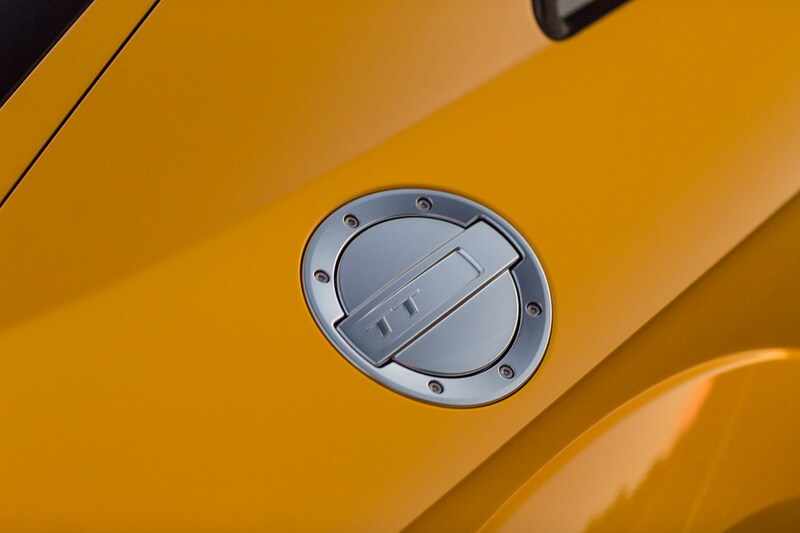 Both use a 2.0-litre turbocharged petrol engine, producing 197hp and 245hp respectively. 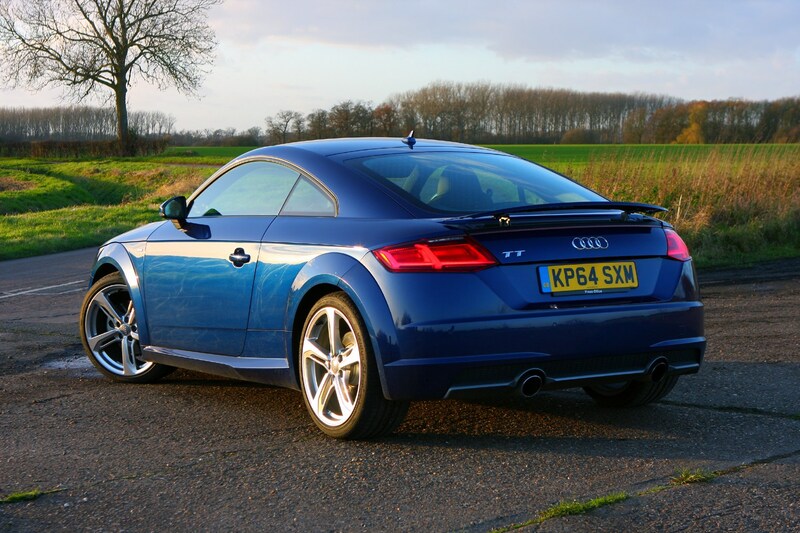 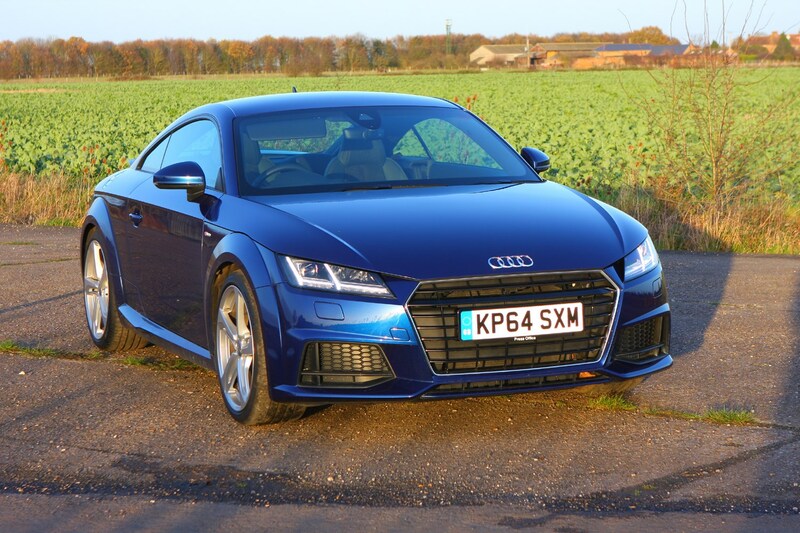 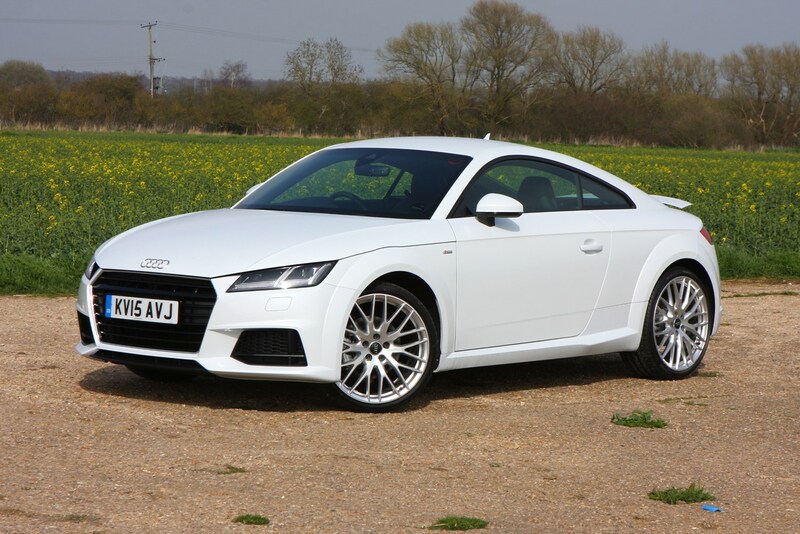 If you're looking at a used TT (a pre-facelift car), you'll also have a choice of 1.8 TFSI with 180hp, a 2.0 TFSI with 230hp and a 2.0 TDI diesel with 184hp. 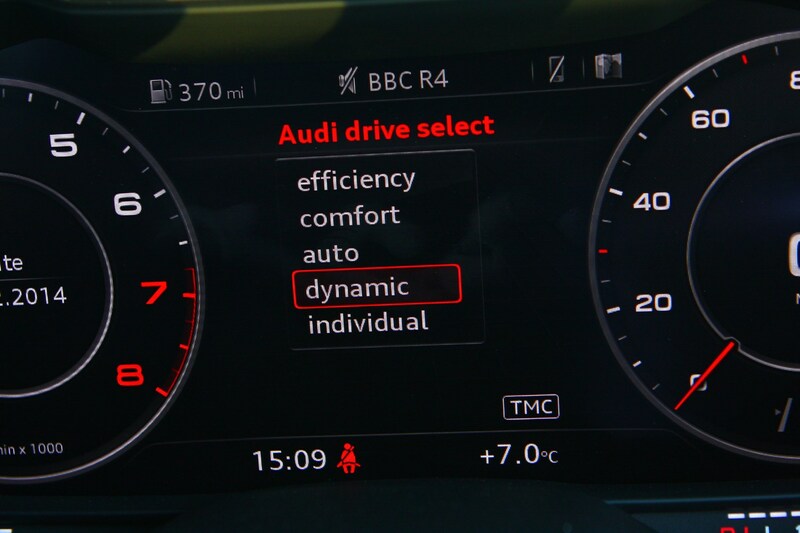 Choose the 40 TFSI and you'll get an S Tronic automatic gearbox, while the 45 TFSI has more options, with manual and S Tronic available, as well as Quattro all-wheel drive. 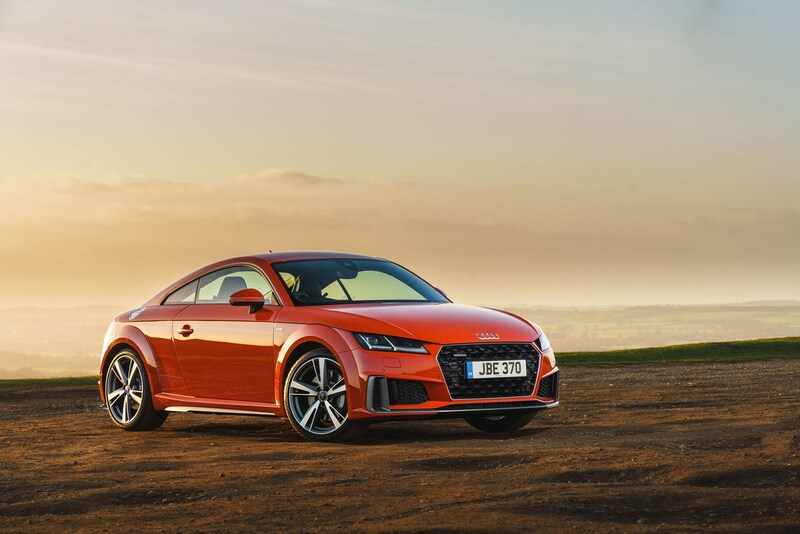 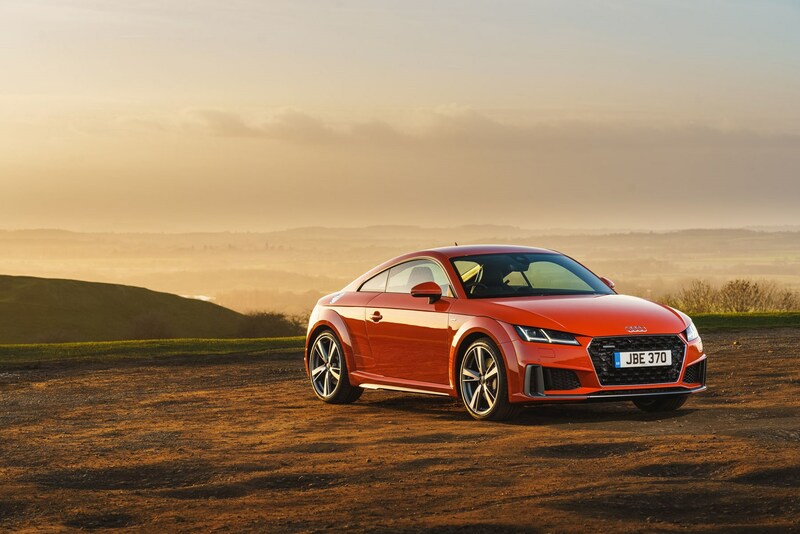 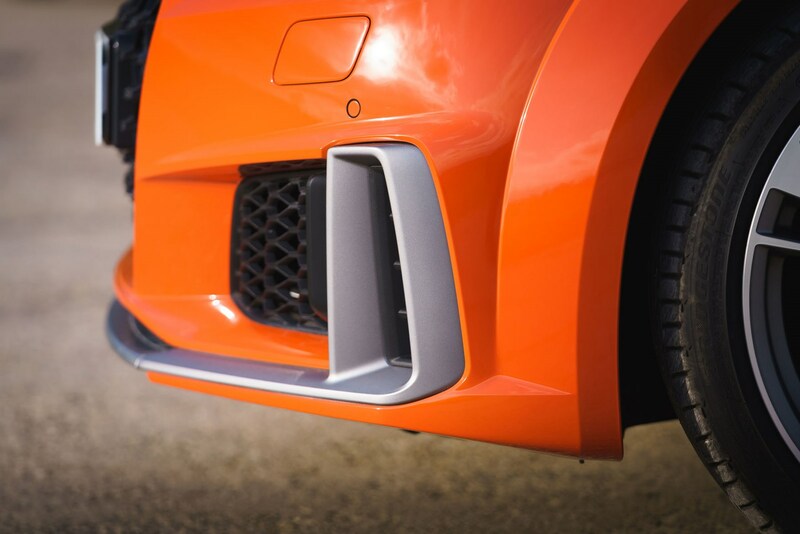 Bridging the gap between regular TT models and the top-of-the-range TT RS is the TT S, powered by a 2.0-litre TFSI petrol engine producing 310hp. 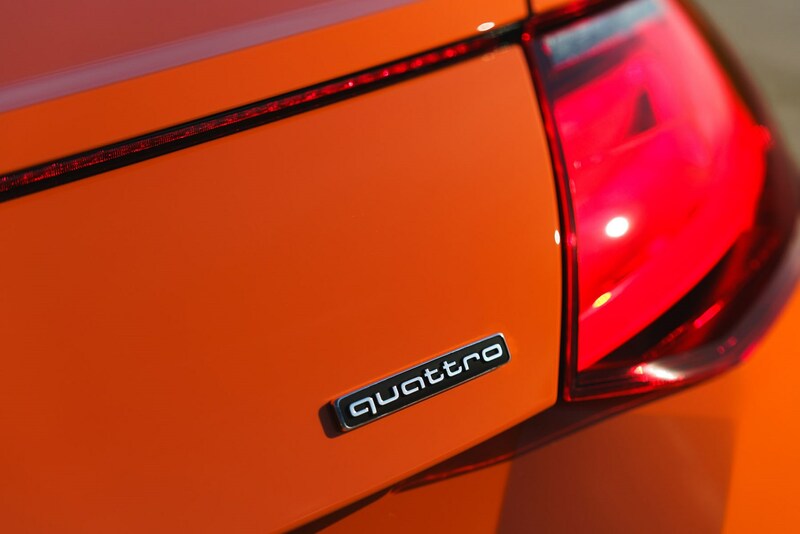 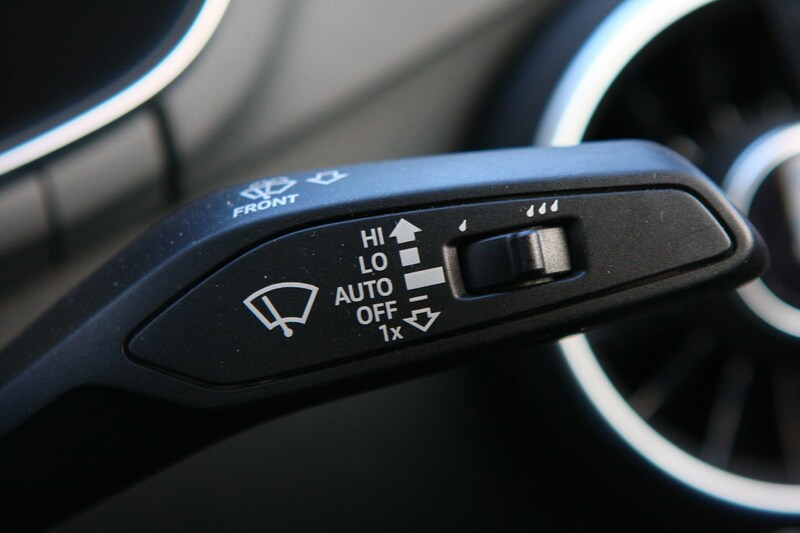 Quattro all-wheel drive is standard, but buyers can choose between a six-speed manual gearbox or a six-speed S Tronic dual-clutch automatic. 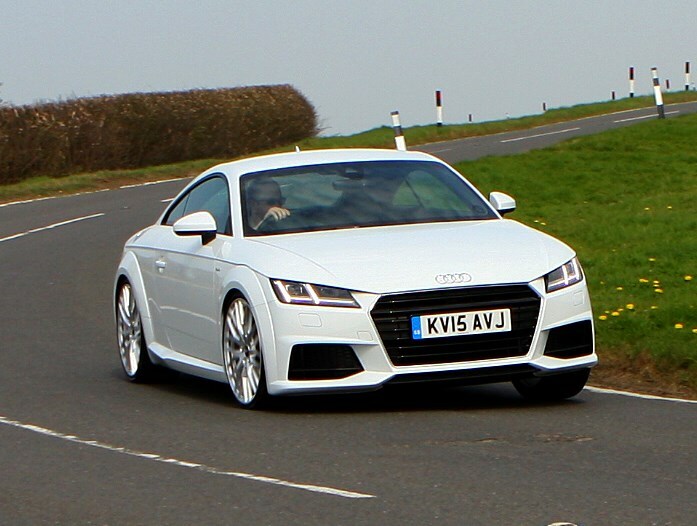 The TT S is marked out by various exterior design details such as a silver grille and door mirror caps, different alloy wheels and quad exhaust pipes at the rear of the car. 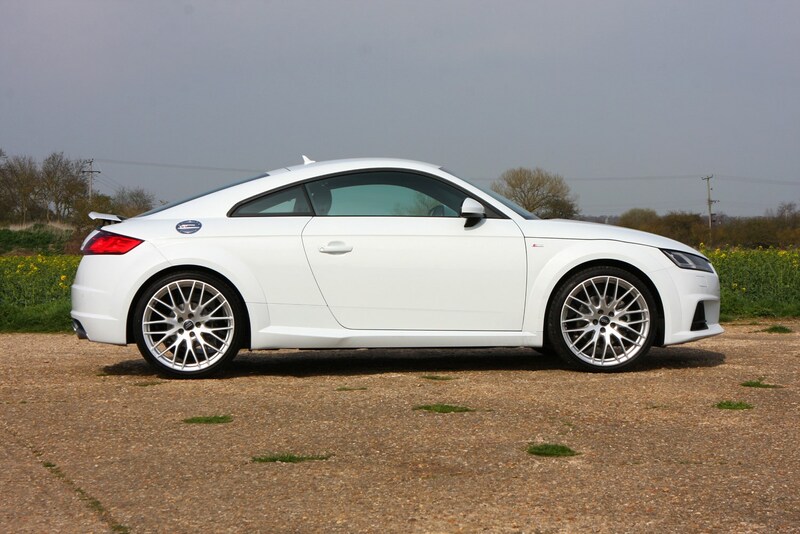 Then there’s the TT RS. 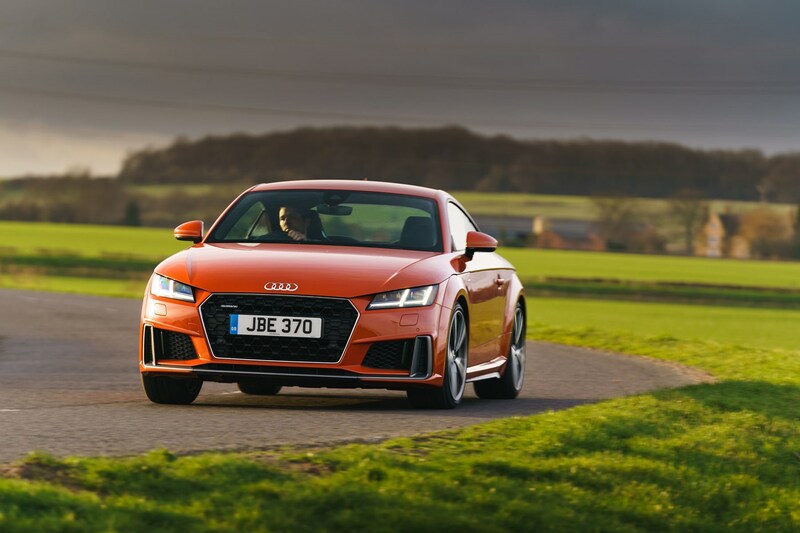 It’s powered by a howling 2.5-litre five-cylinder TFSI petrol, capable of blitzing from 0-62mph in just 3.7 seconds and will go on to reach a 174mph top speed. 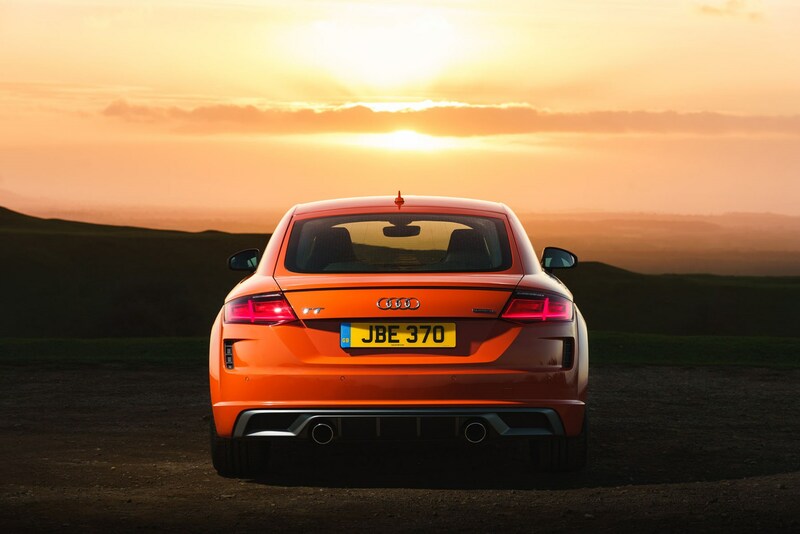 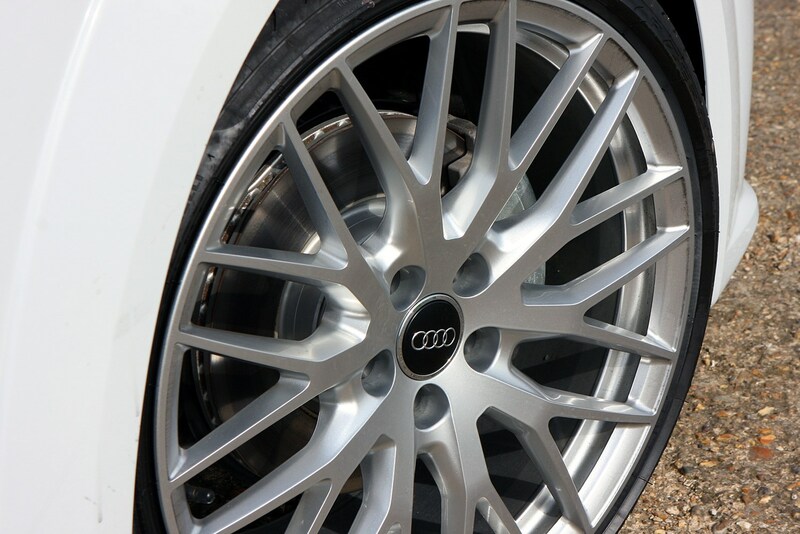 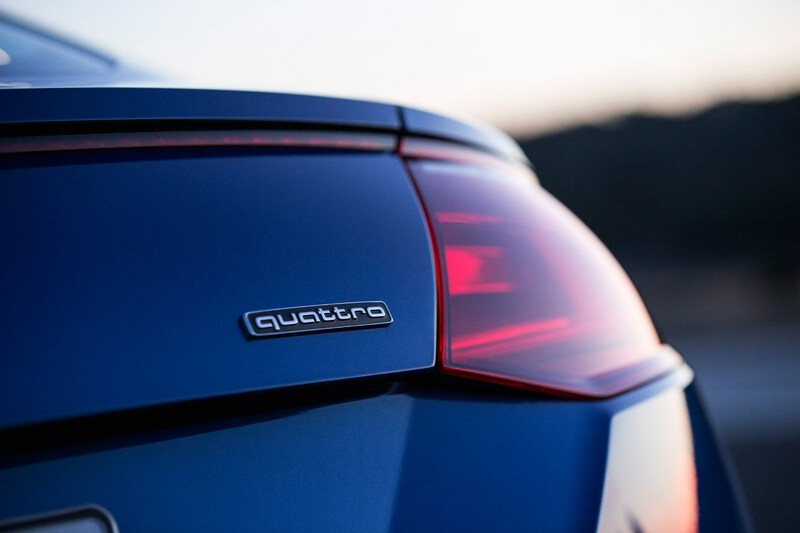 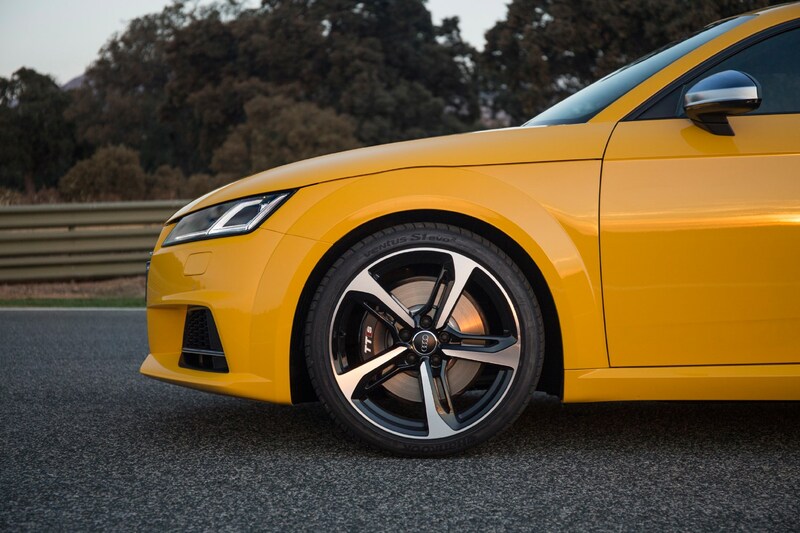 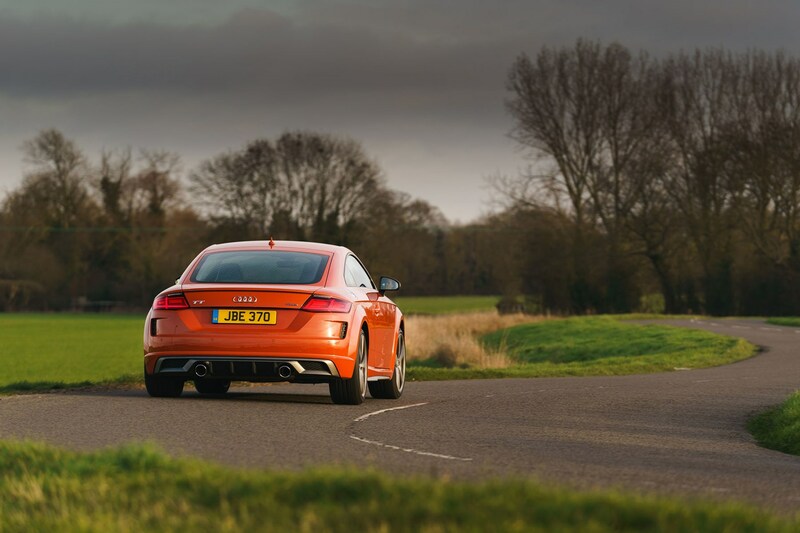 You can thank 400hp, 480Nm of torque, a slick S Tronic transmission and Quattro all-wheel drive for that. 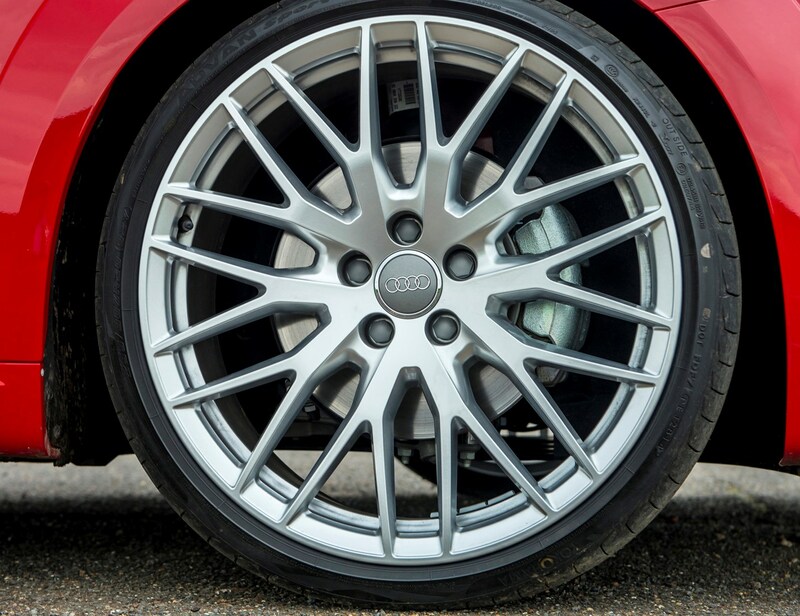 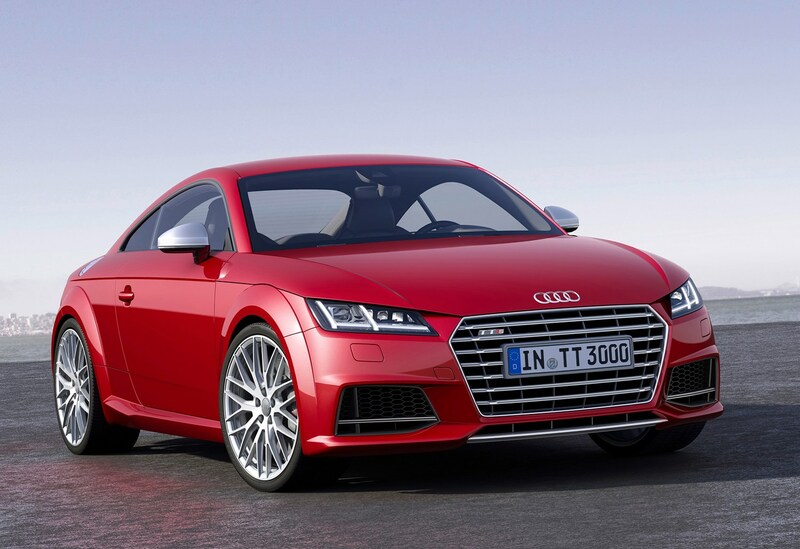 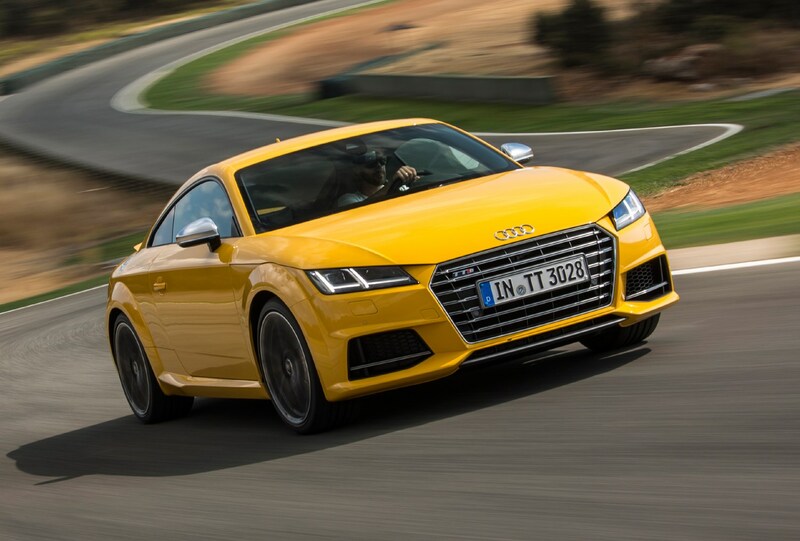 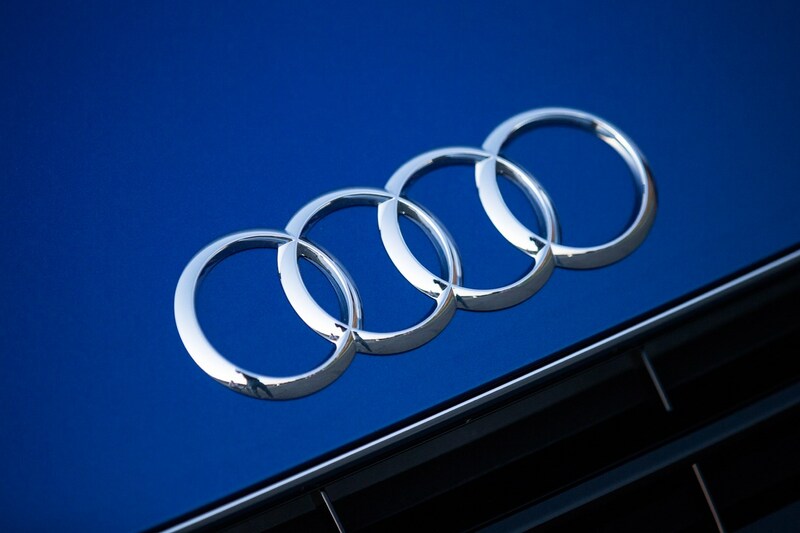 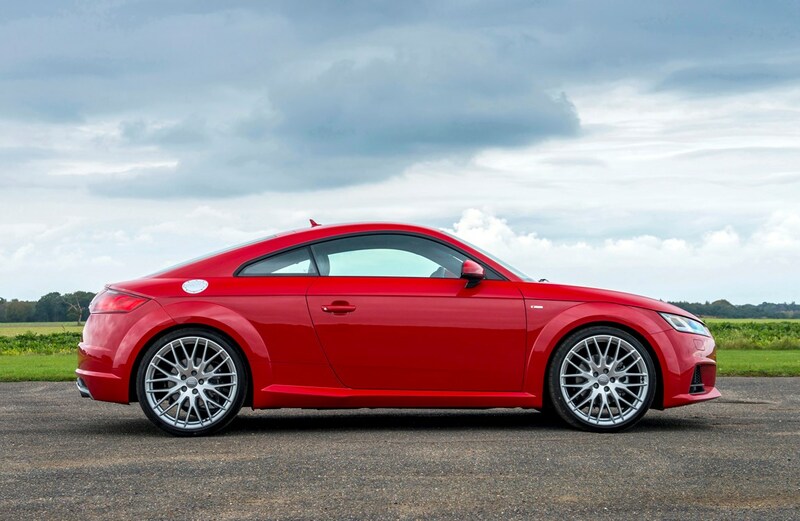 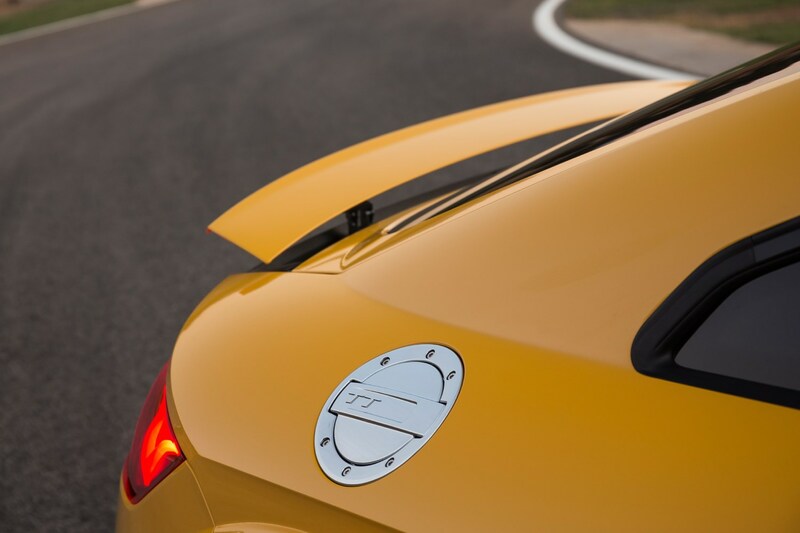 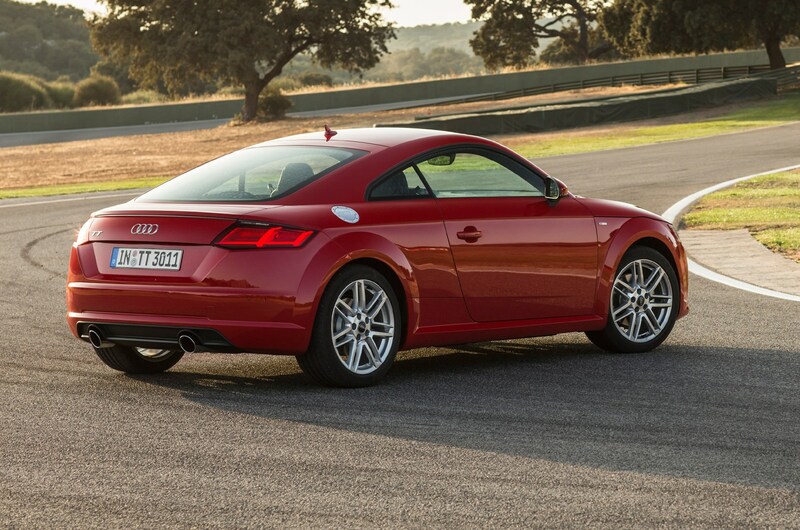 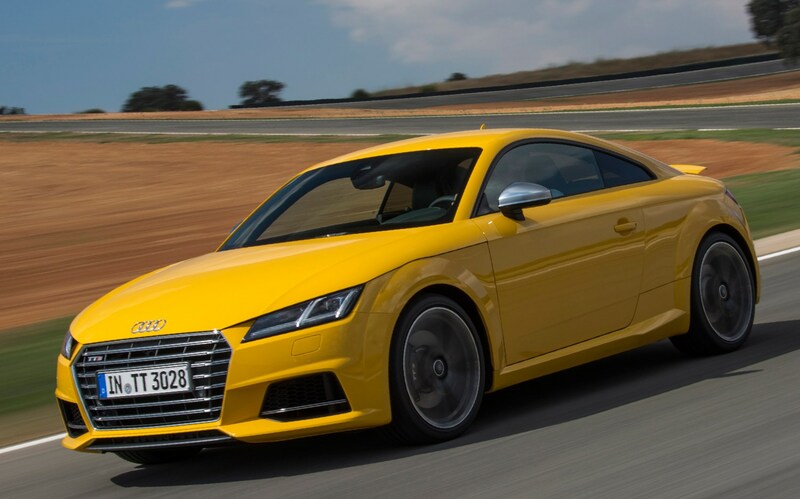 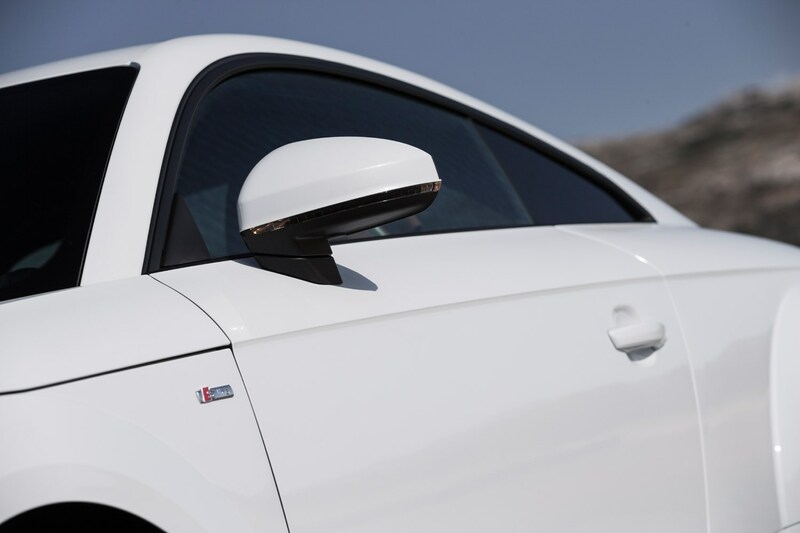 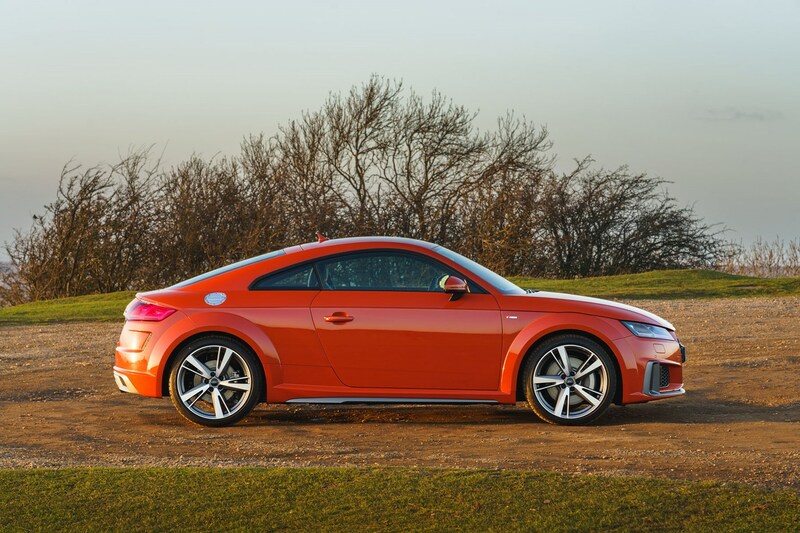 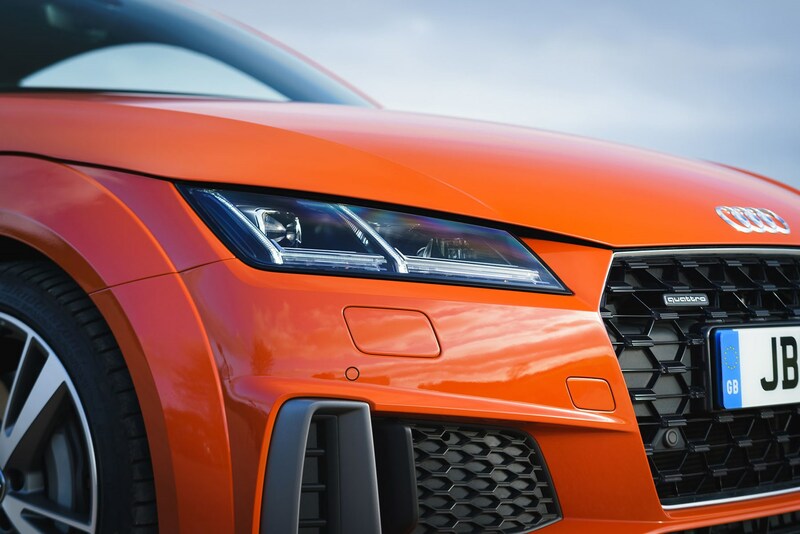 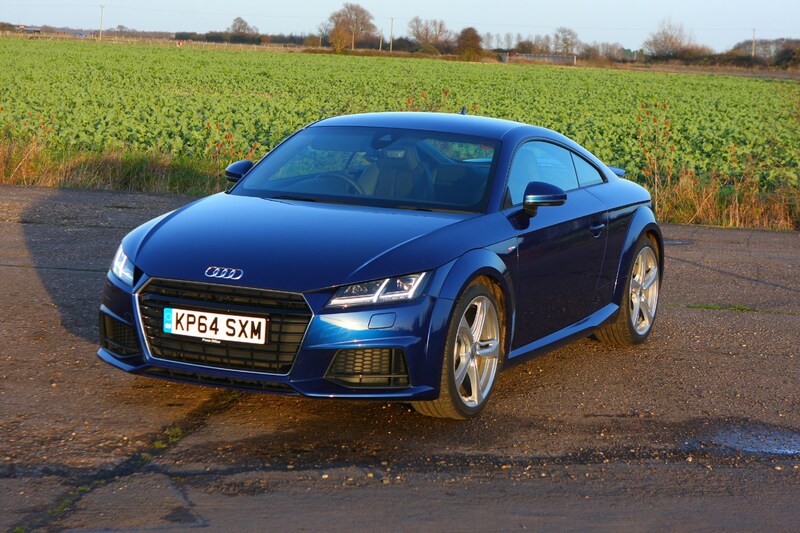 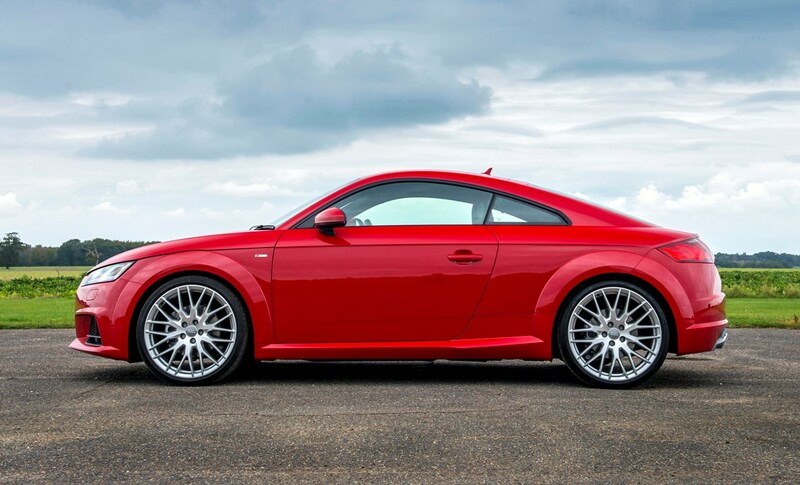 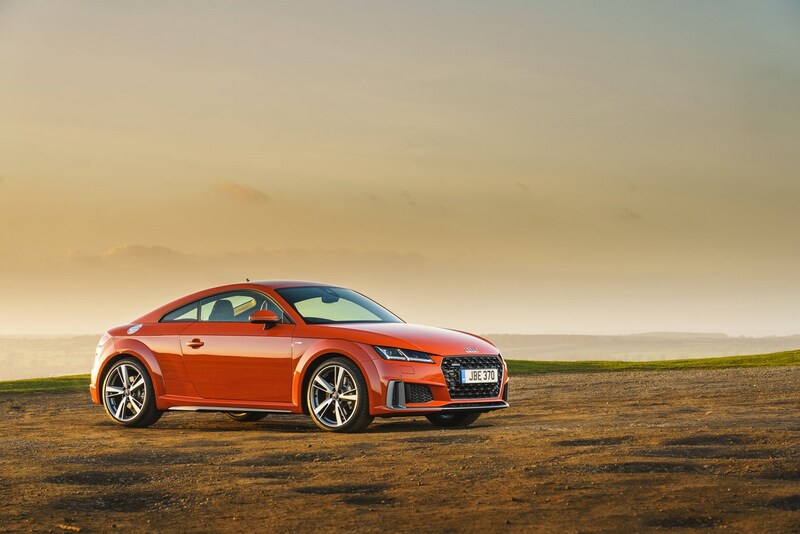 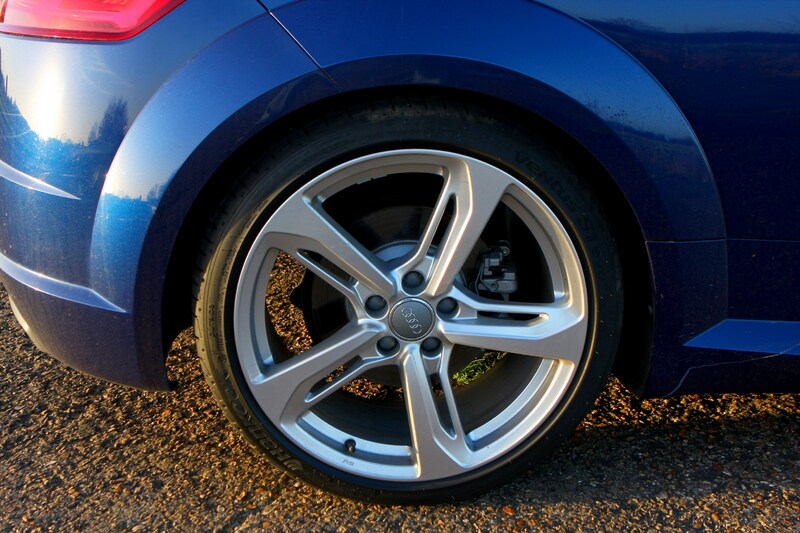 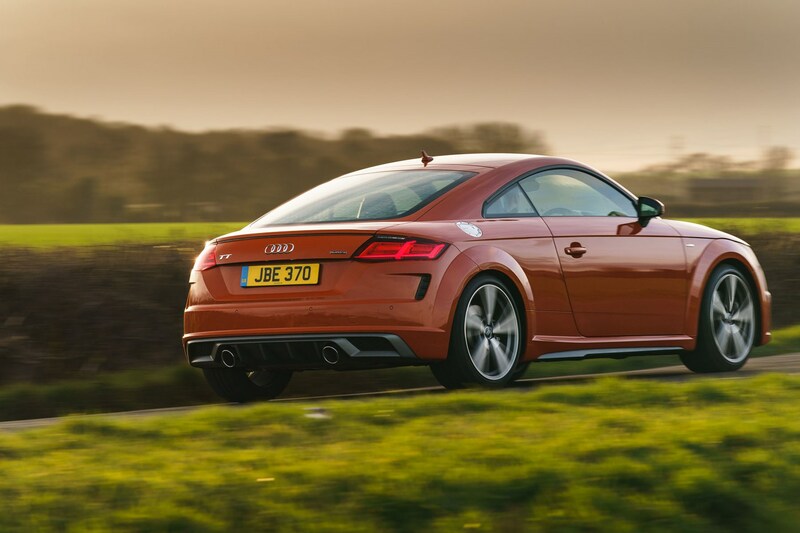 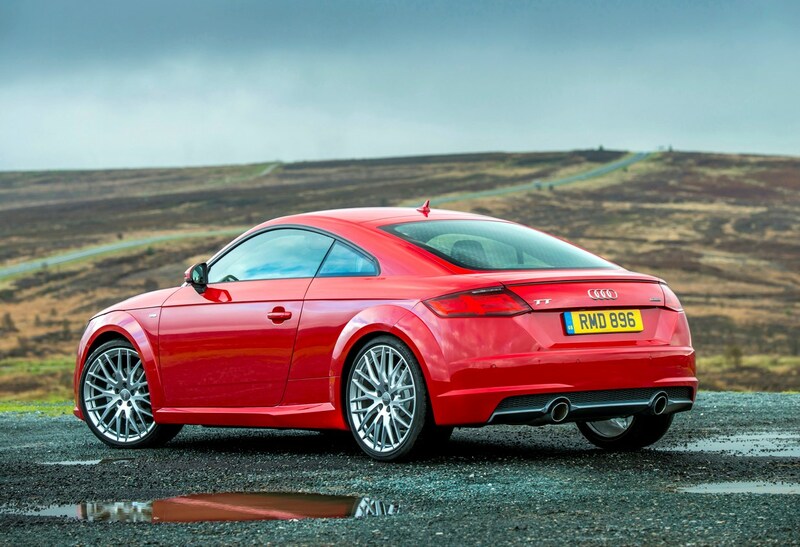 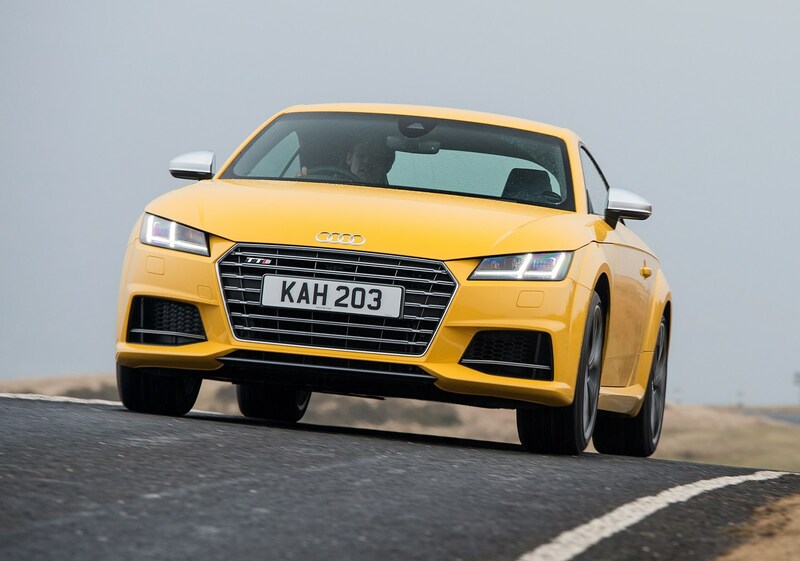 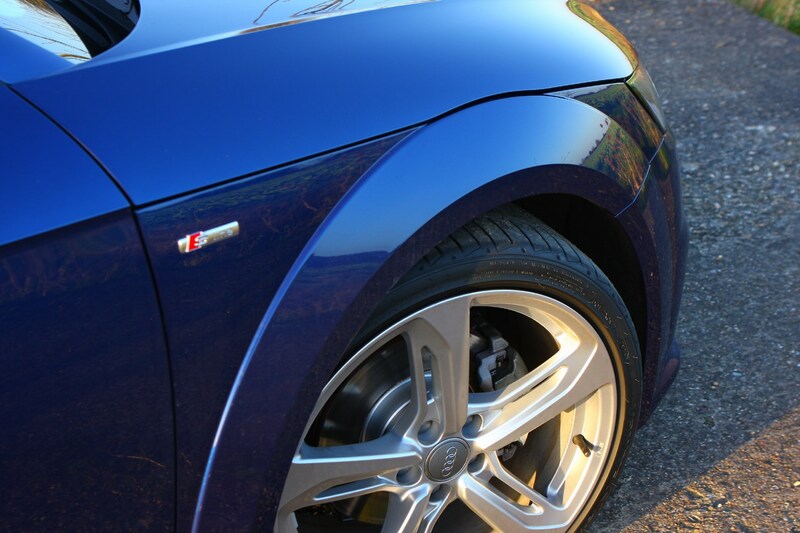 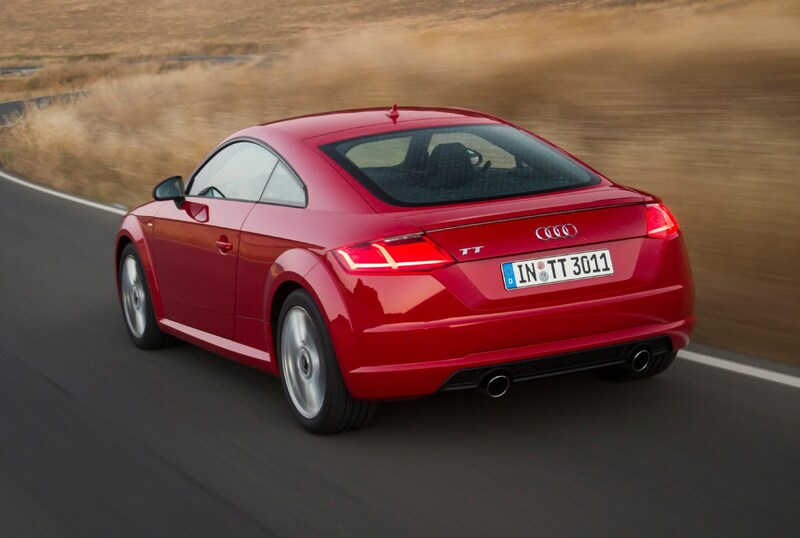 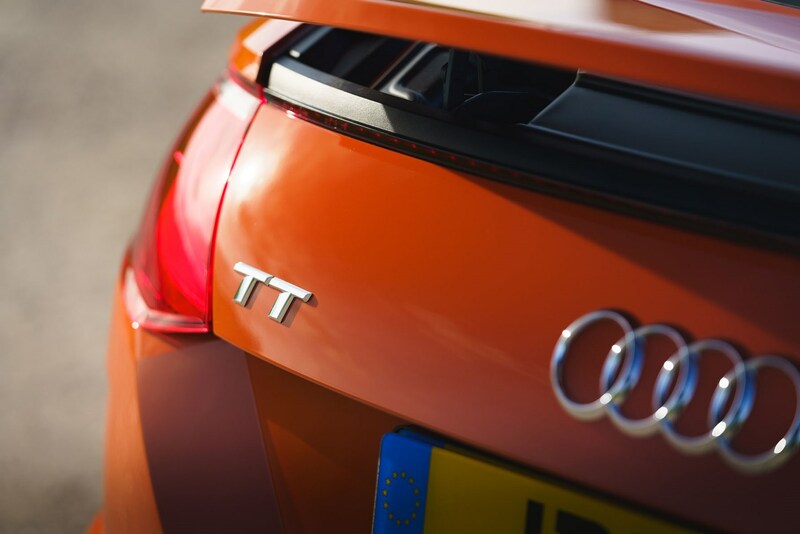 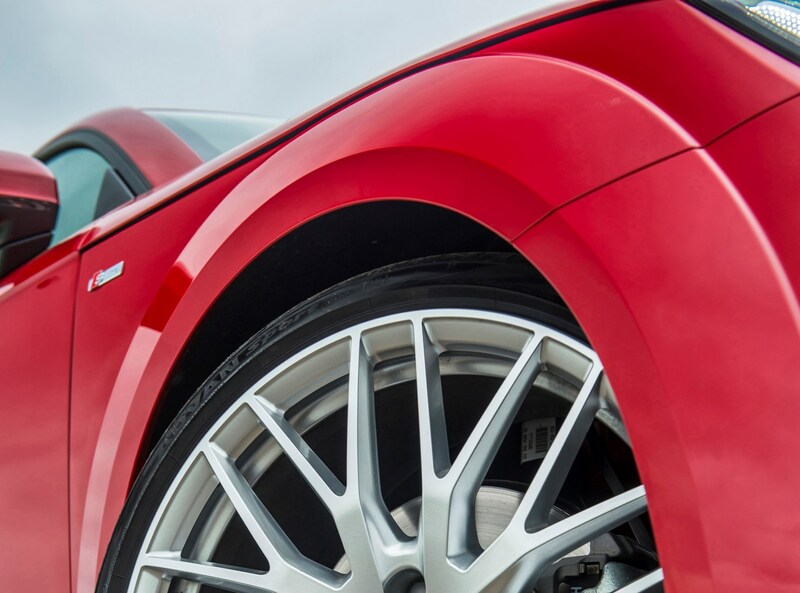 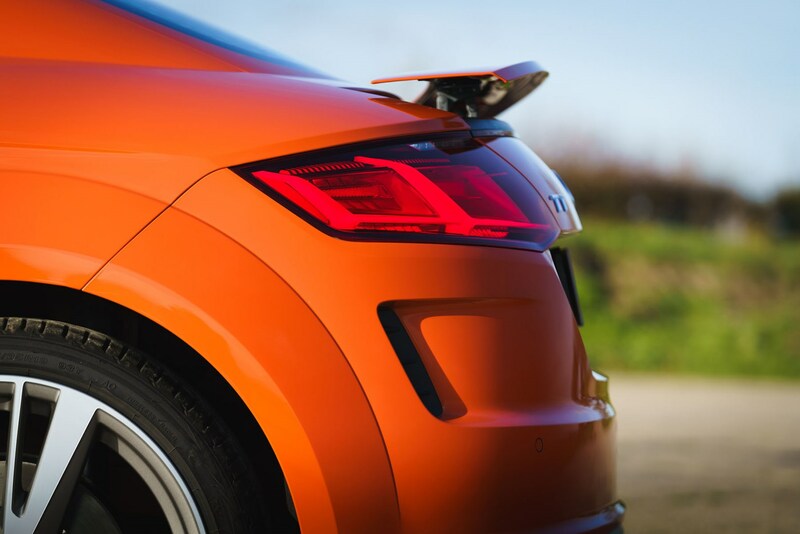 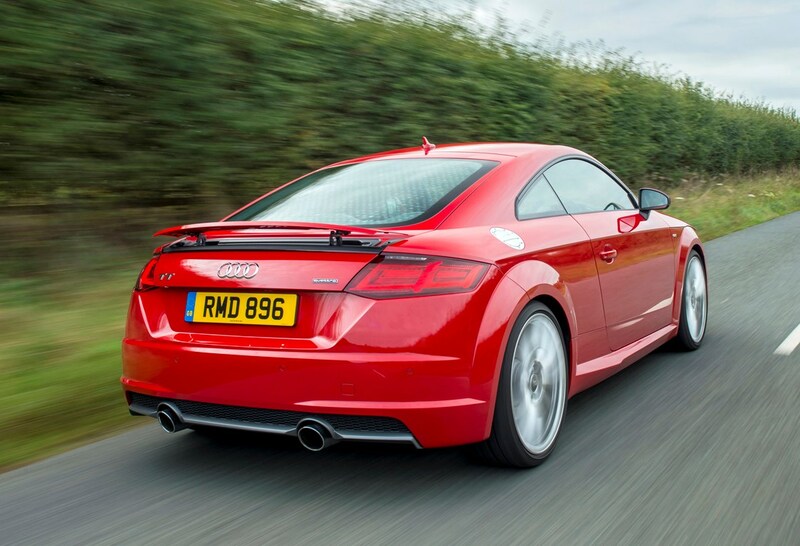 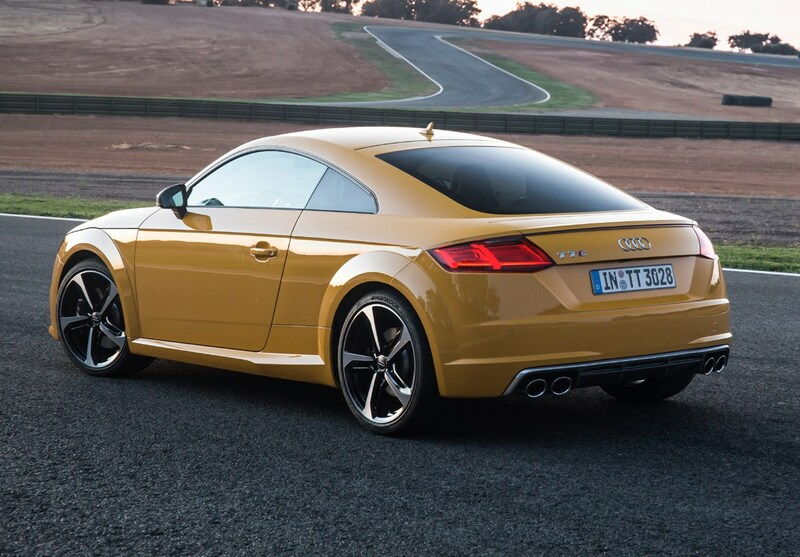 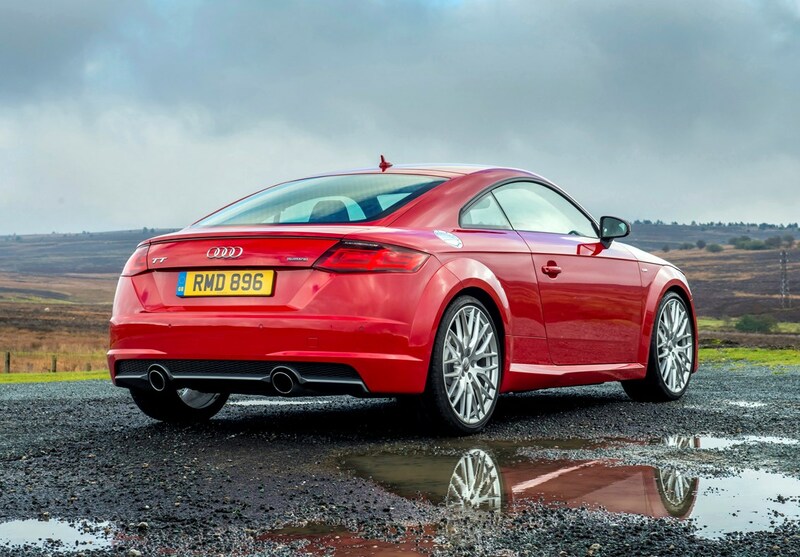 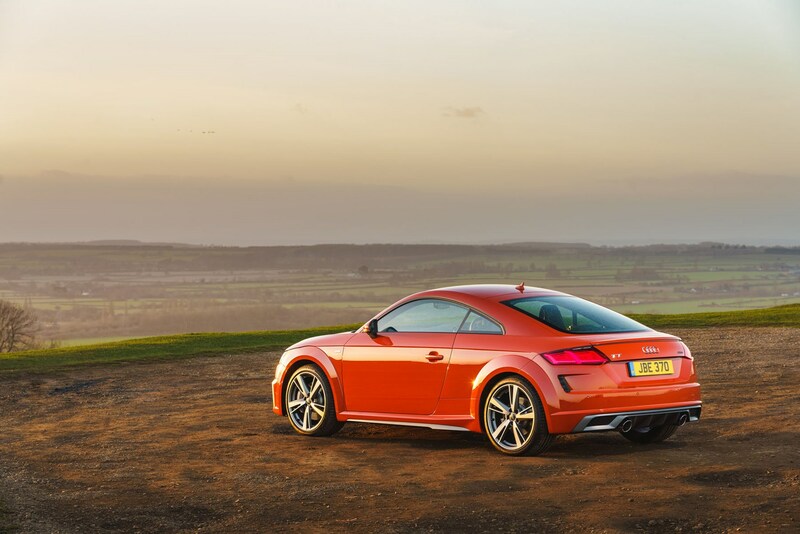 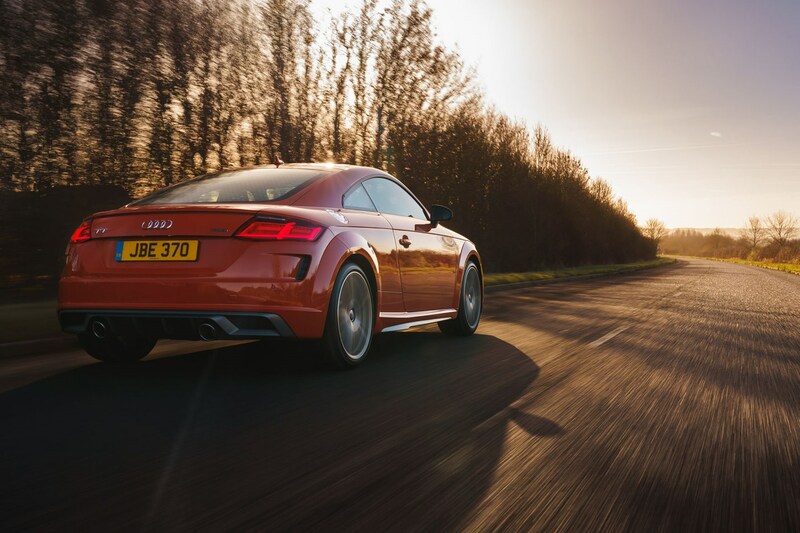 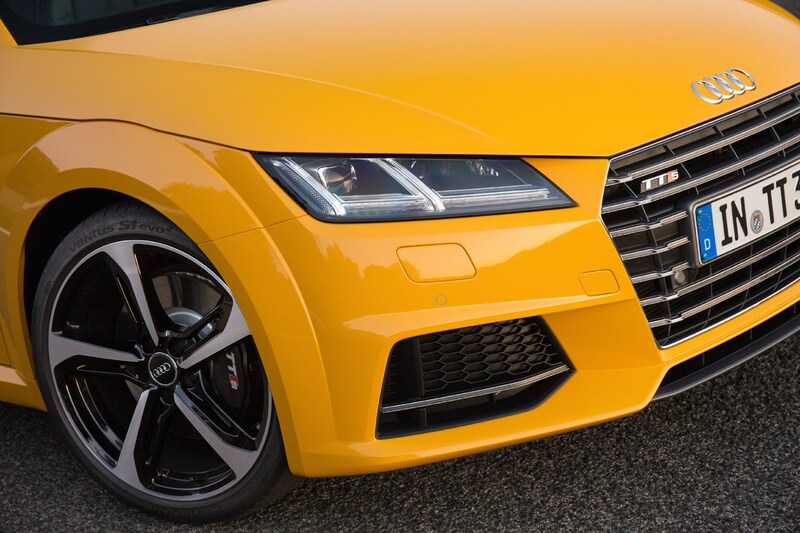 The Audi TT has a winning formula. 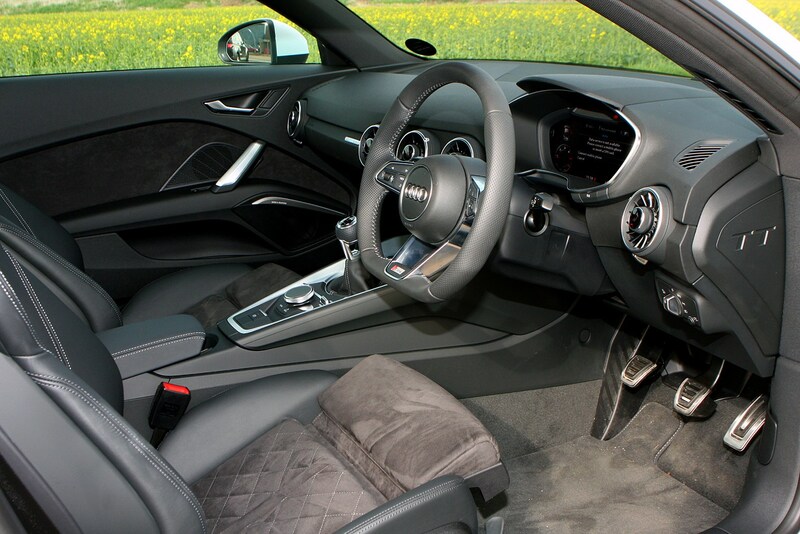 It looks fantastic, the interior is high-quality and great to spend time in, there’s a good choice of engine options and it’s enjoyable to drive. 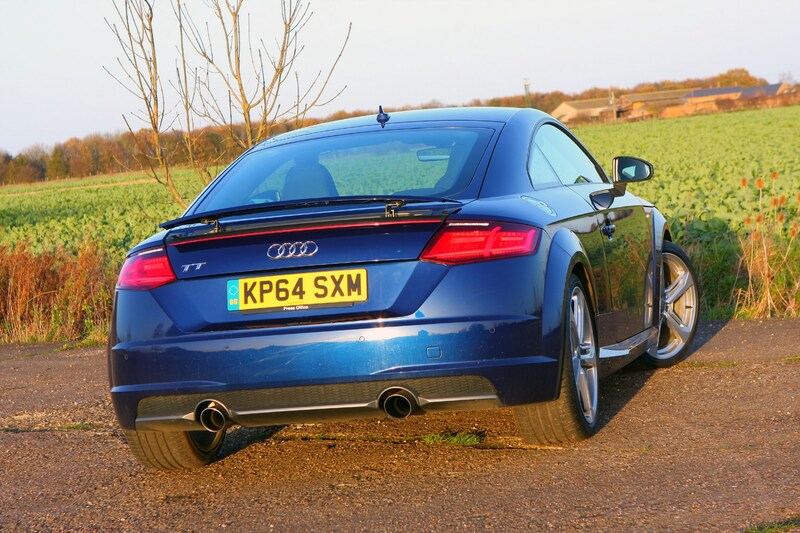 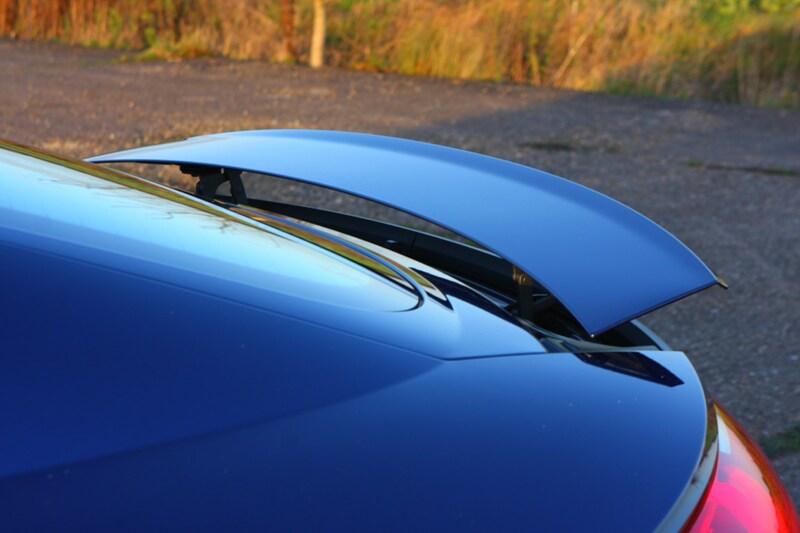 It’s not especially cheap to purchase (especially if you starting ticking boxes on the options list), but it holds its value very well indeed and quality oozes through all parts of the car. 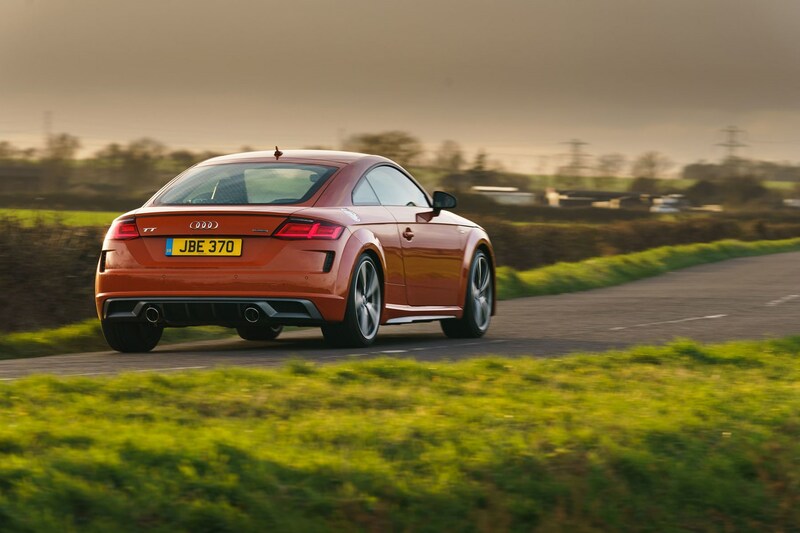 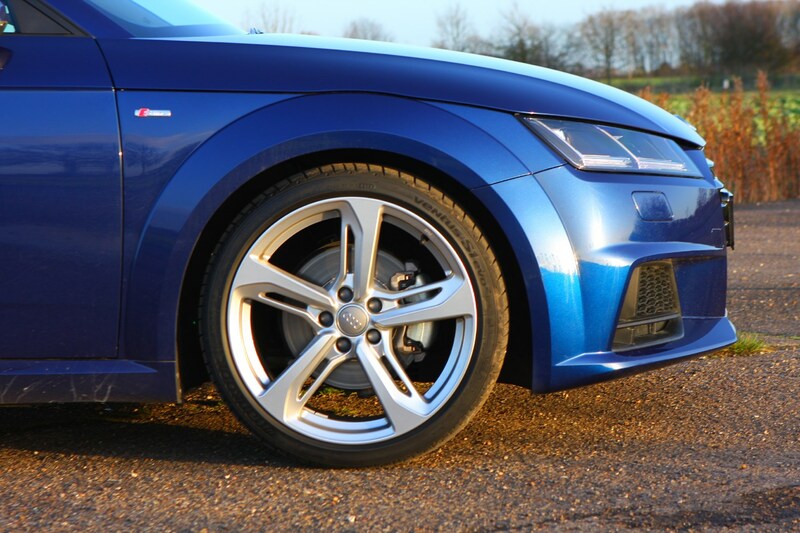 Keen drivers will love the TT RS, although it comes at a hefty premium over the rest of the range. 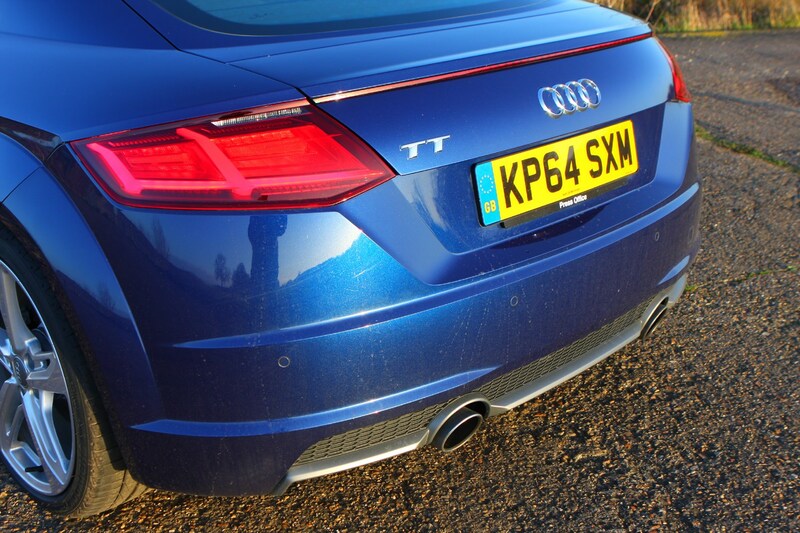 But when you consider its supercar-baiting performance, it actually looks like good value. 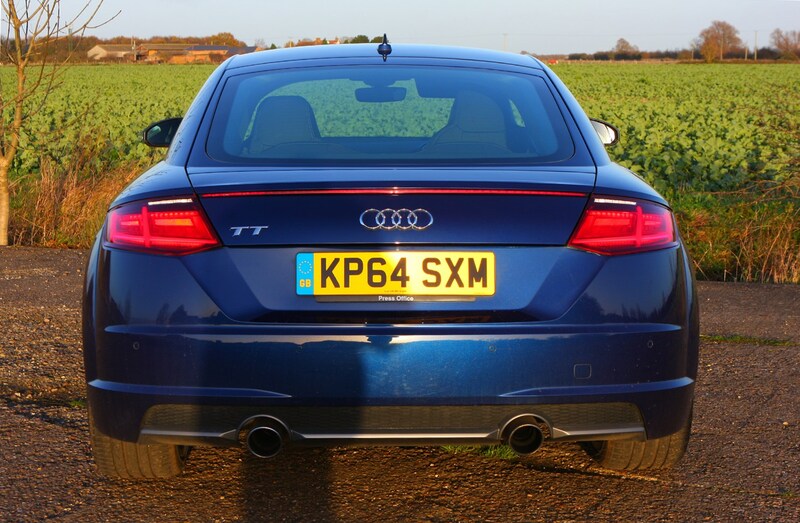 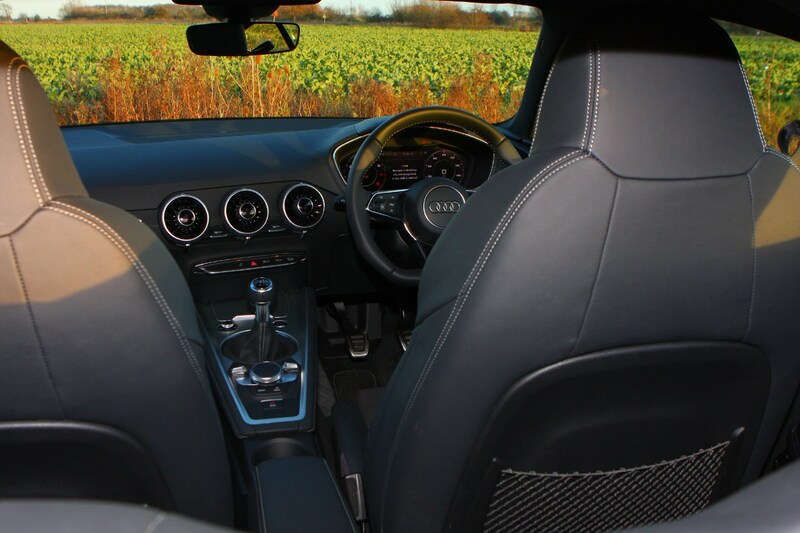 For most, though, one of the 2.0 TFSI engines will suit, feeling rapid enough when you want to have a bit of fun while remaining sensible the rest of the time.